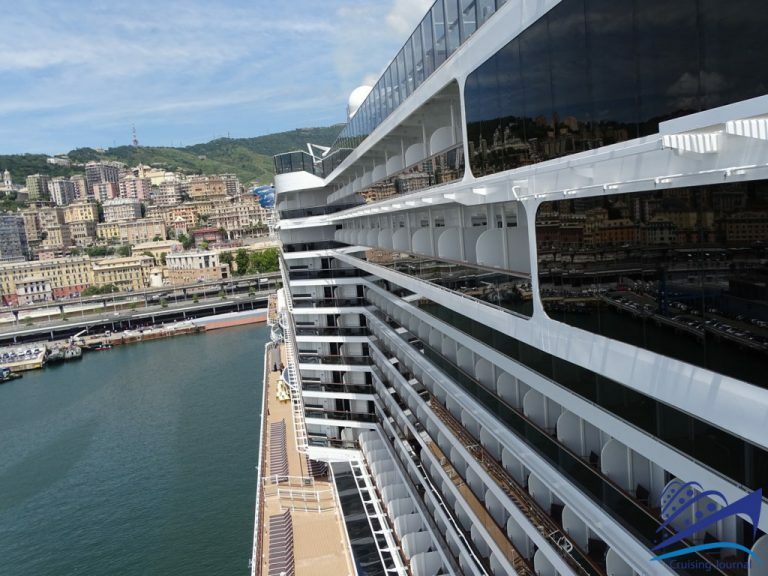 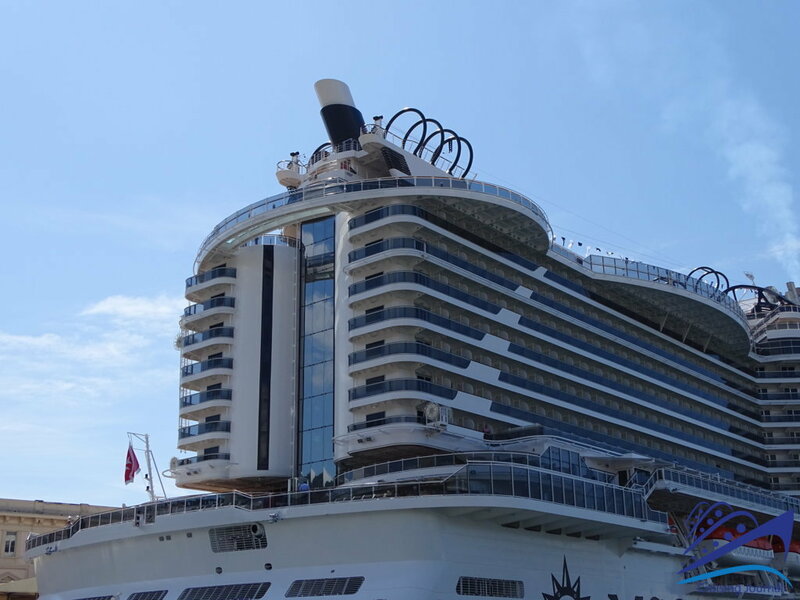 All the numbers you need on the Msc Seaview, the second Seaside-class ship built by Fincantieri, are those of a sea giant and they no longer seem to surprise us: 5331 is the maximum capacity of passengers housed in 2067 cabins and served by a crew of 1482 people. 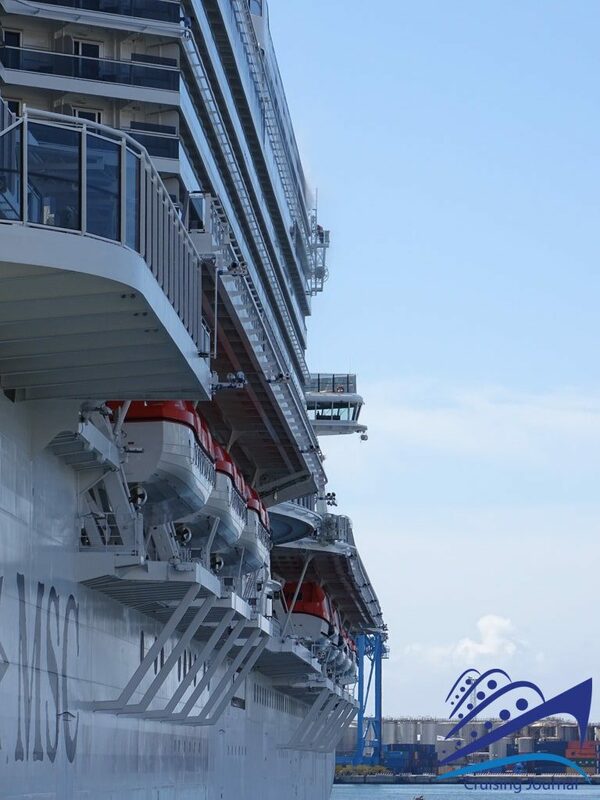 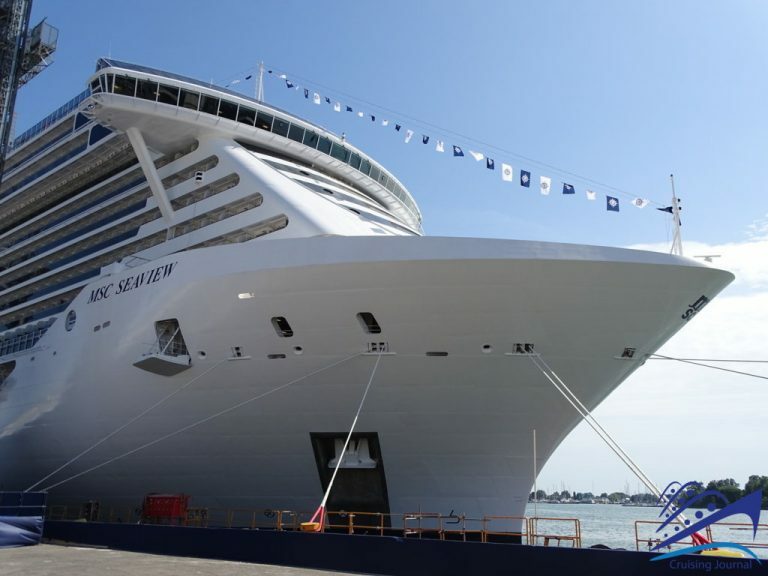 The challenge faced by Msc Cruises in the Seaside project is to succeed, nevertheless, in keeping such a high number of passengers in constant contact with the sea. 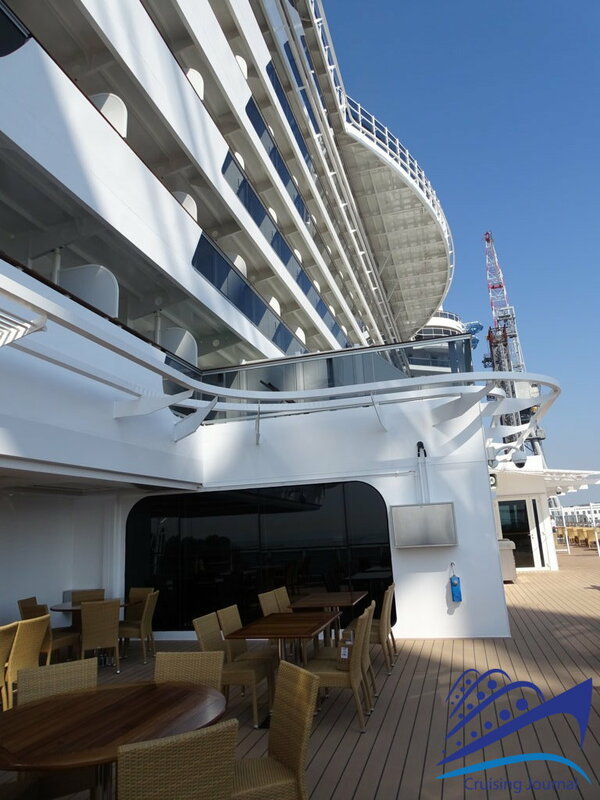 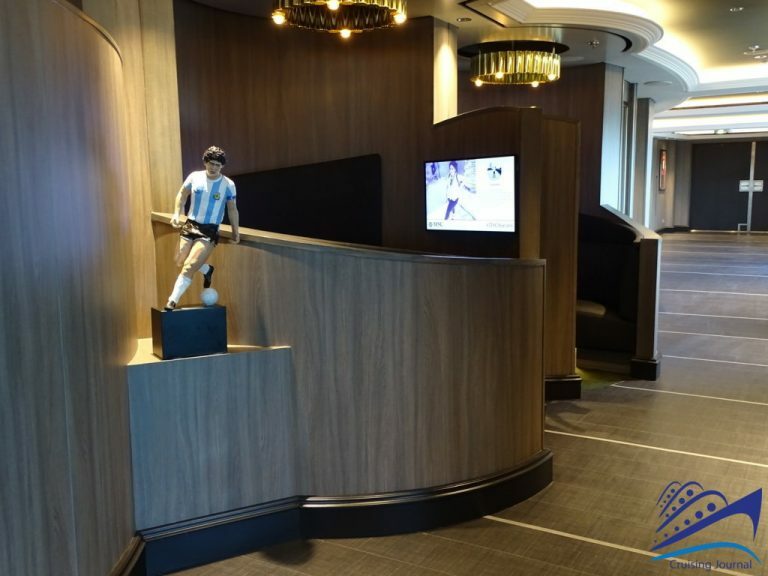 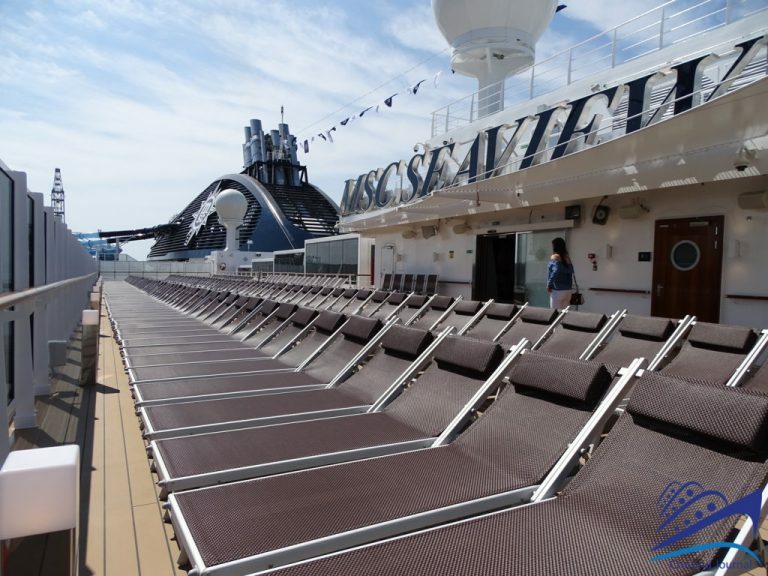 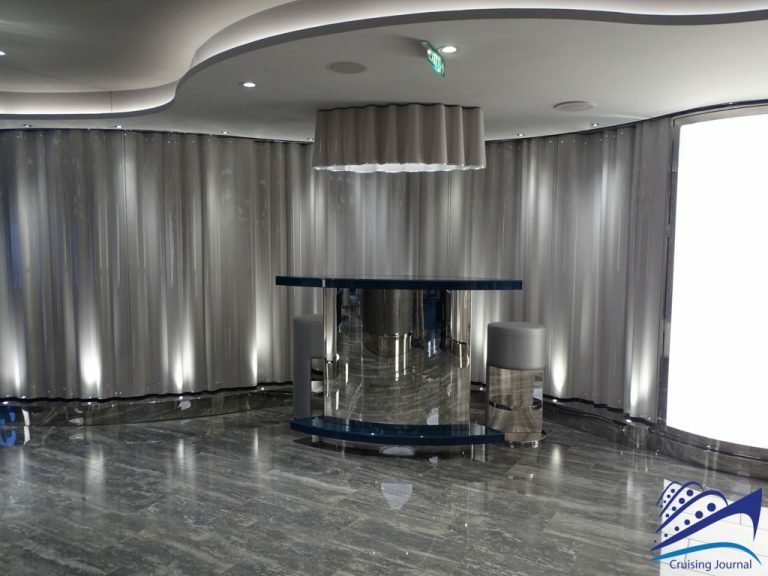 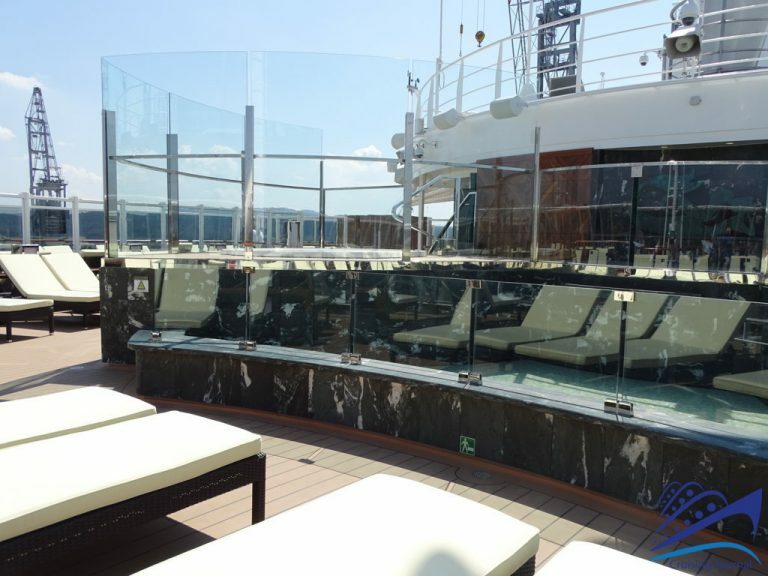 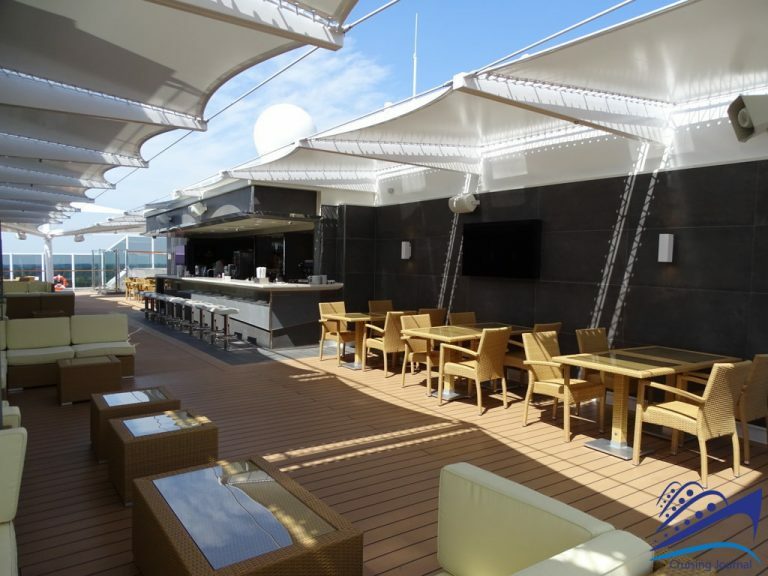 Indeed this goal has been reached on Msc Seaview where every corner of the ship is immersed in sunlight and the guests are offered panoramic views to the horizon. 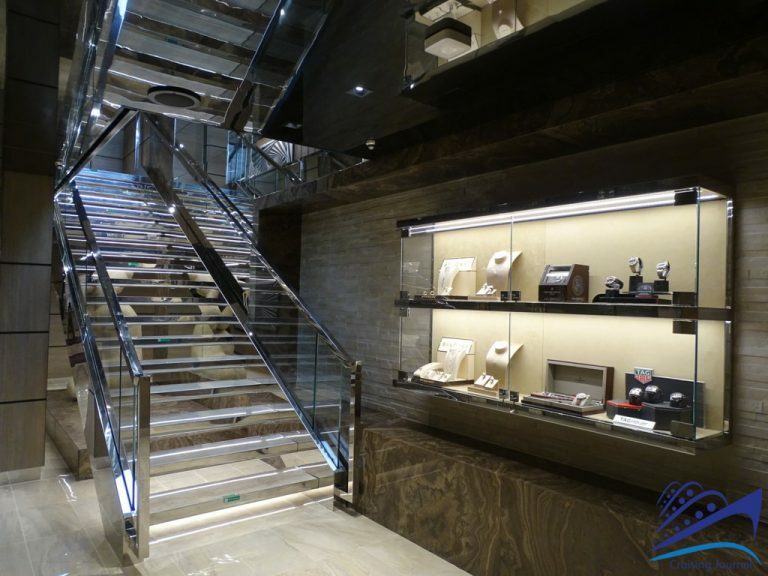 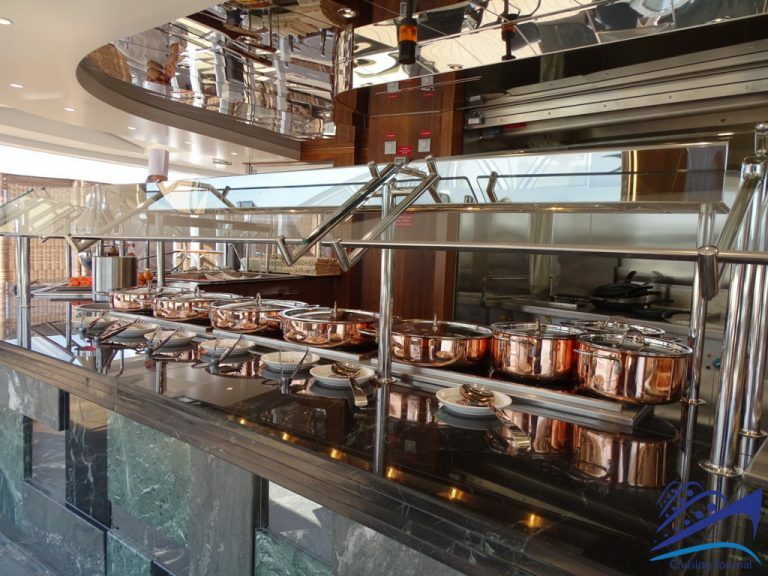 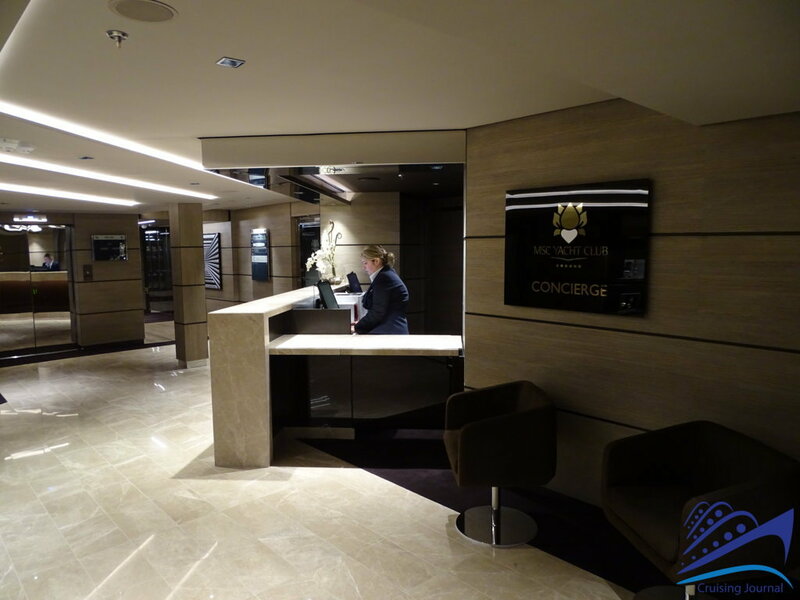 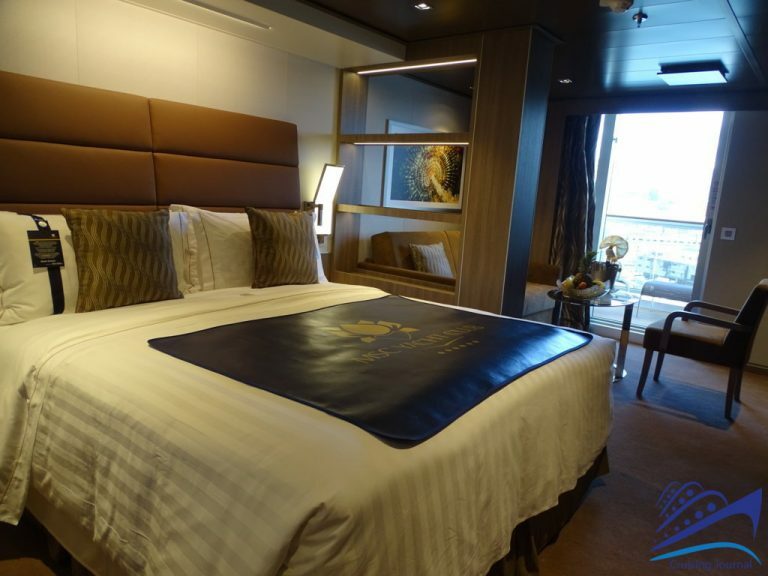 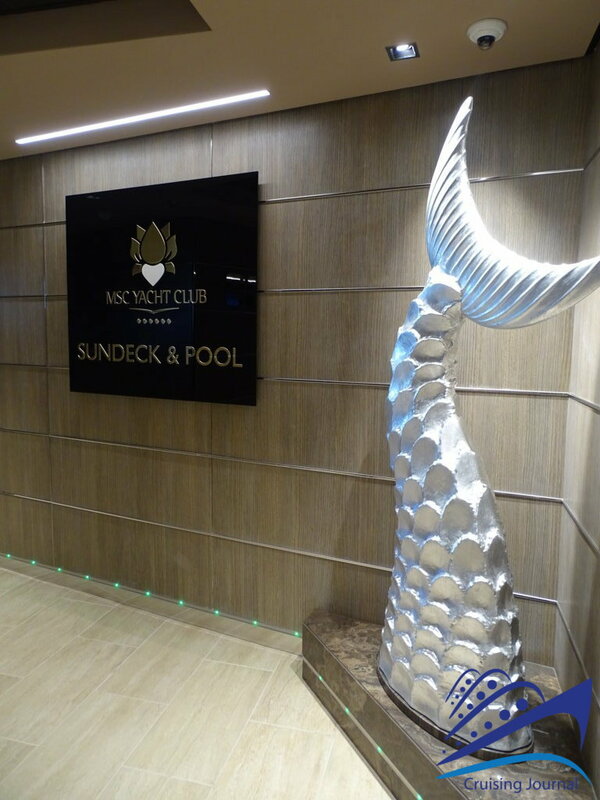 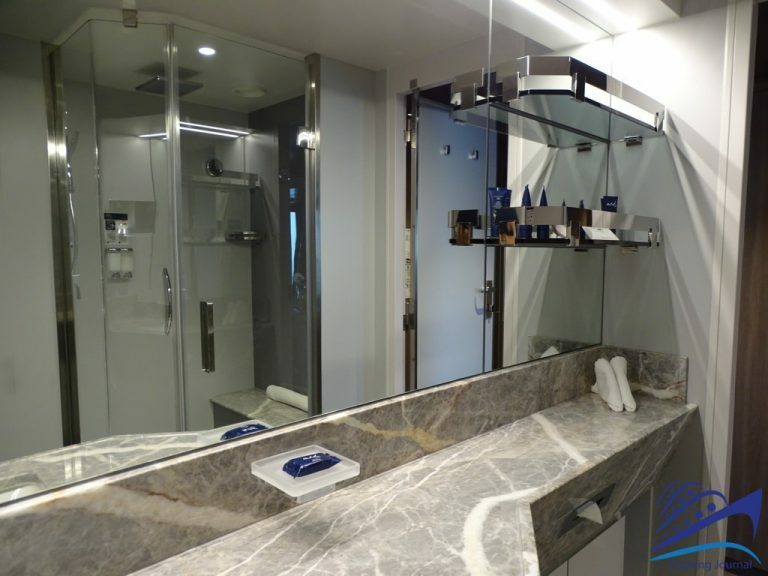 Practically everything that a state-of-the art ship can offer is found on board the new MSC flagship. 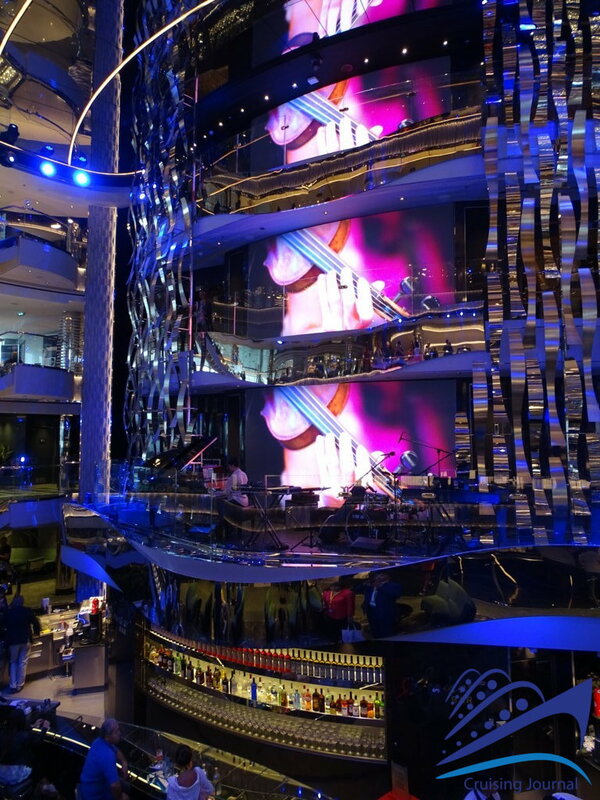 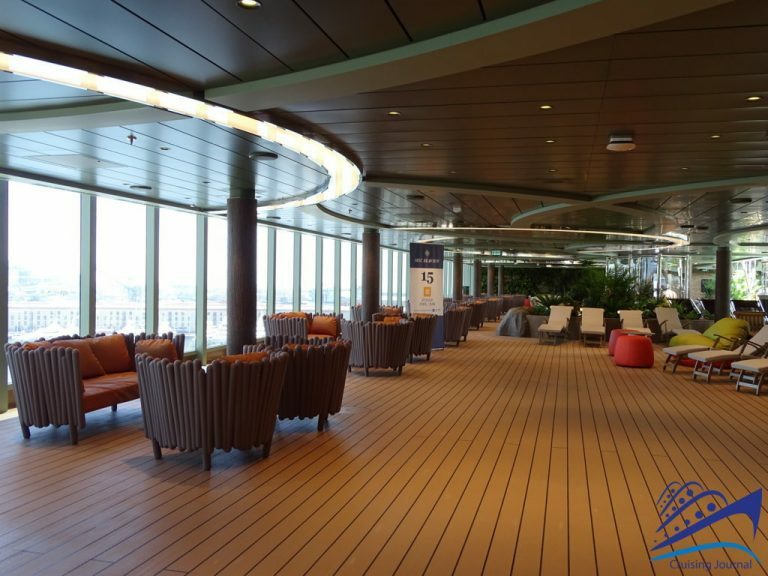 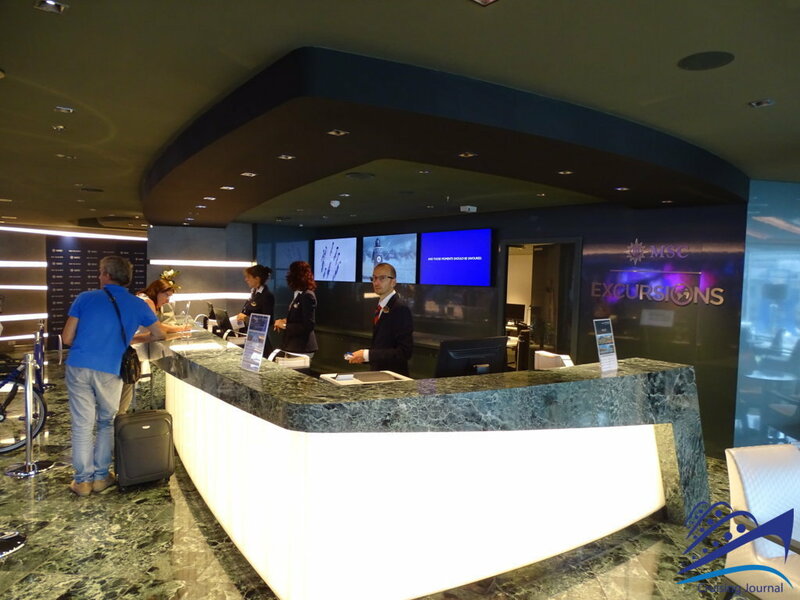 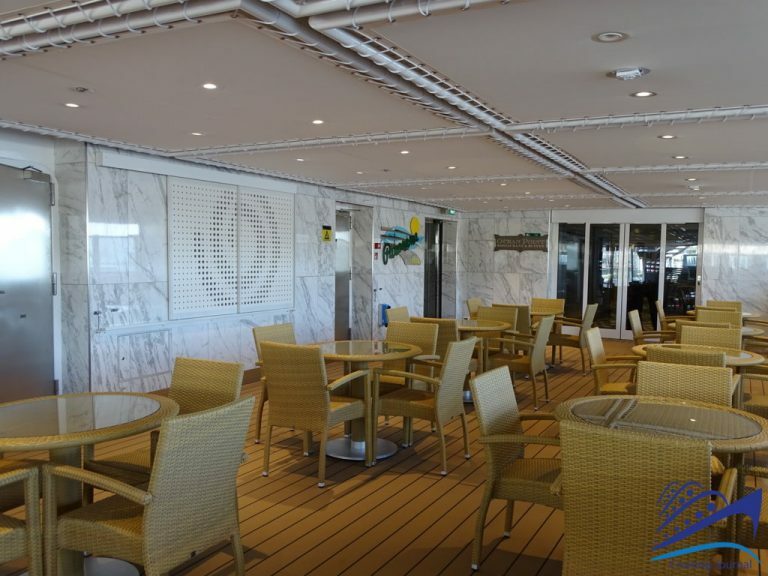 Most of the common spaces are located on the four central decks (from the 5th to the 8th) including the main restaurants, several lounges, shops, and services of various kinds. 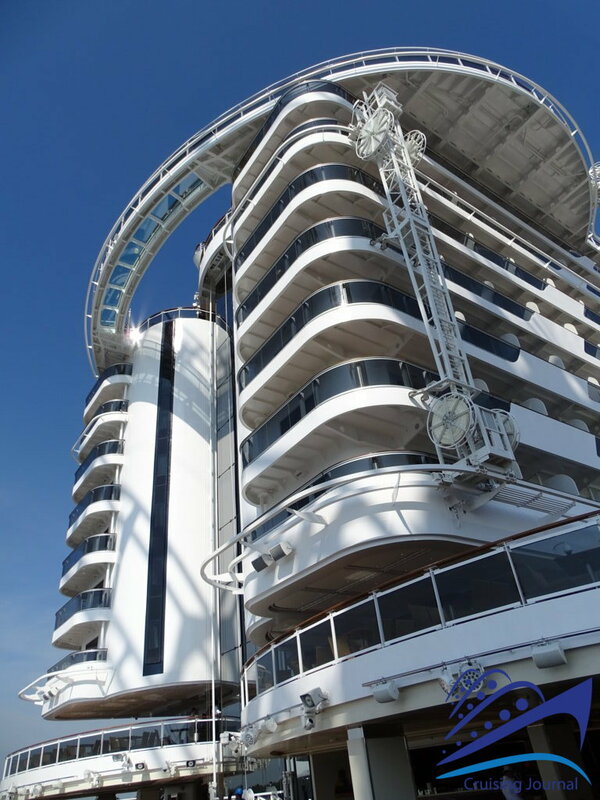 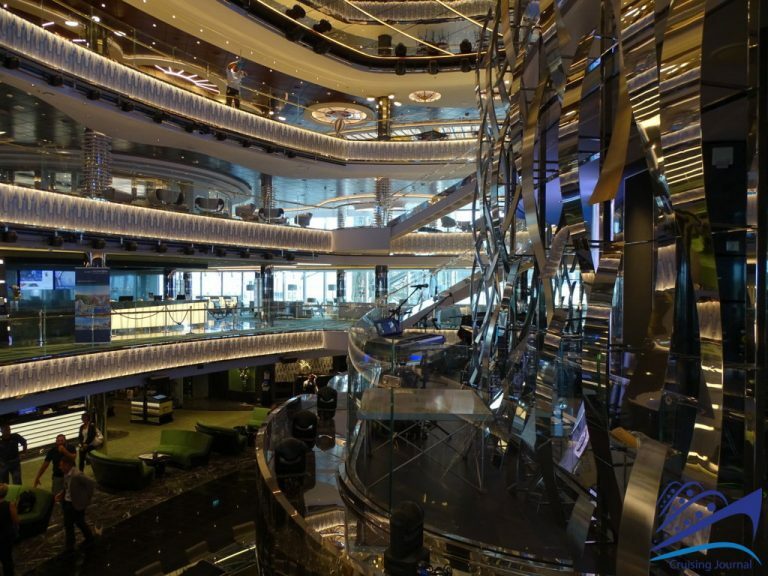 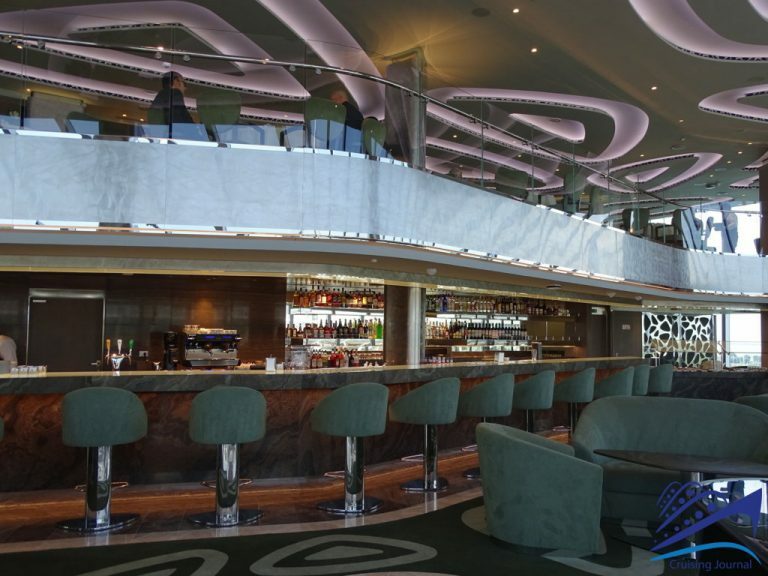 The Atrium is the place where the 4 levels merge in a spectacular whirlwind of staircases and balconies overlooking the Seaview Bar, the hub of the ship and the ideal place for a morning coffee or an evening drink. Now let’s go by order and explore all the facilities and common spaces available for the guests, each one with their own special characteristics but at the same time all having a modern and elegant design inspired by brightness and contact with the outside. 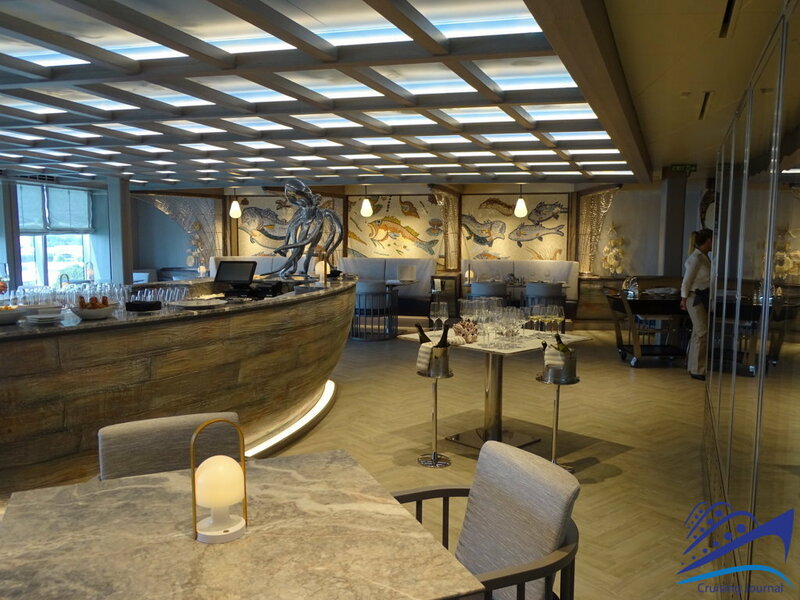 The aft end of Deck 5 houses the Golden Sand Restaurant, one of the main dining venues together with the Silver Dolphin, similar in size and furnishings, located just above it. 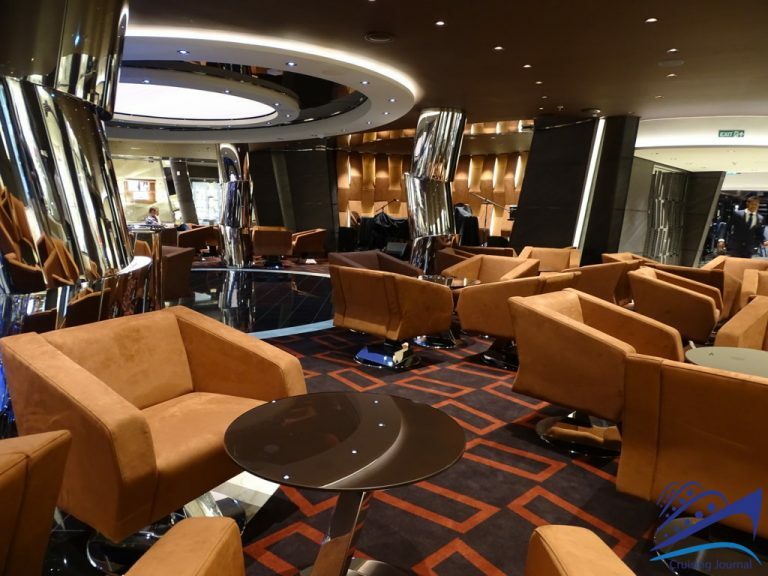 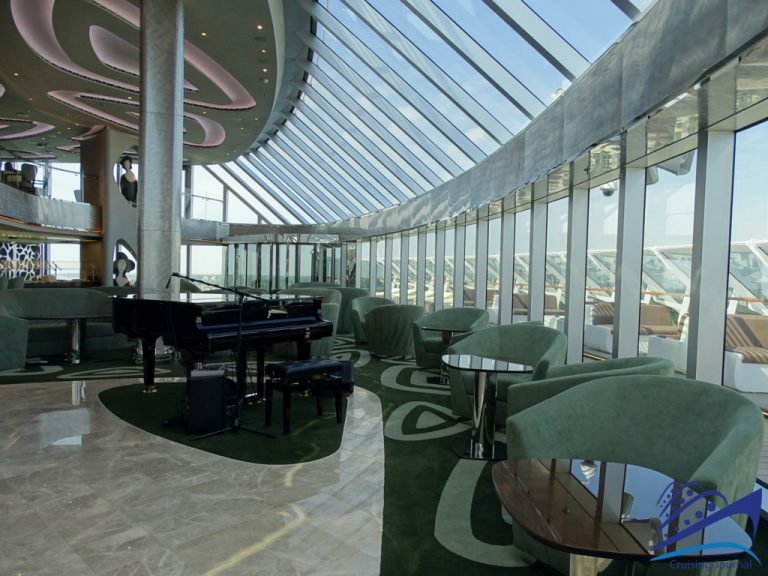 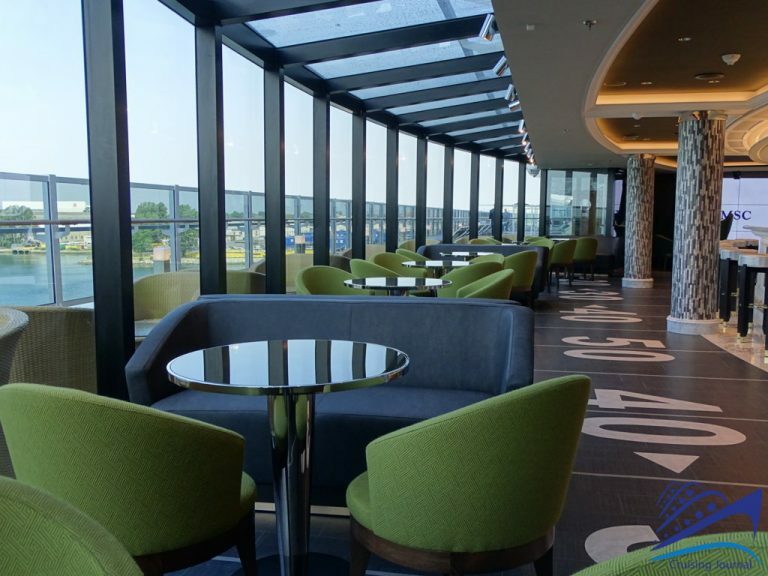 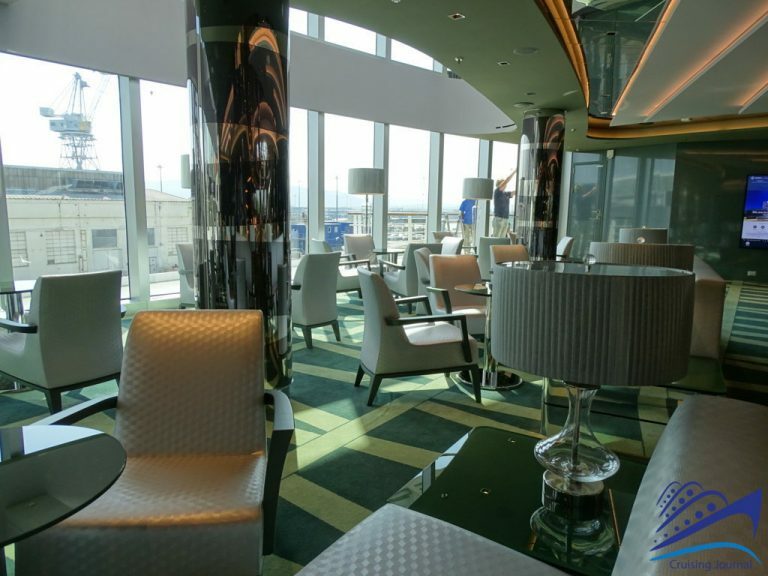 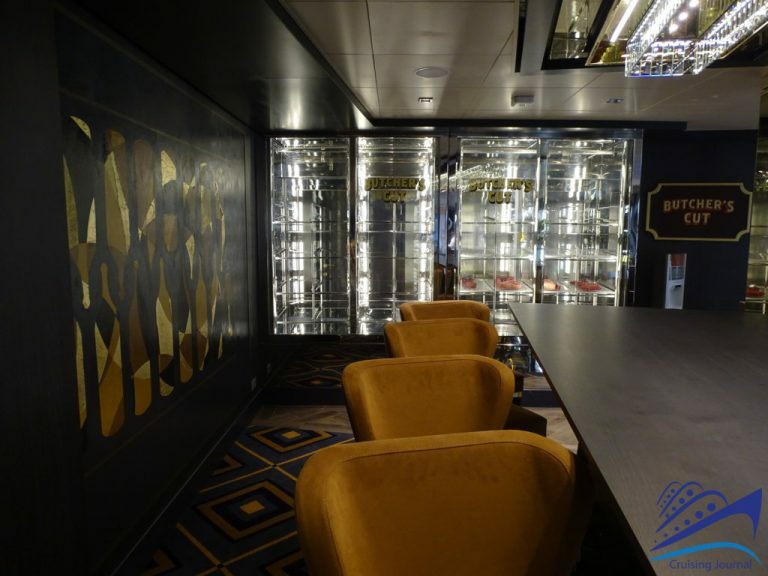 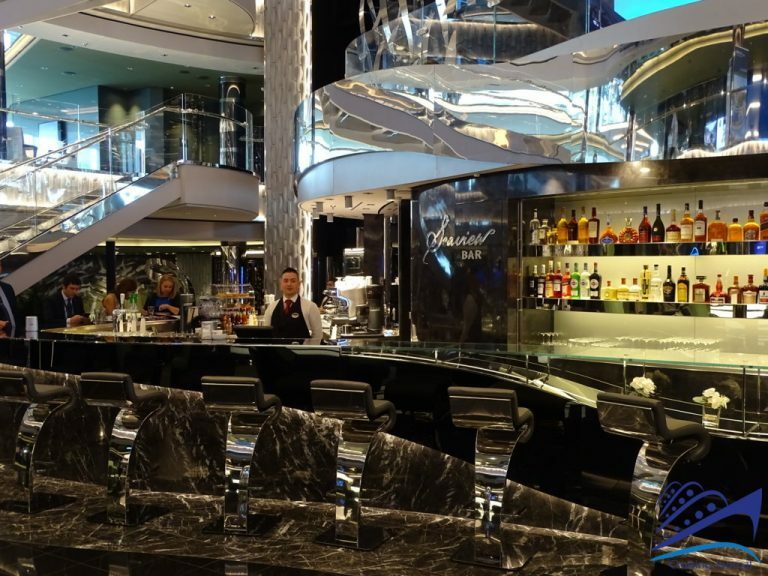 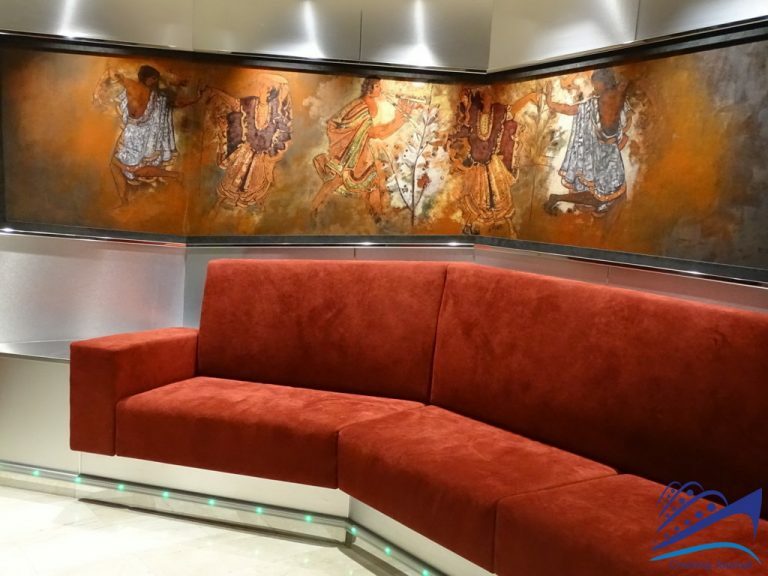 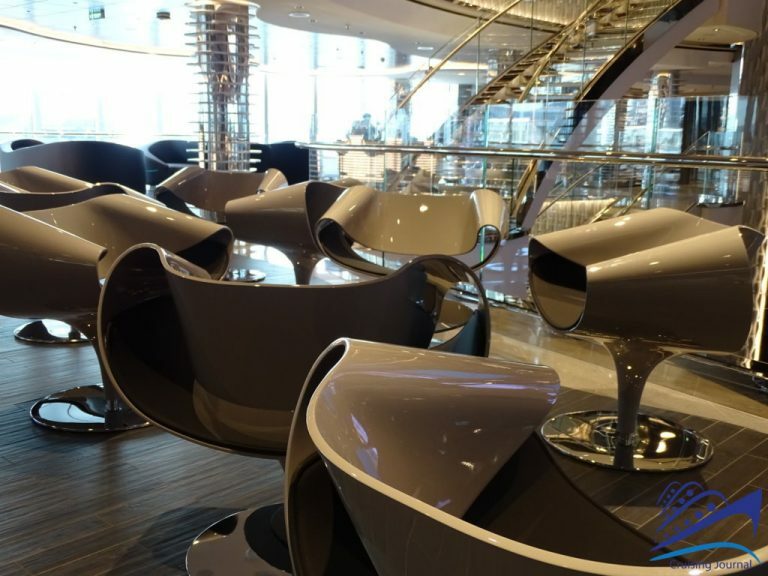 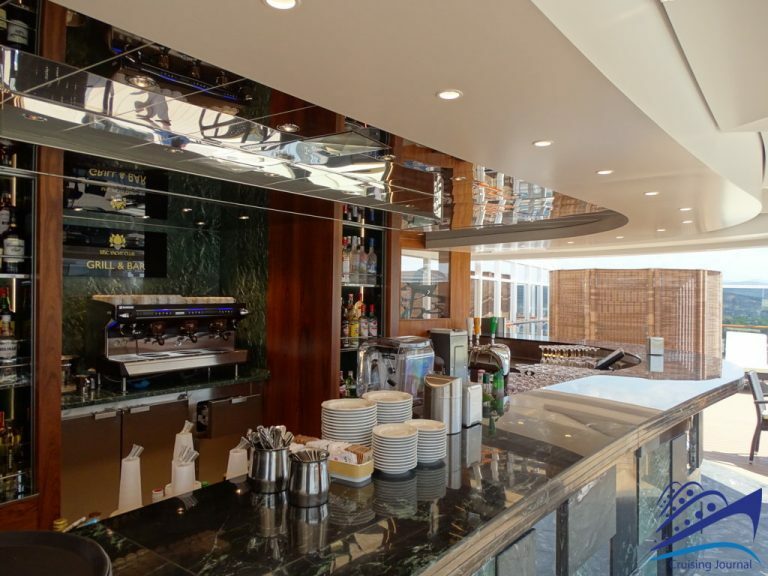 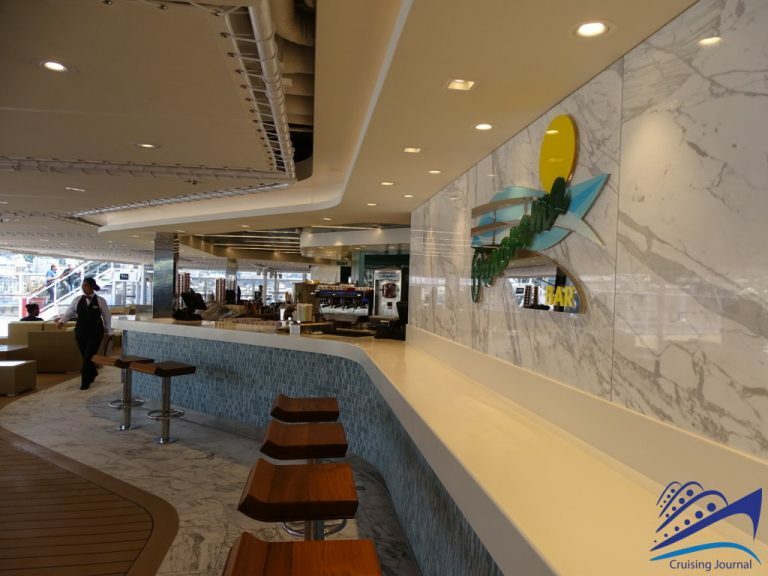 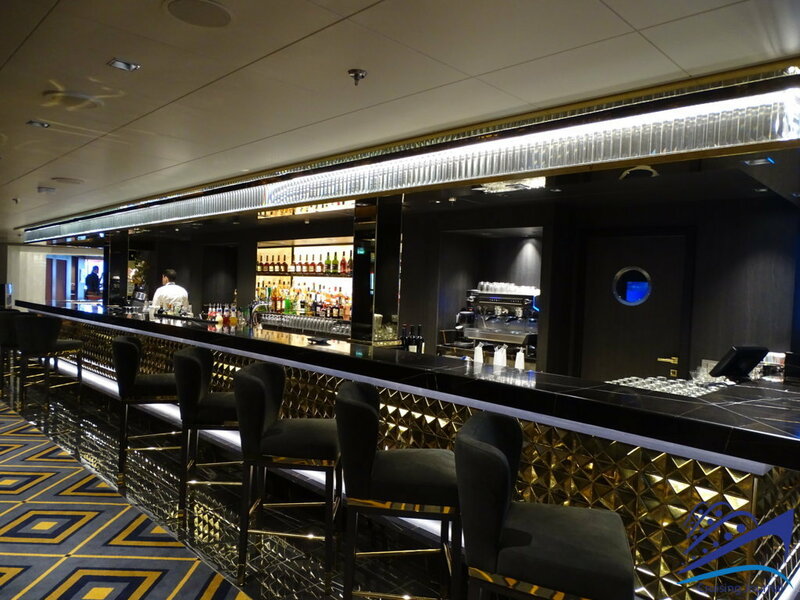 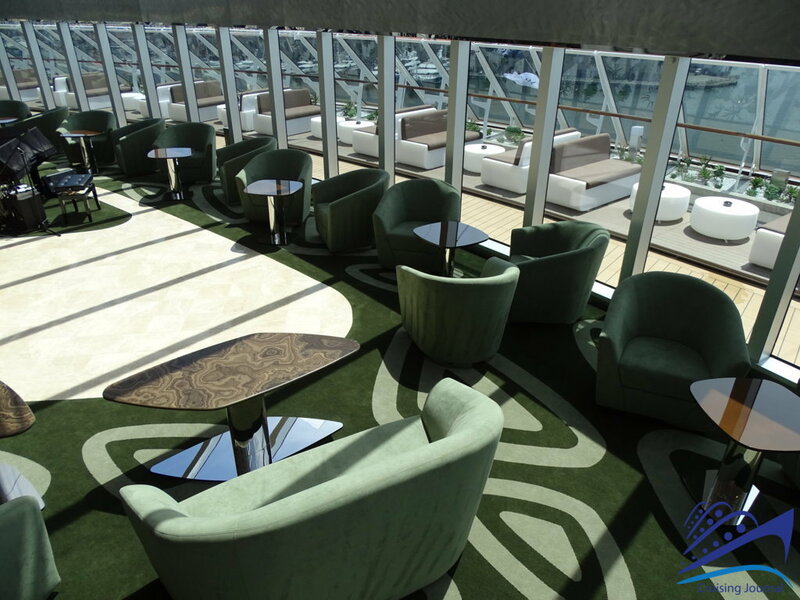 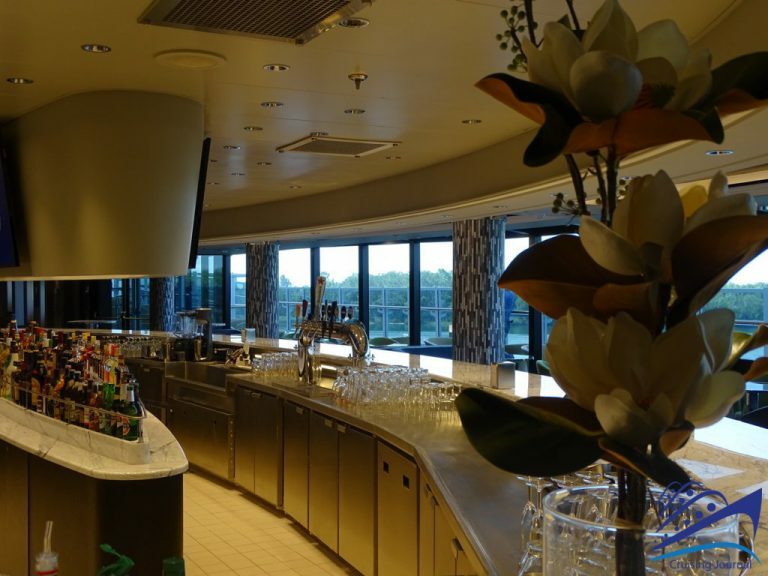 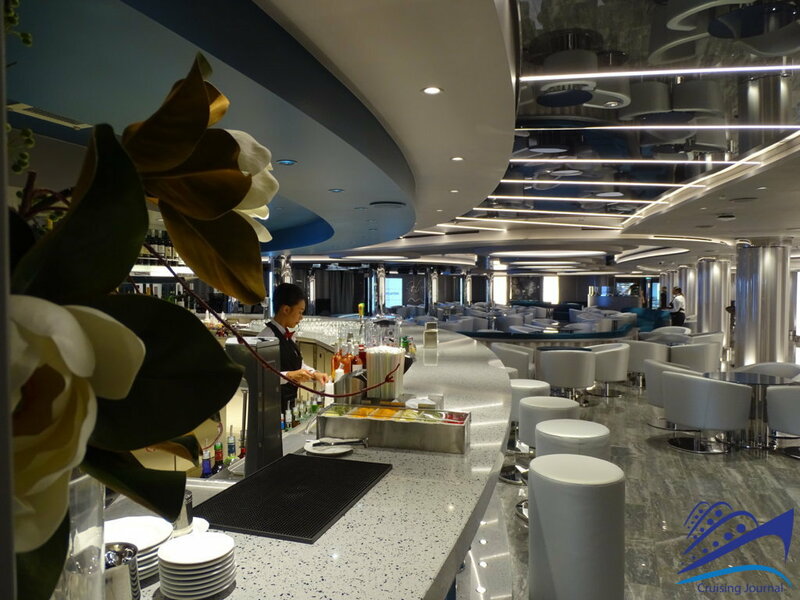 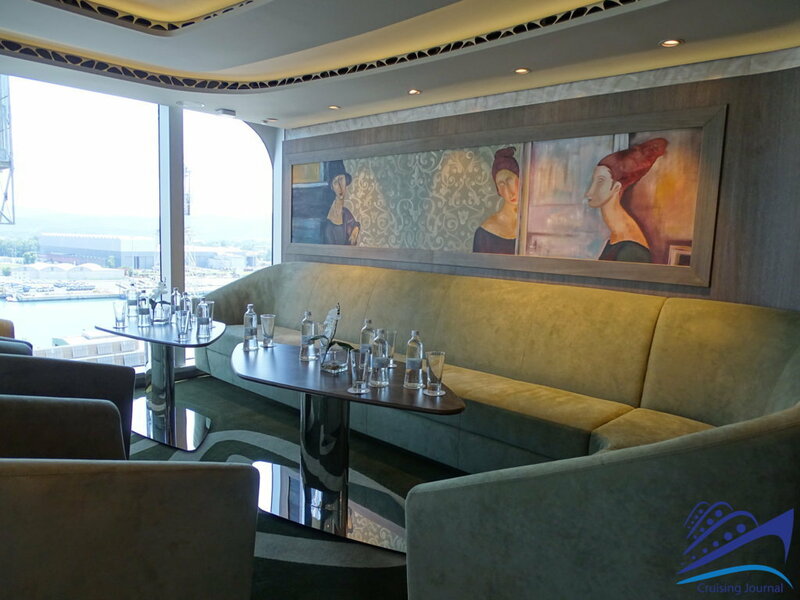 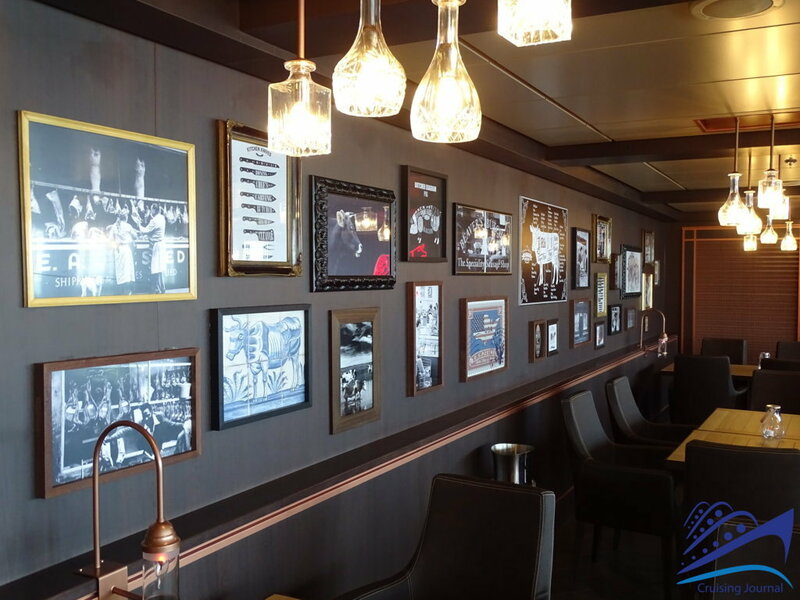 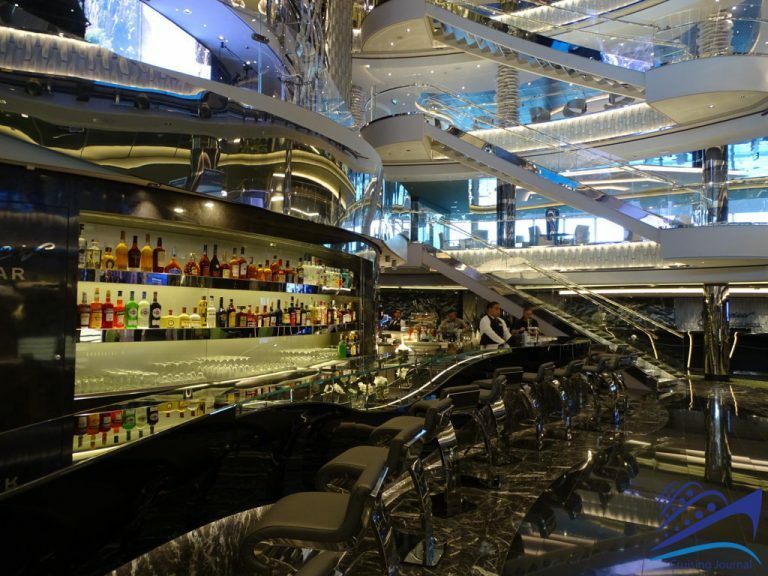 The previously mentioned Seaview Bar is the heart of the ship: it is located under a series of balconies that make up the Atrium and is the ideal meeting place at any time of the day. 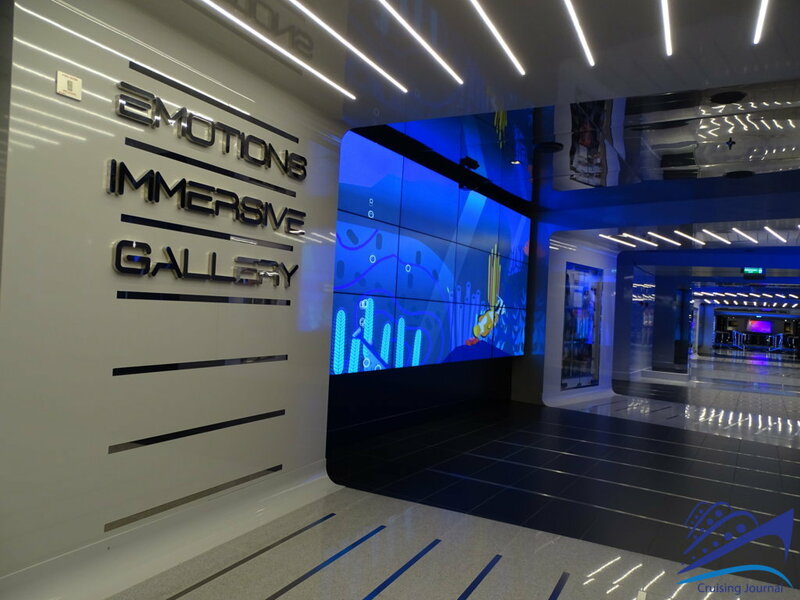 Guest Services and the digital Photo Gallery complete the Atrium. 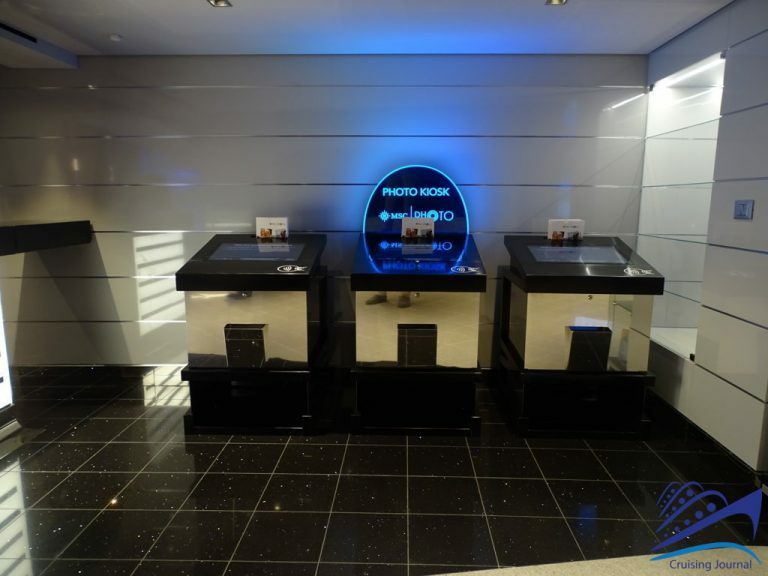 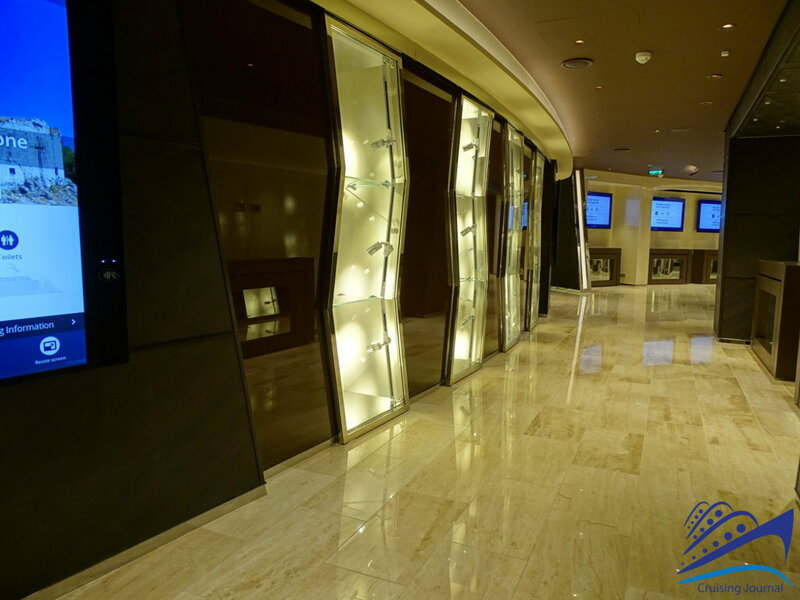 The corridor leading to the Art Gallery is in fact a walk through the photos: in the Immersive Photo Gallery, the passengers can look for themselves in the digital photos shown on the large screens. 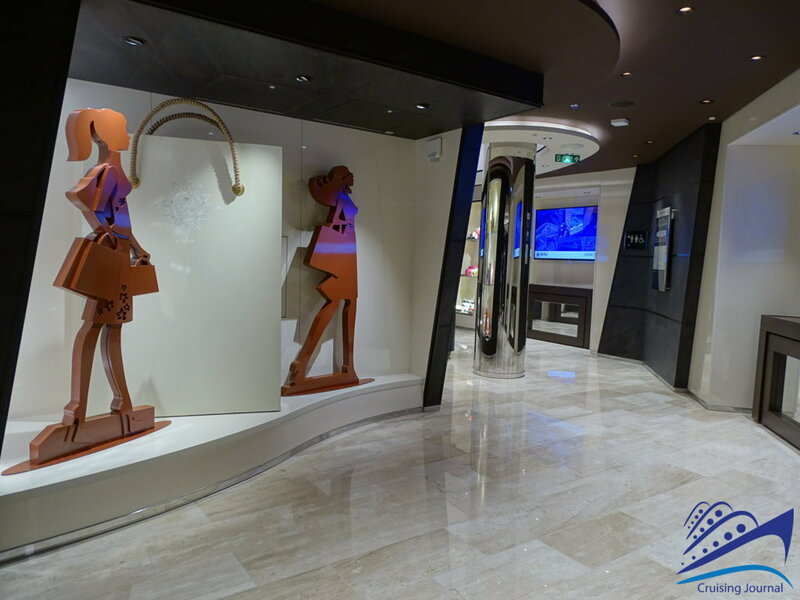 A little further down is the Art Gallery displaying paintings and works of art in a modern essential setting. 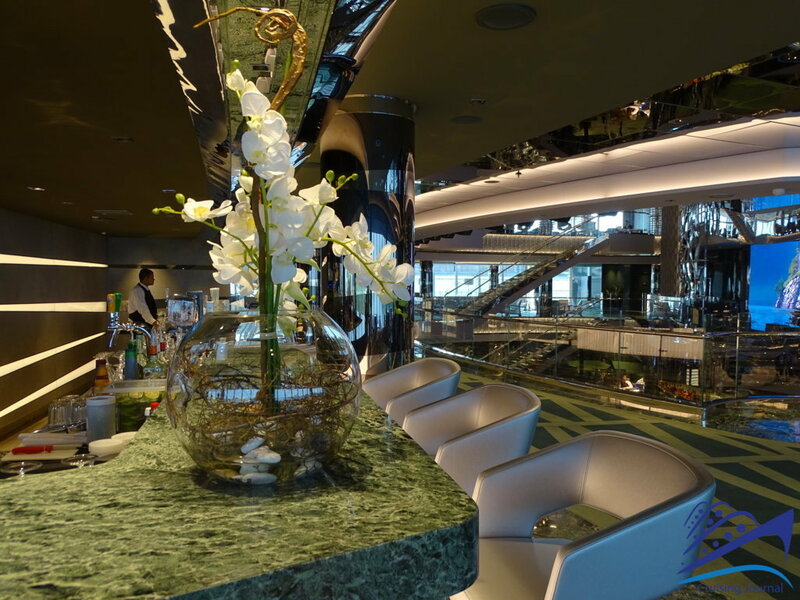 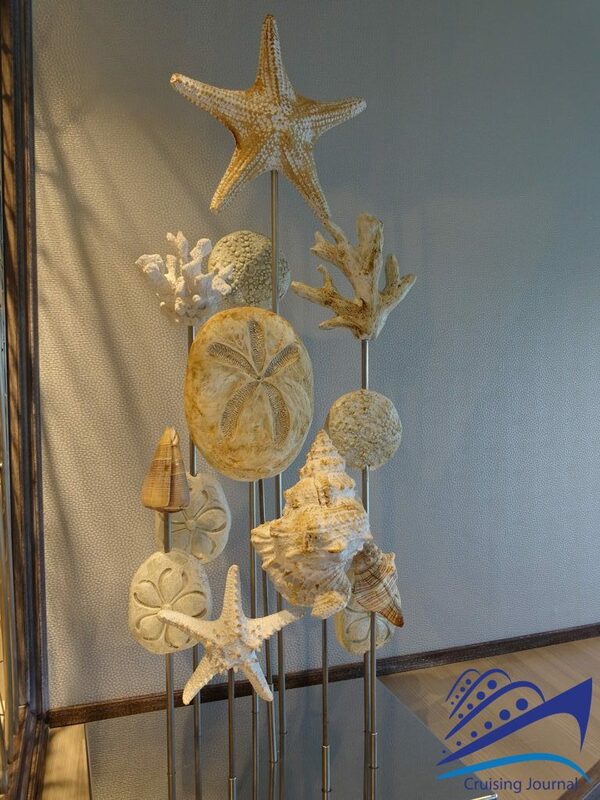 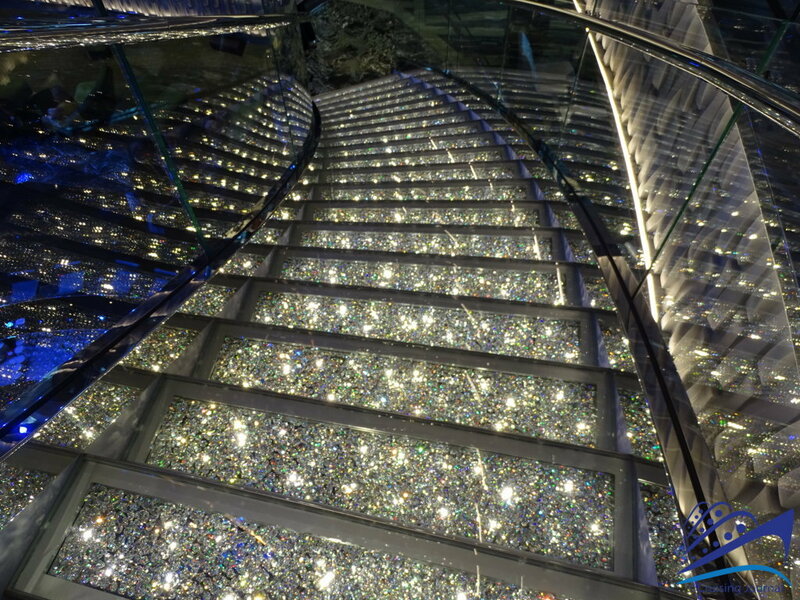 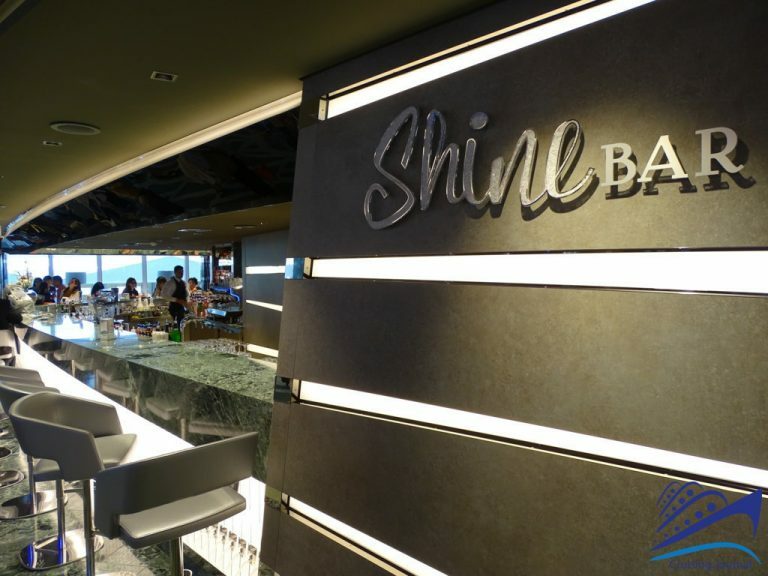 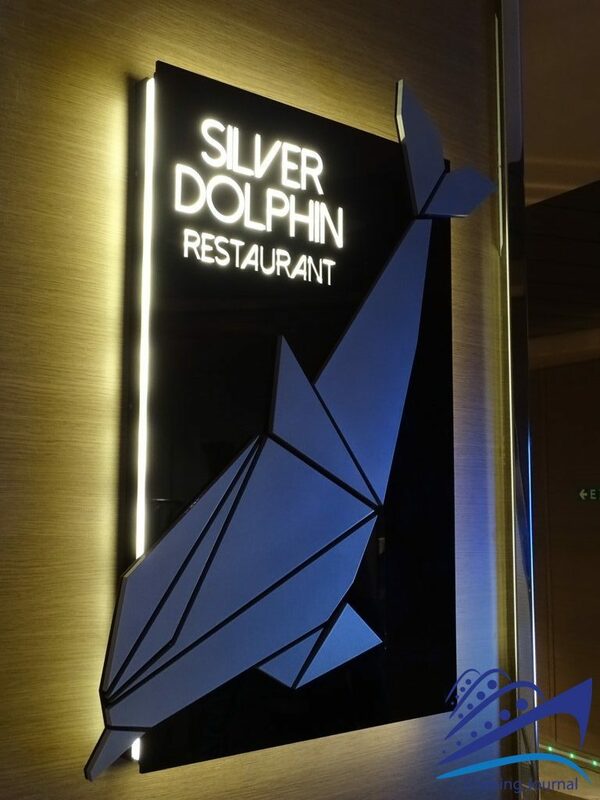 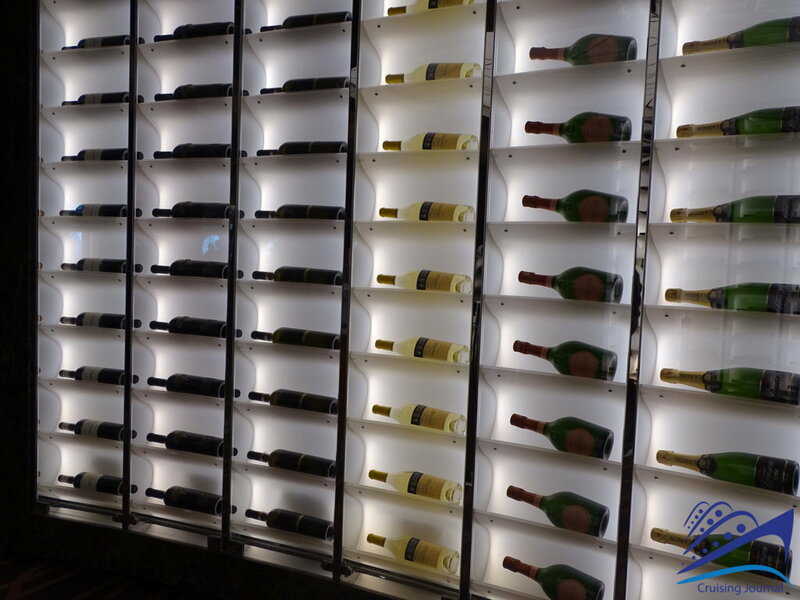 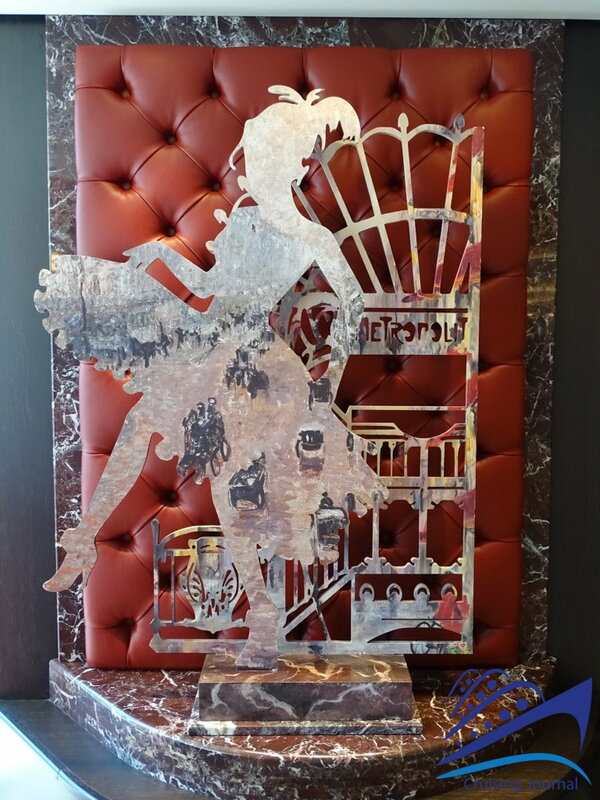 Going up to deck 6, you’ll find the charming Shine Bar near the exit of the Silver Dolphin Restaurant. 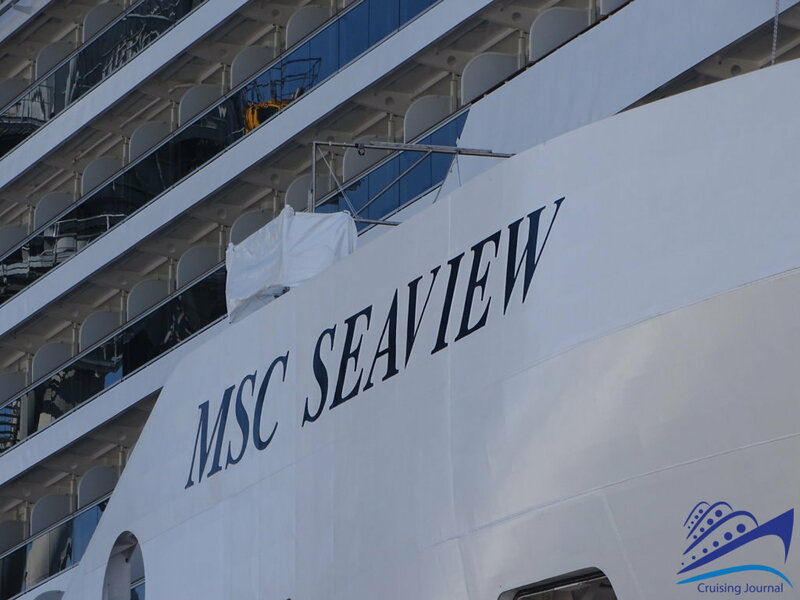 With its floor-to-ceiling windows overlooking the sea, it represents the key concept of Msc Seaview: an essential but elegant style that lets the outside in and is in constant relation with the surroundings. It is one of the most popular places to enjoy an aperitif, accompanied by the music from the Atrium. 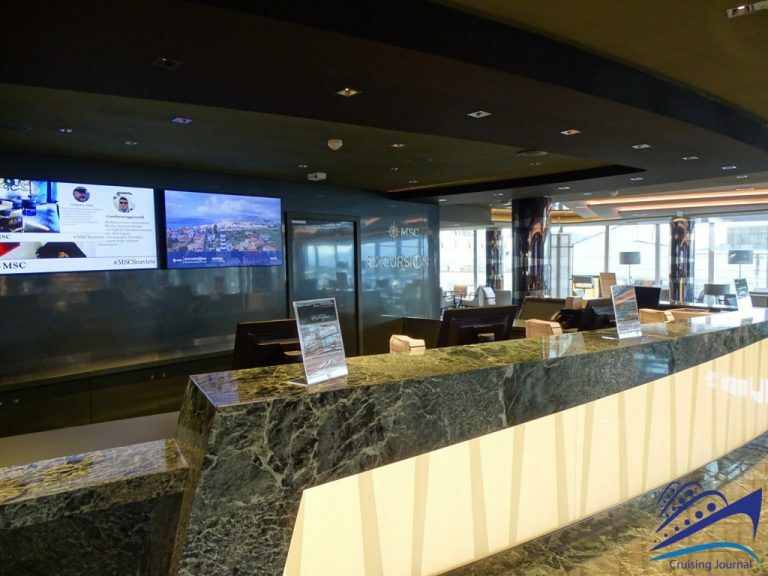 On the left, at the Excursions Office, you can purchase one of the many tours that the company offers in all ports of call. 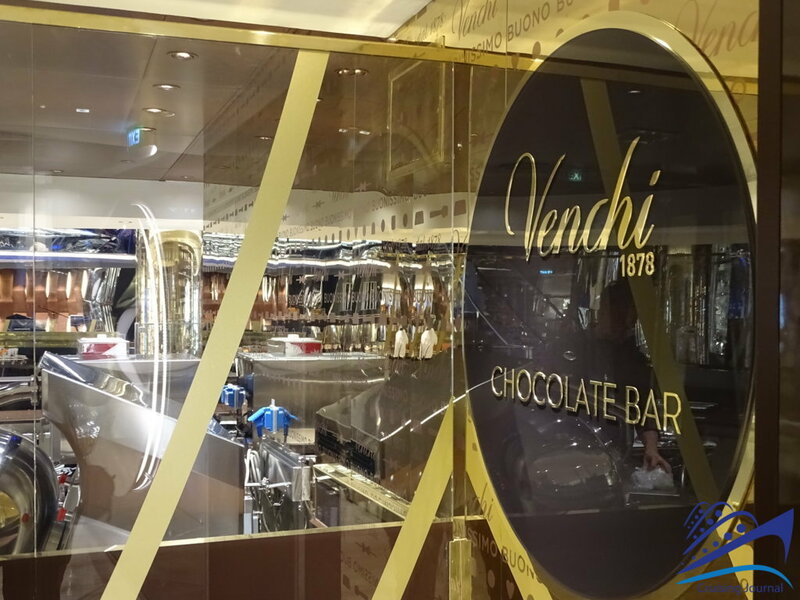 Moving towards the center of the ship you will find a true paradise for chocolate lovers, the Venchi Chocolate Bar. 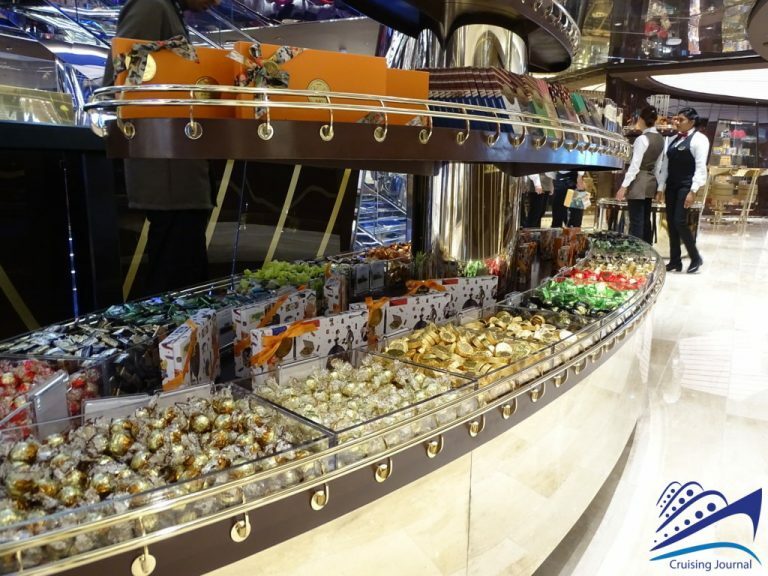 On board the Msc Seaview, the famous Turin brand offers an assortment that goes from coffee to pralines, in a cozy and sleek ambience, complete with a chocolate fountain where you can indulge now and again. 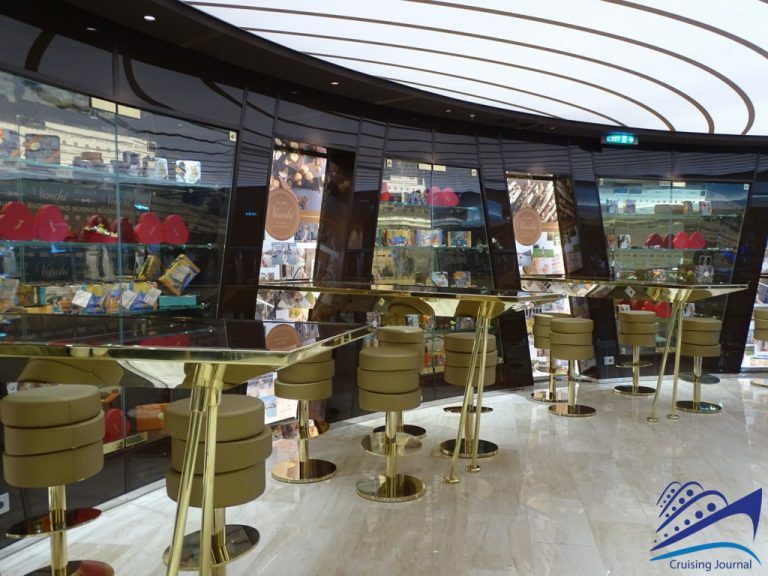 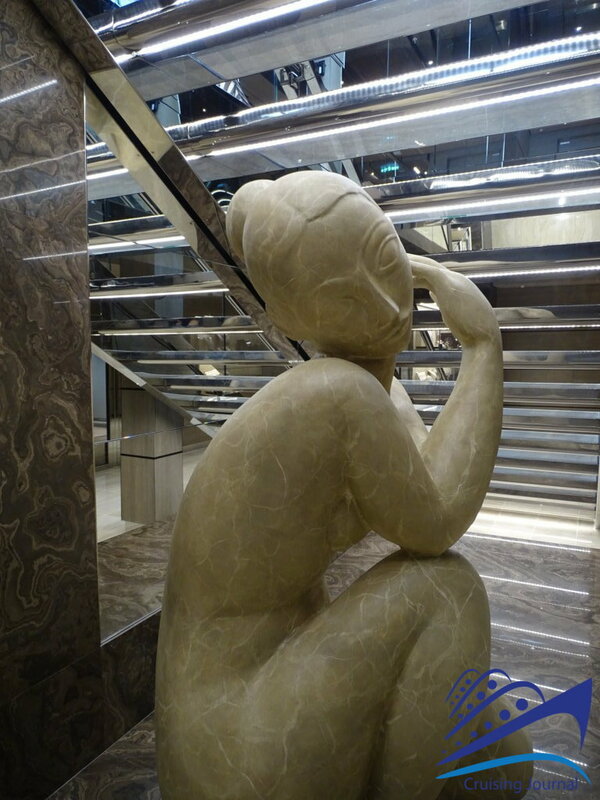 The Venchi Bar overlooks Piazza Grande, a pleasant place to walk around and admire the shop windows of the Mini Mall, which includes clothing, perfume and jewelry shops. 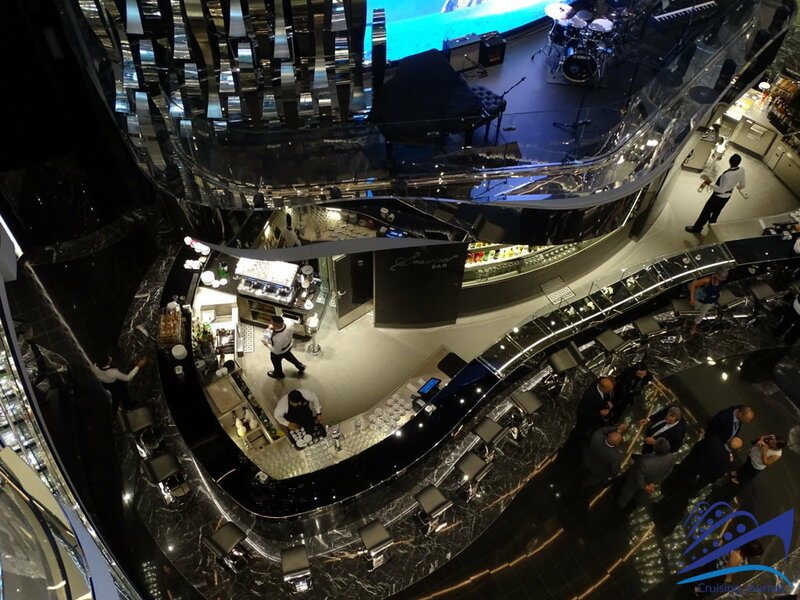 Just beyond the shopping area, you will reach the main seating area of the Odeon Theatre, with its incredible variety of live shows that are part of the extensive entertainment program offered by MSC. 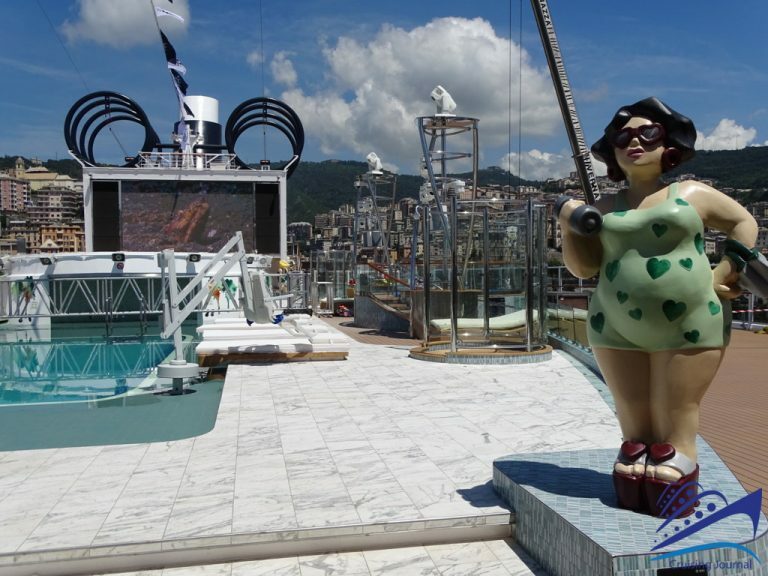 Deck 7 on aft end is home to the spectacular Sunset Beach Pool. 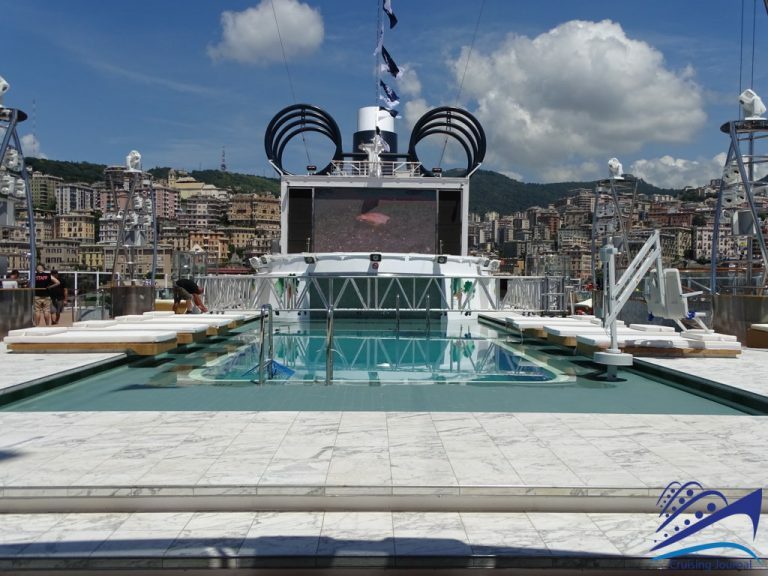 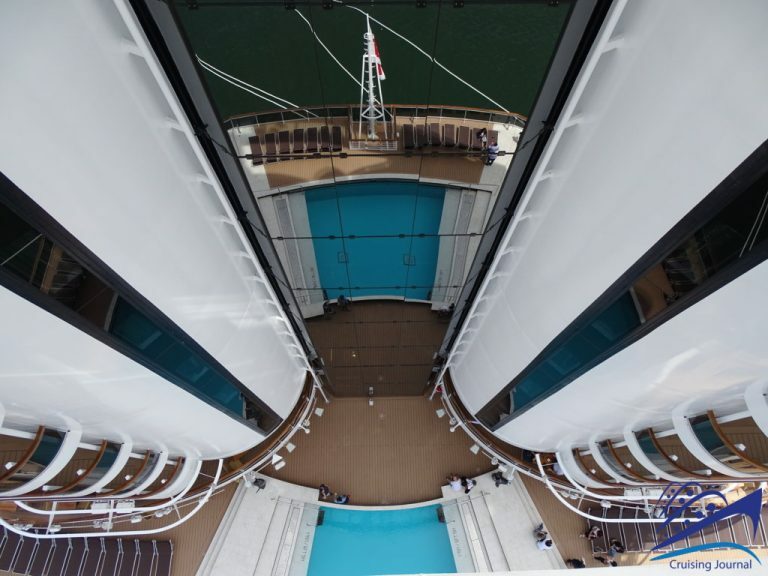 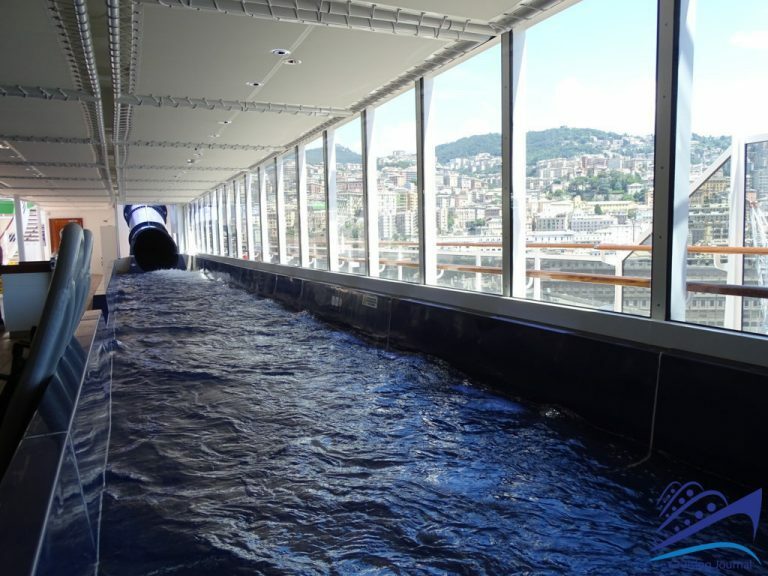 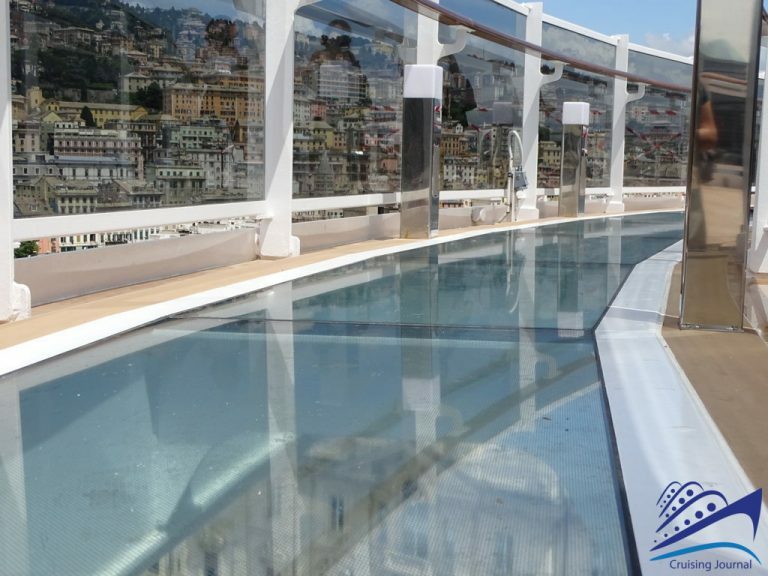 This swimming pool, suspended over the wake of the ship, offers you the panoramic beauty of nature and sunsets on one end, whereas turning towards the ship you can admire the imposing grandeur of Msc Seaview, looking up to the highest of the decks and the Bridge of Sighs catwalk. 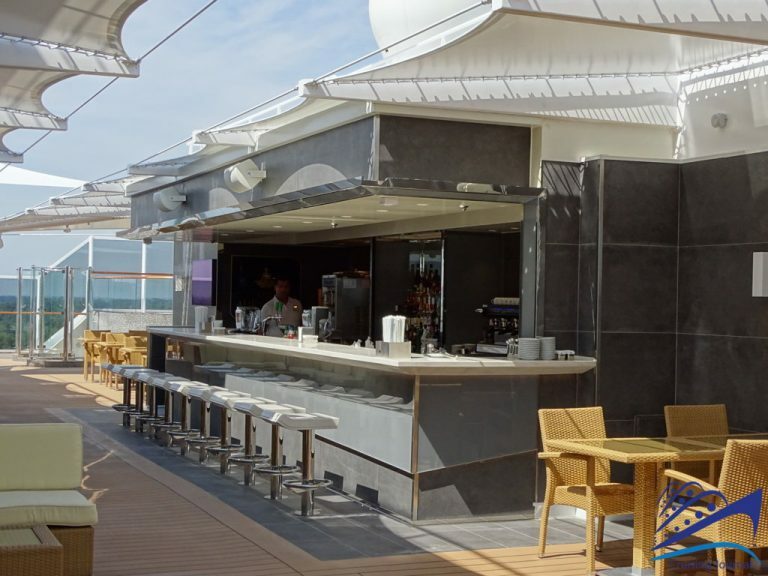 The poolside Sunset Beach Bar stays open until late and on summer evenings, it becomes an open-air discotheque. 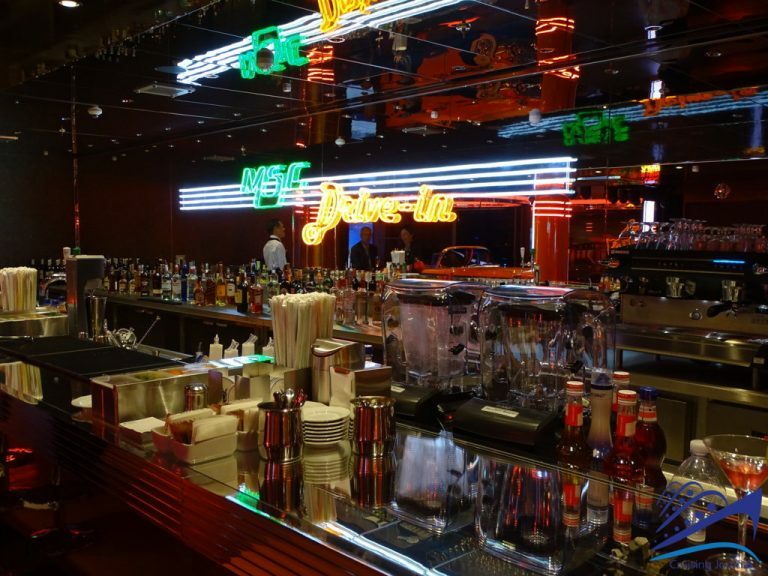 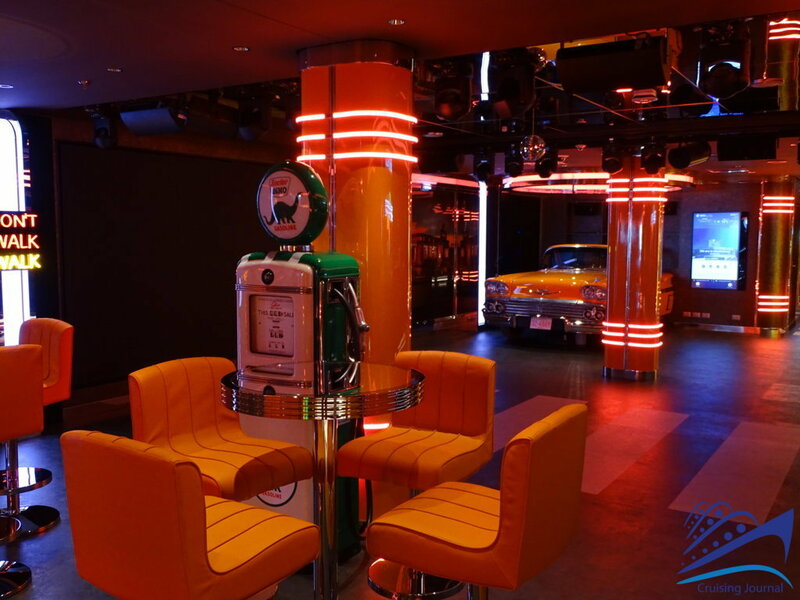 The Garage Club is truly an American-style disco club, with a spectacular Chevrolet placed in a corner of the room, and the Drive In Bar that reminds us of the typical service stations found on any U.S. “Route”. 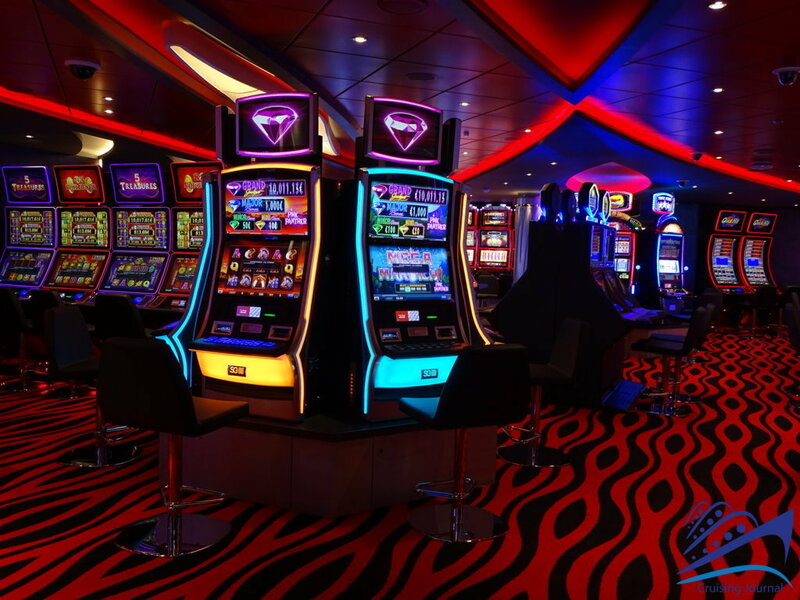 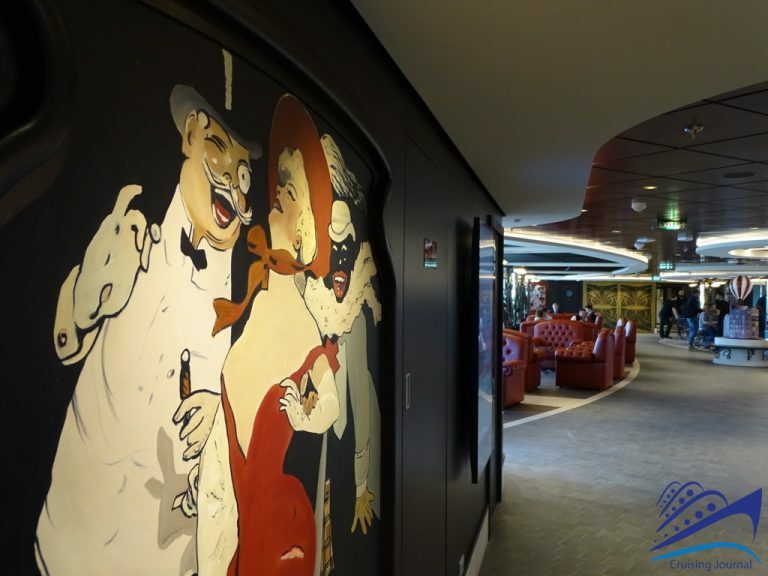 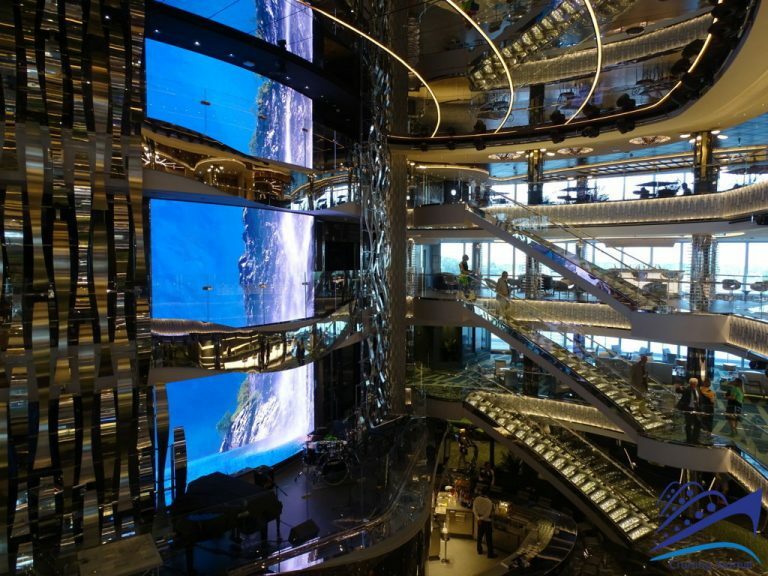 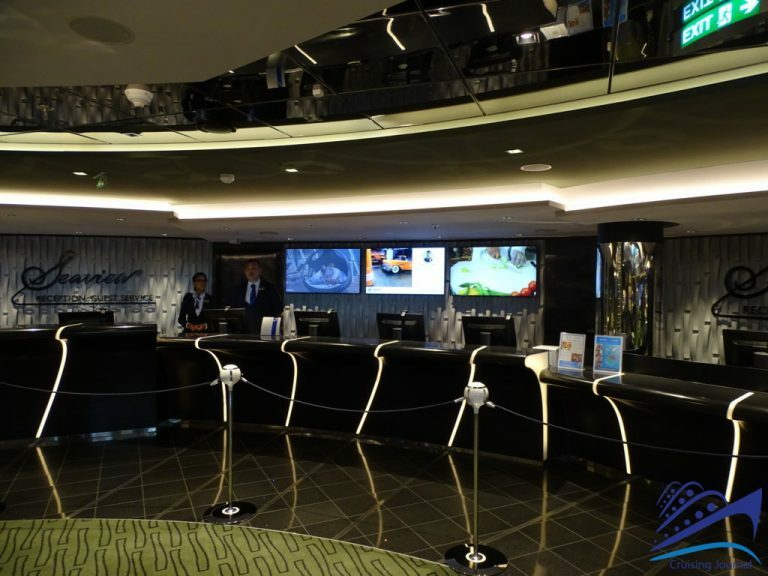 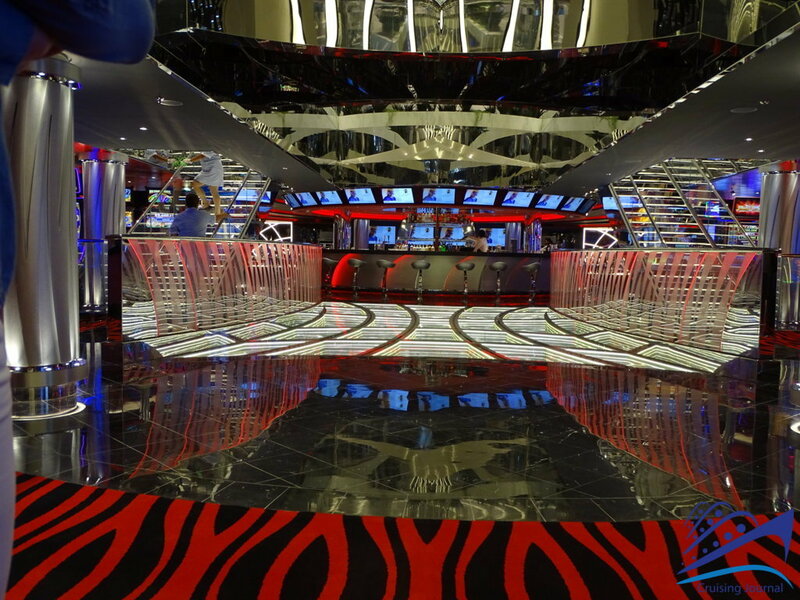 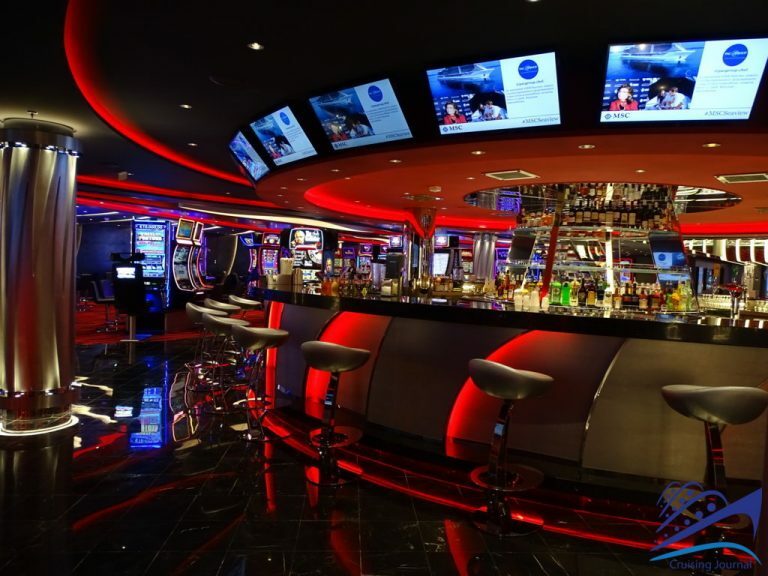 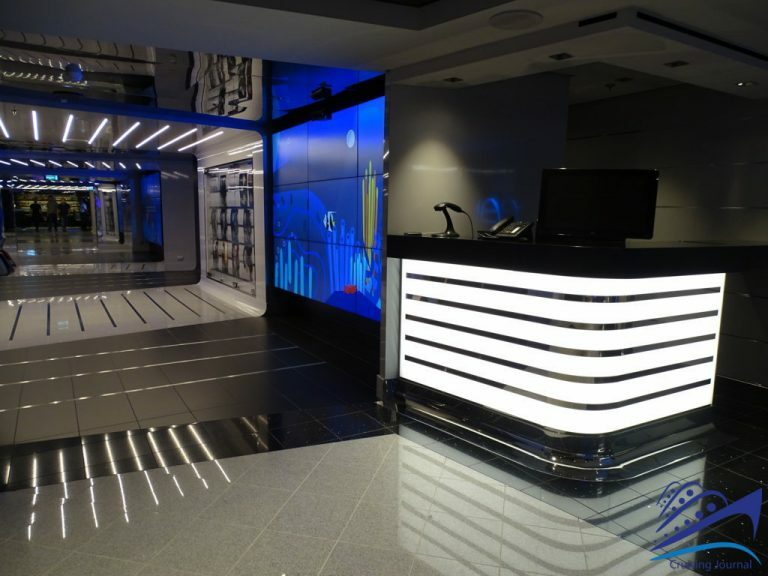 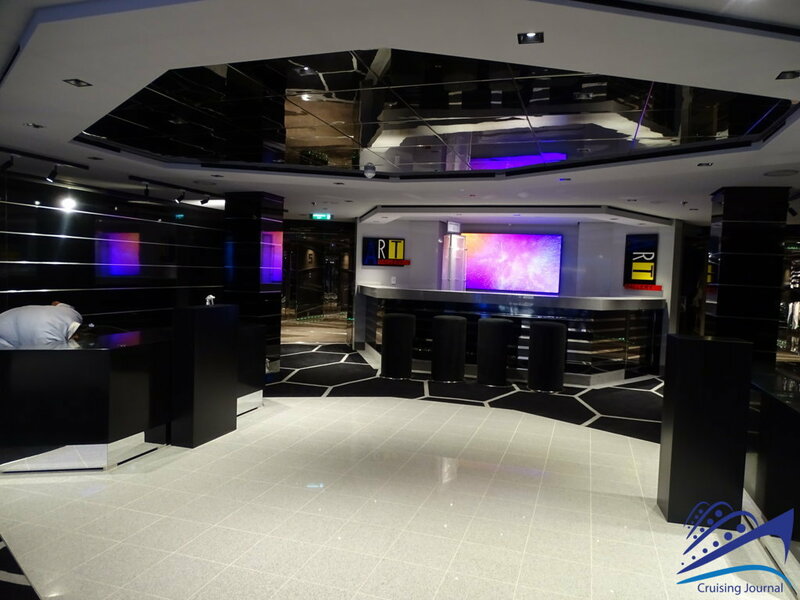 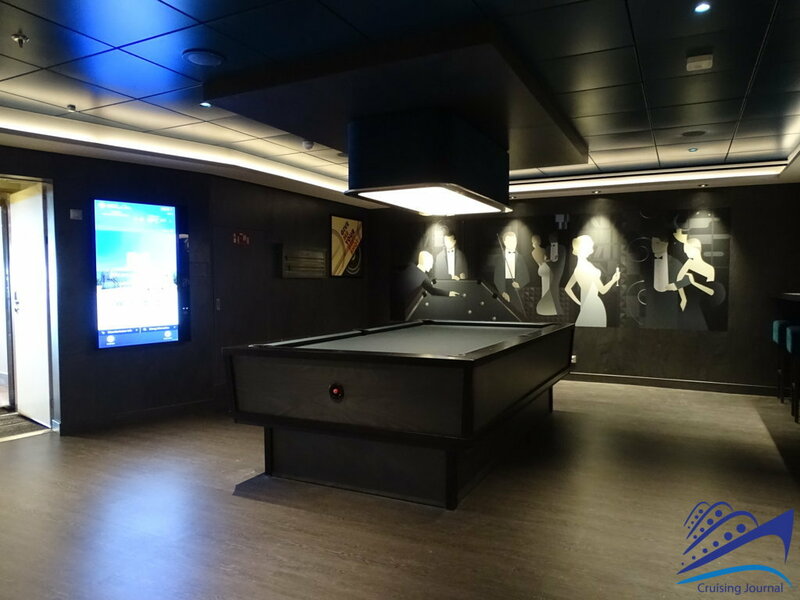 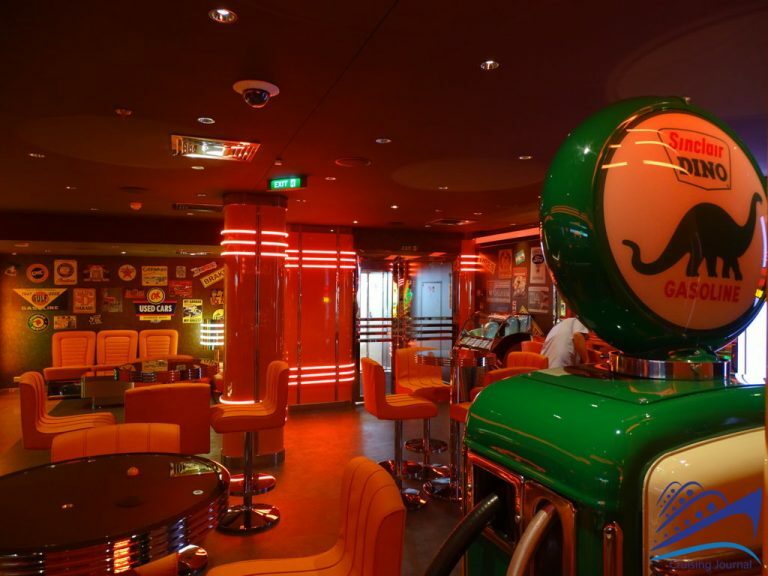 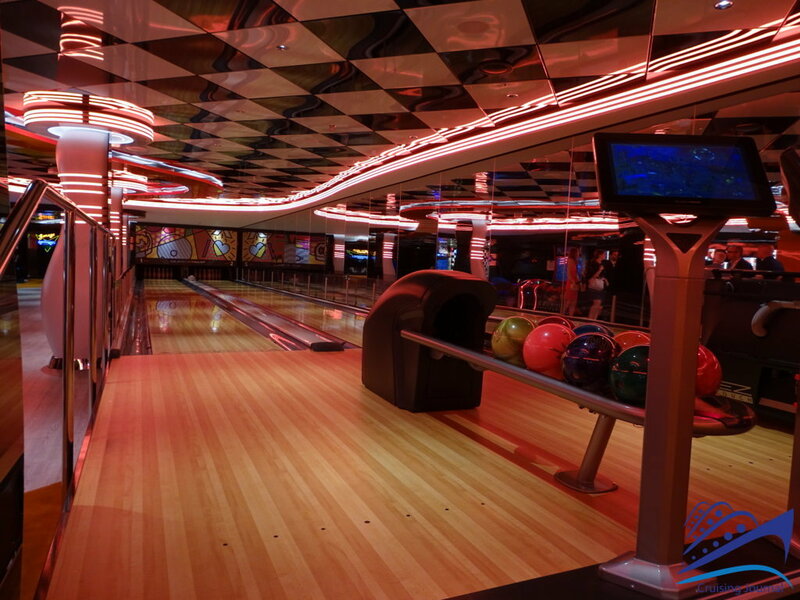 Aft end of Deck 7 also houses a number of attractions such as the Billiard Room, Bowling Alleys, videogames, XD Cinema, and a F1 Simulator. 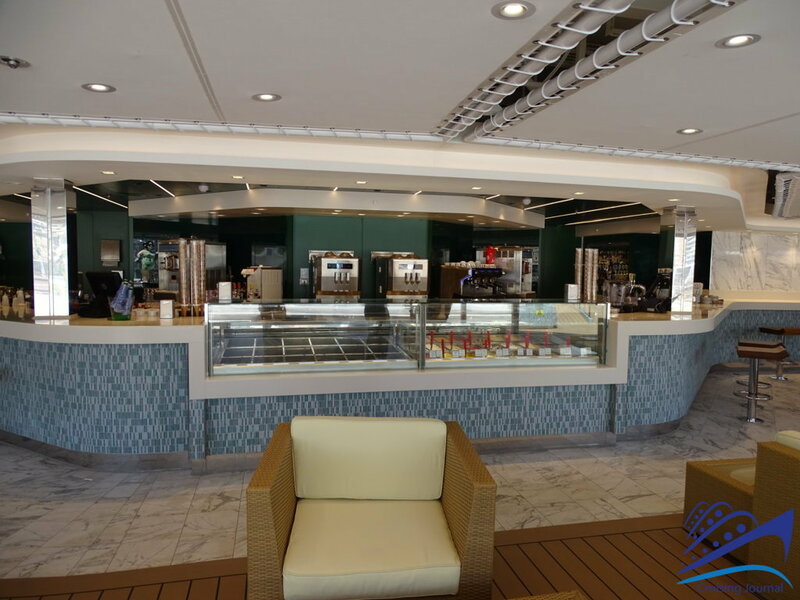 On port side, you will find another Venchi location where ice cream and crepes are served! 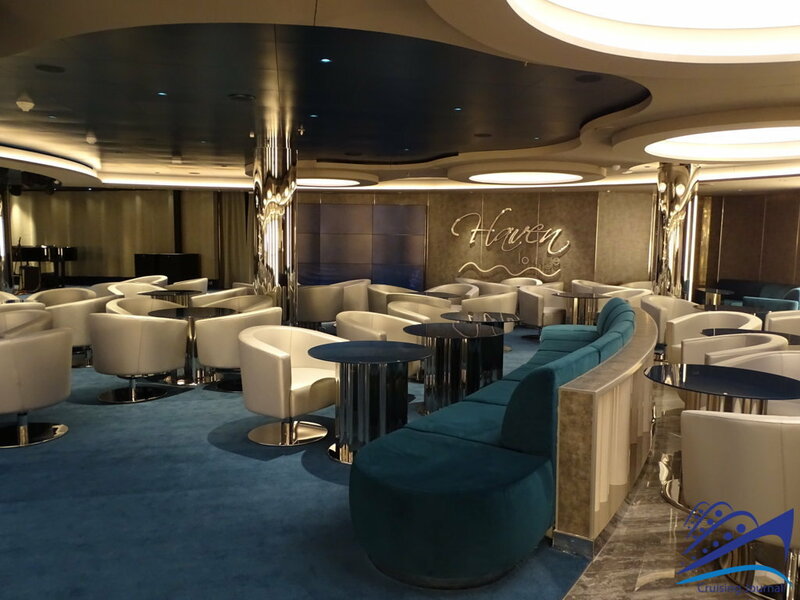 The Haven Lounge is an extension of the Garage Club but in a decidedly more classic and sober style. 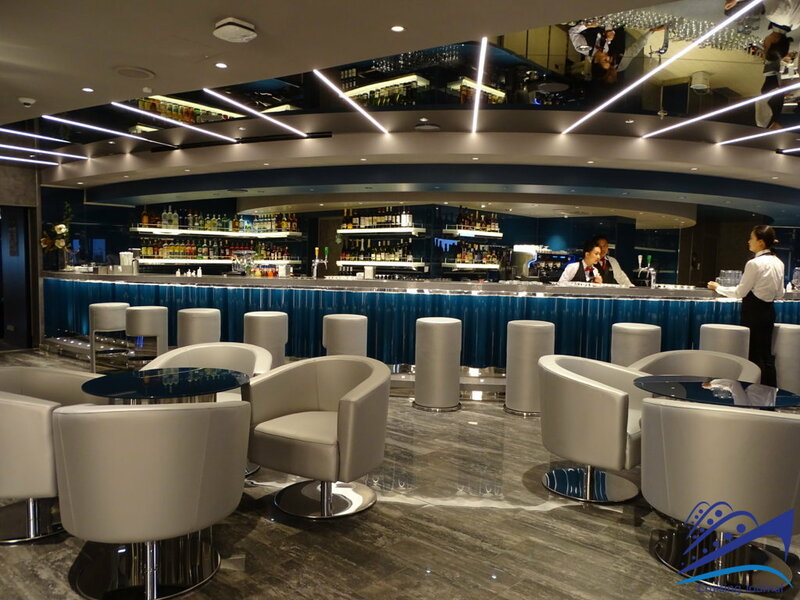 This is the ideal place for an aperitif or an after dinner drink accompanied by live music. From here, you can make your way back to the Atrium by way of Deck 3 that overlooks it. 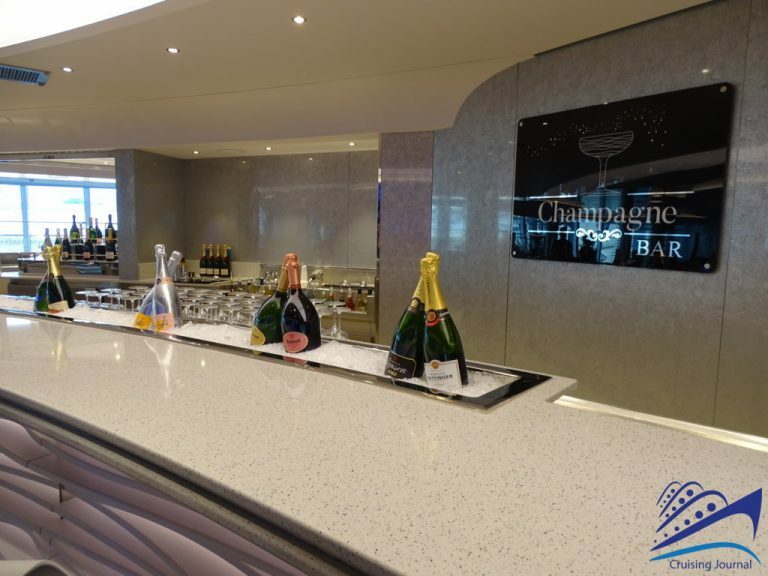 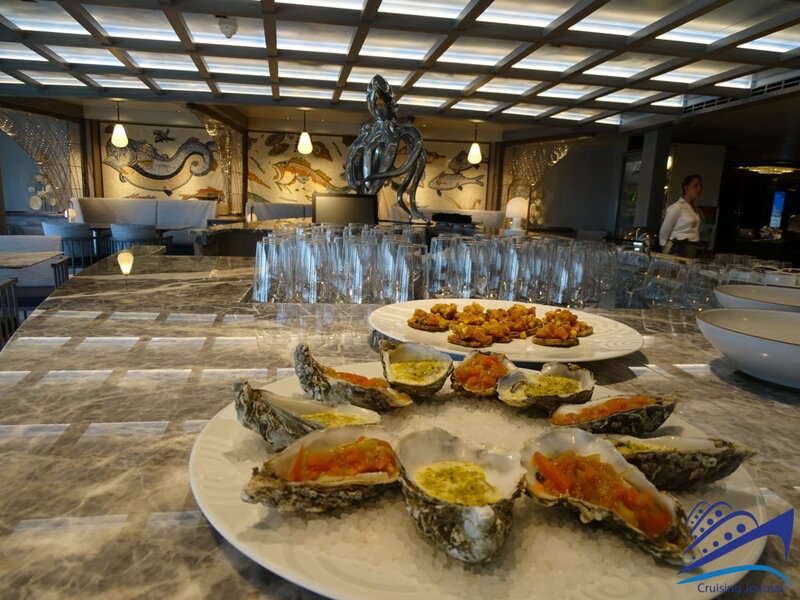 Don’t miss out on the Champagne Bar, a classic venue found on all the newest MSC ships, where oysters and raw fish accompany your favorite bubbly. 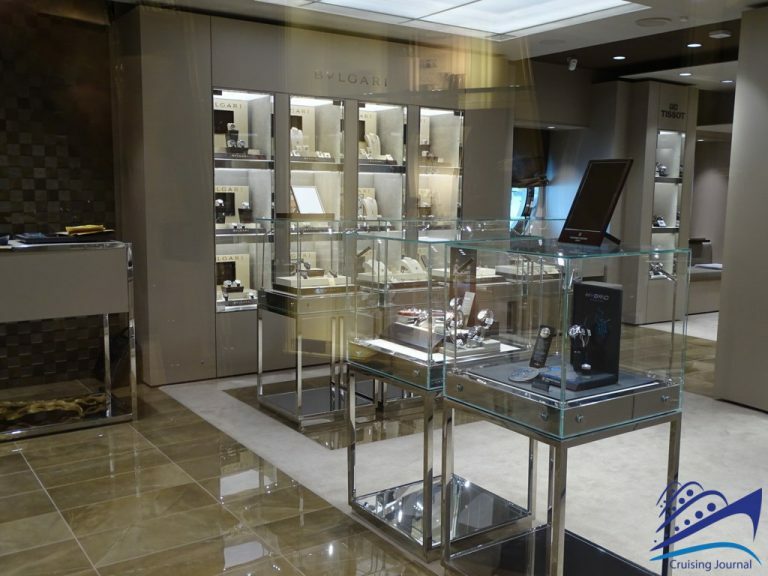 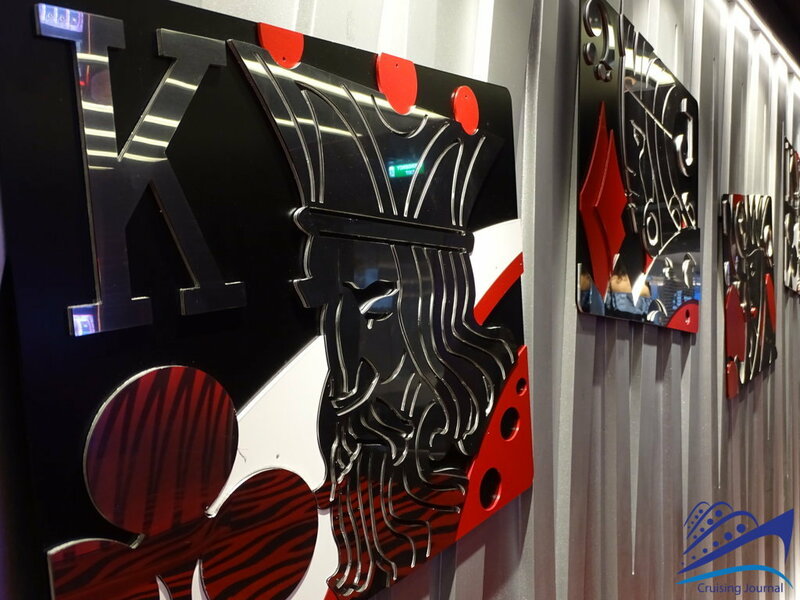 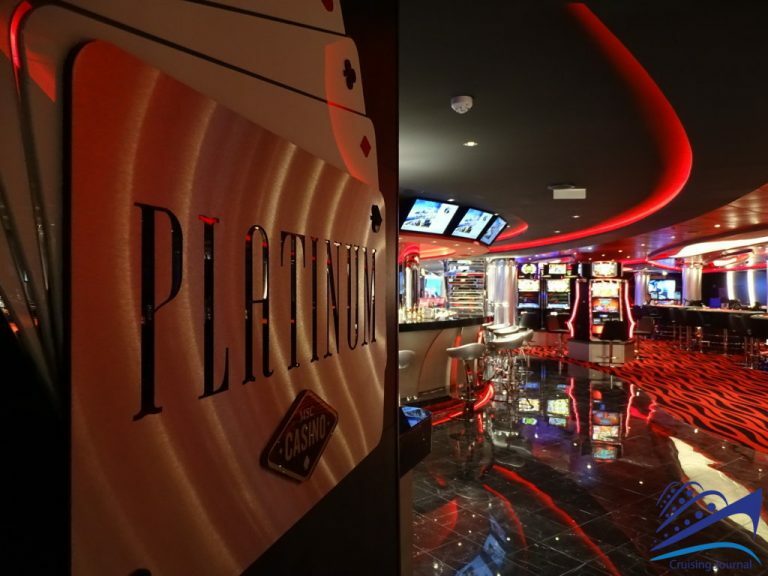 Other shops surround this level of the Atrium and lead you to the Platinum Casino that boasts ample gaming space with slots and numerous table games. 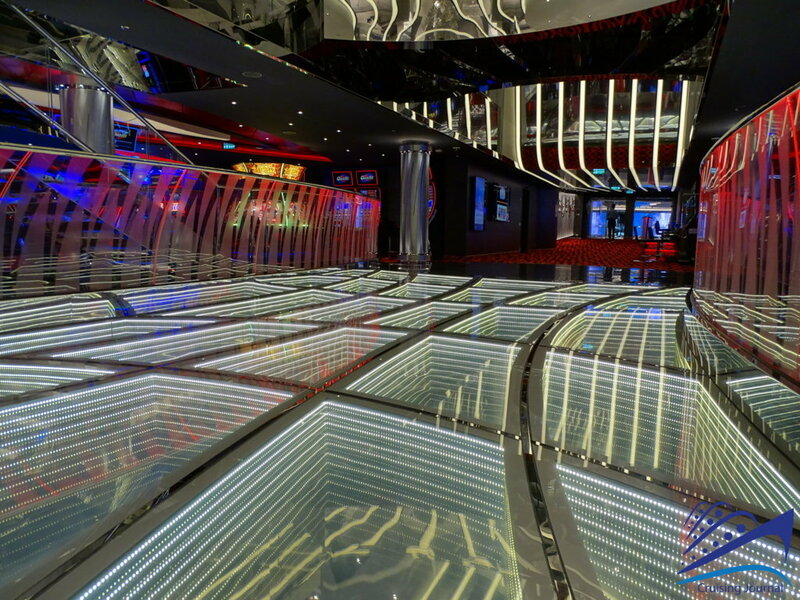 Heading forward to the bow of the ship, you reach the balcony seats of the theatre. 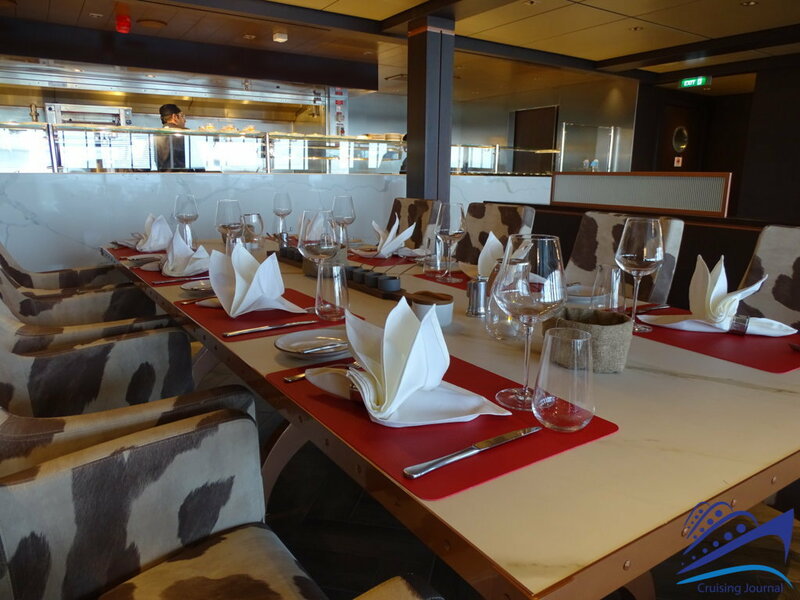 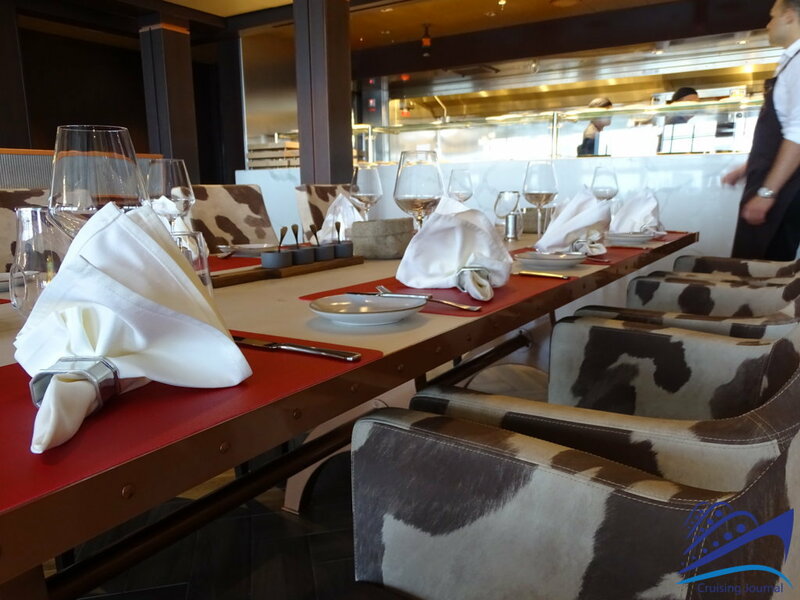 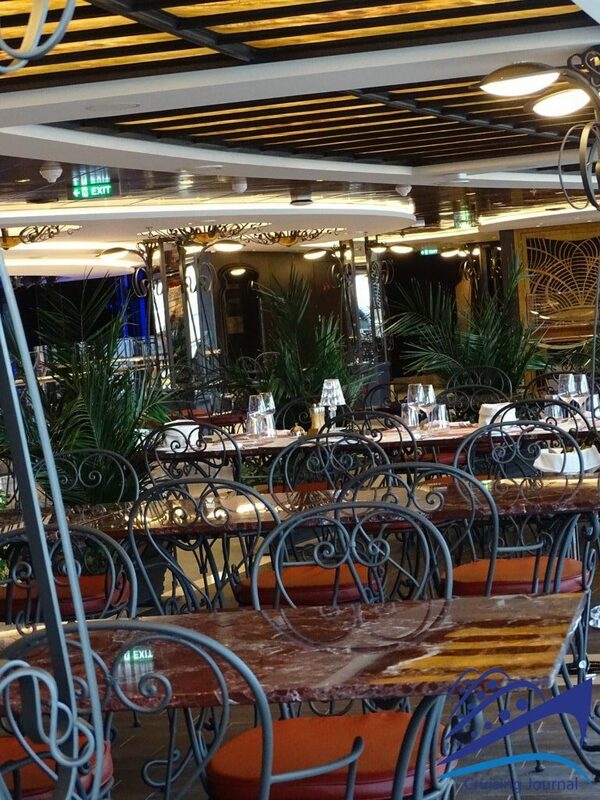 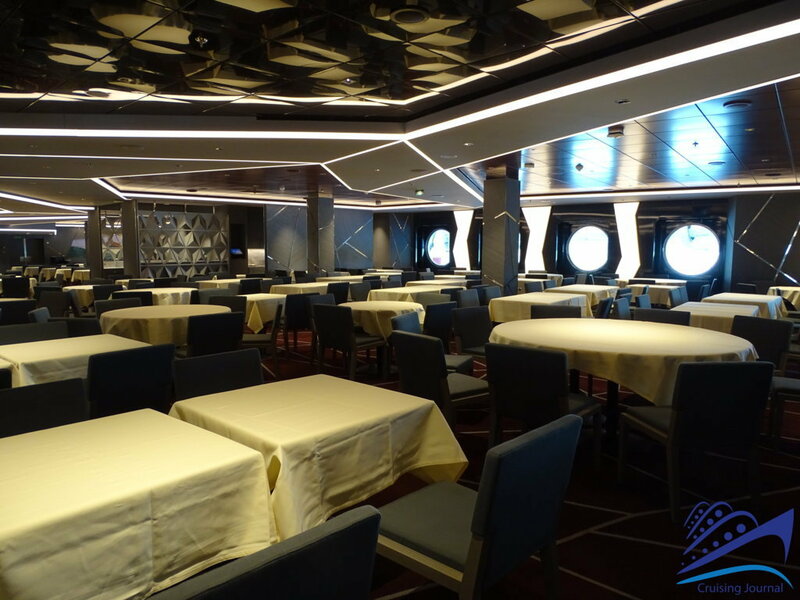 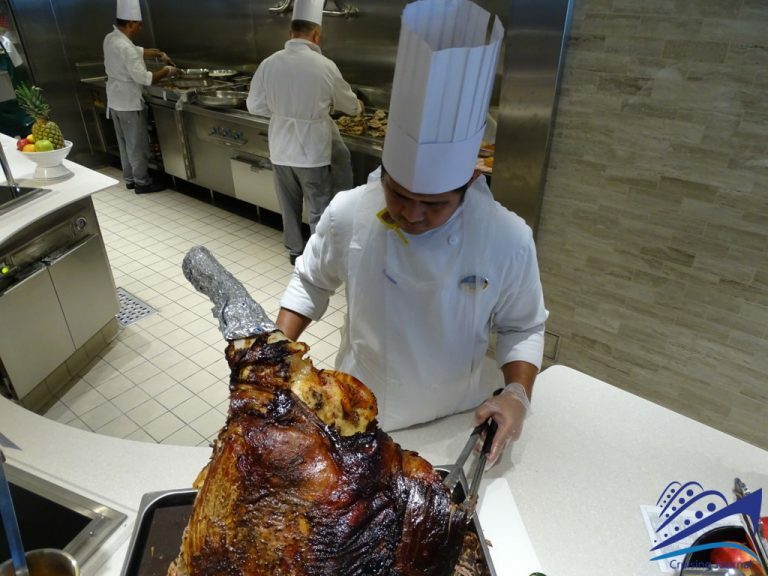 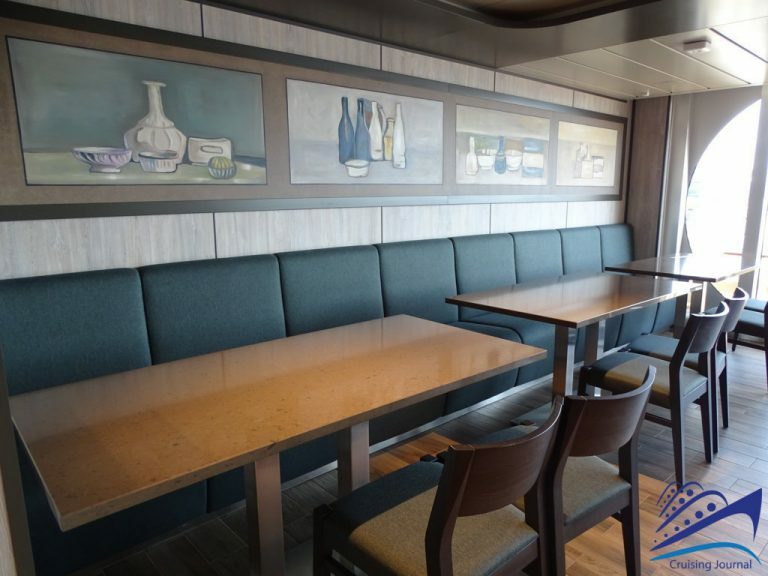 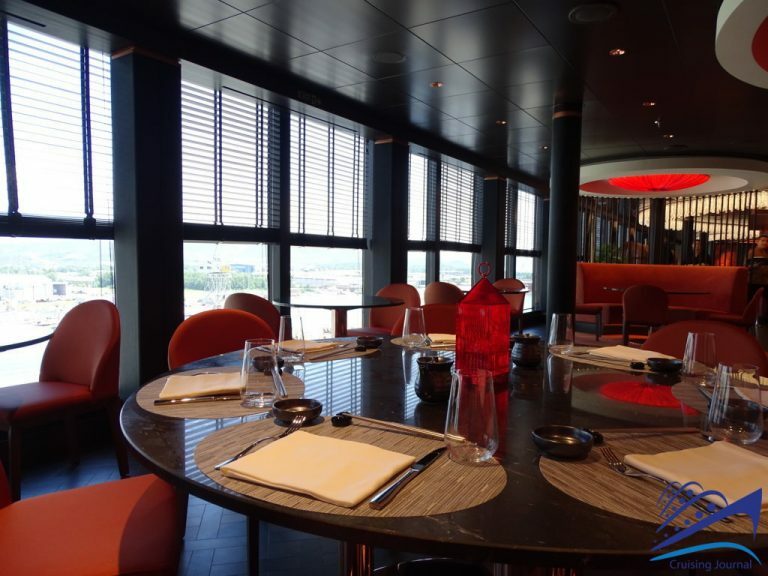 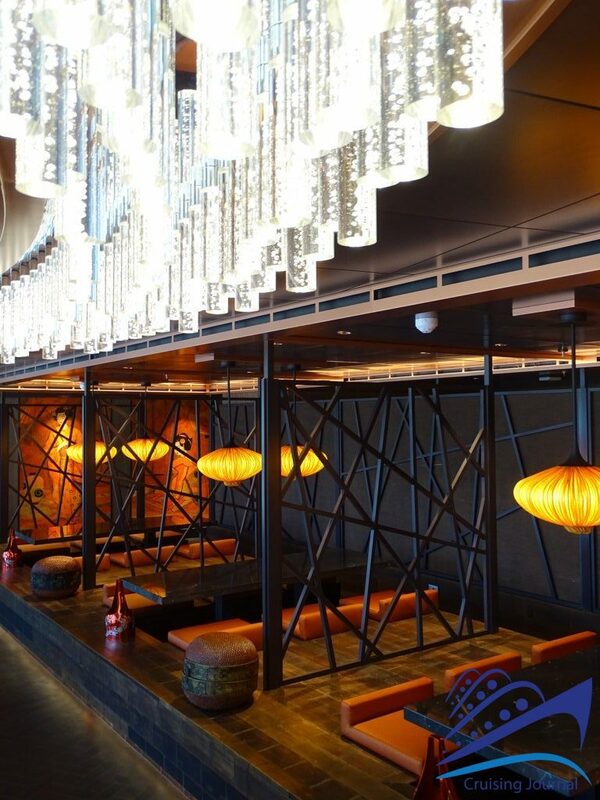 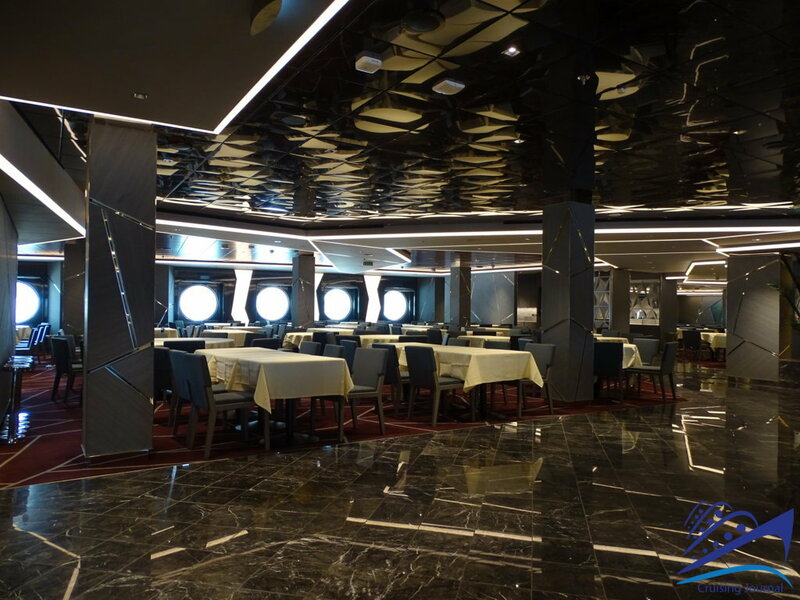 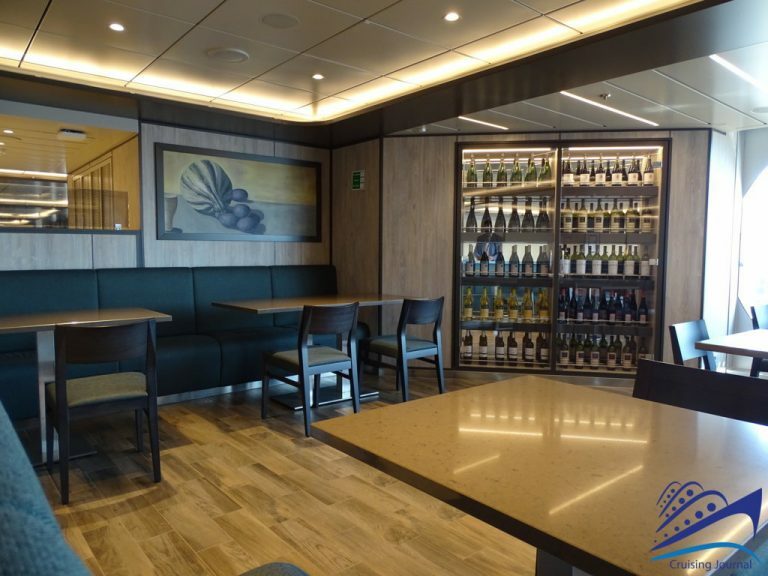 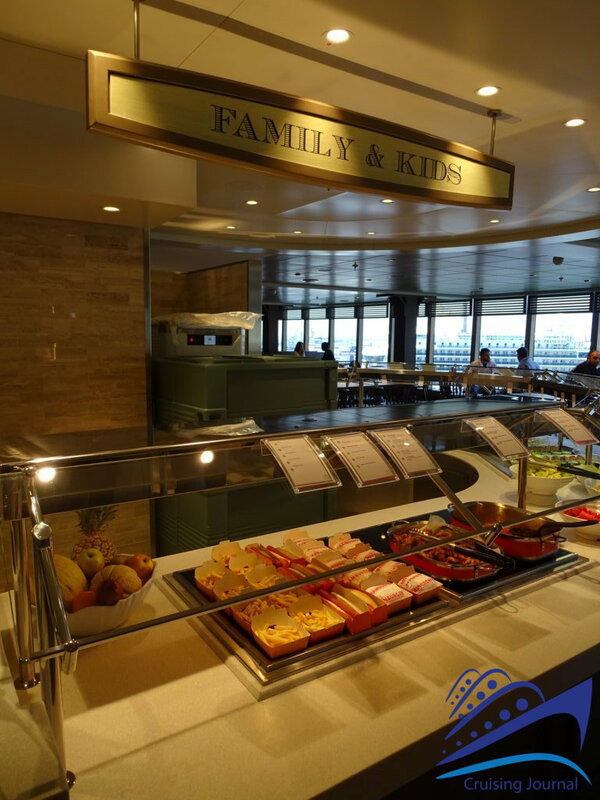 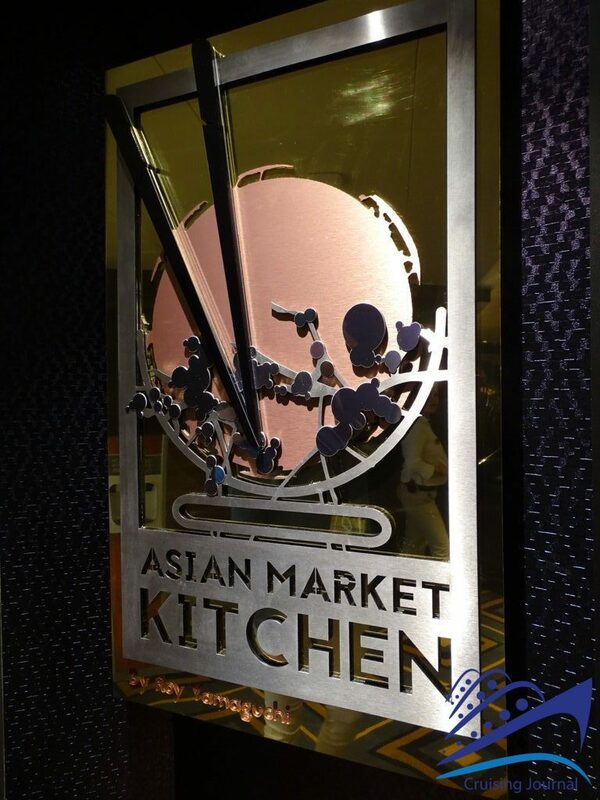 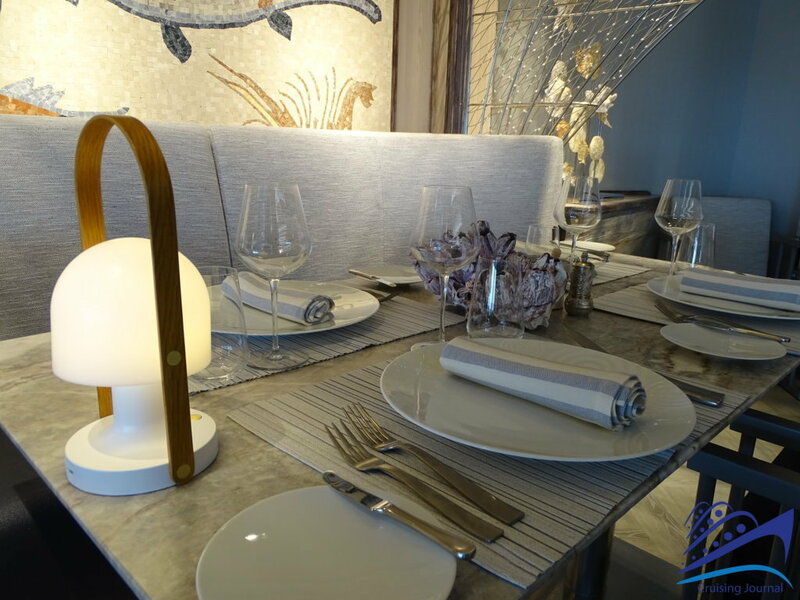 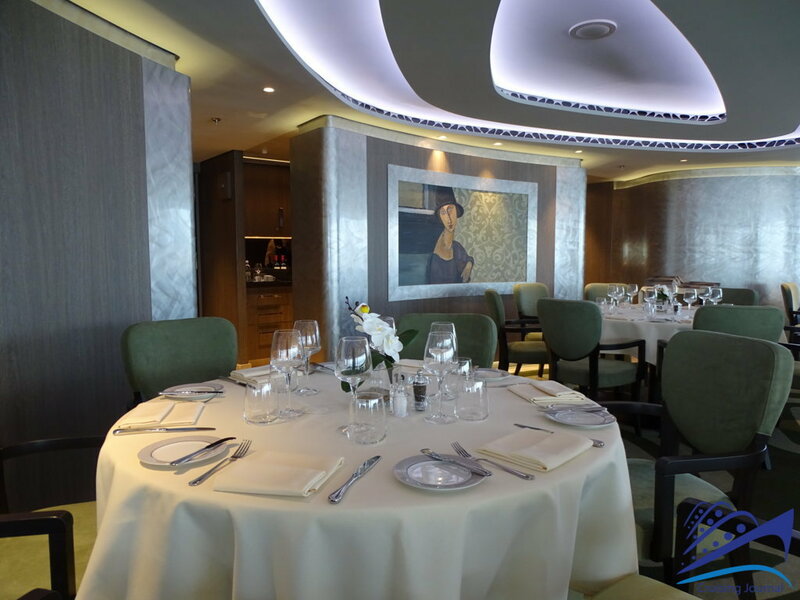 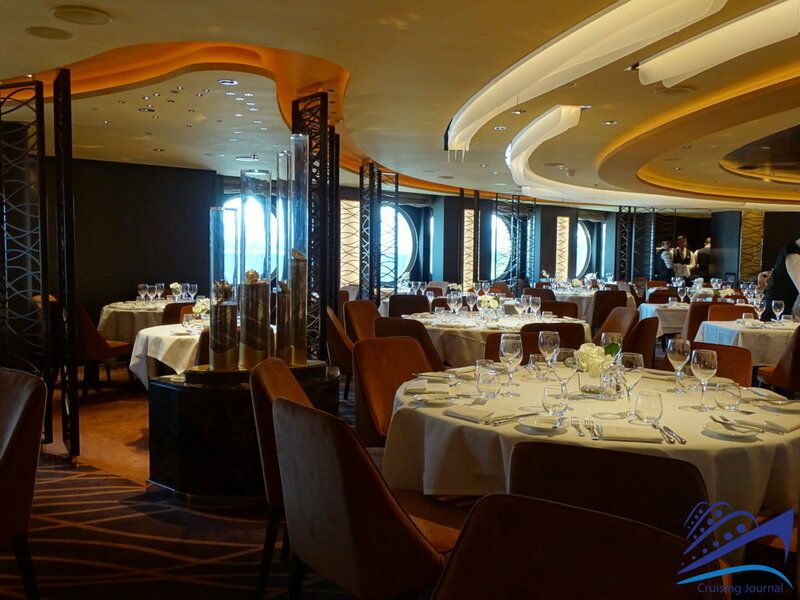 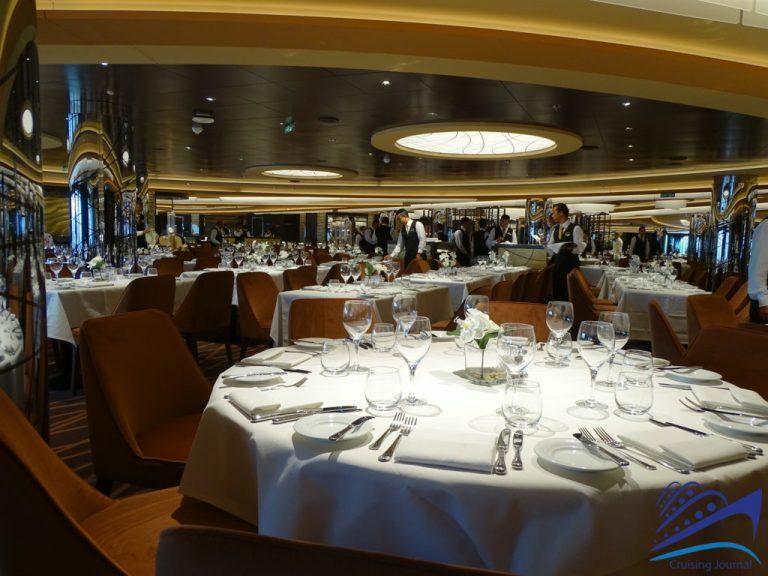 There are many other dining areas at Deck 8. The stern houses a buffet-style restaurant, the Marketplace, with a layout of various specialties and equipped with outdoor tables. 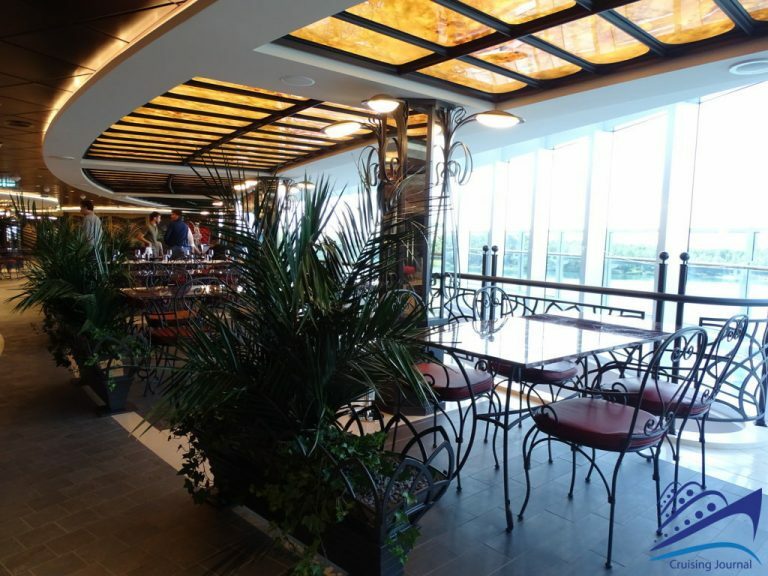 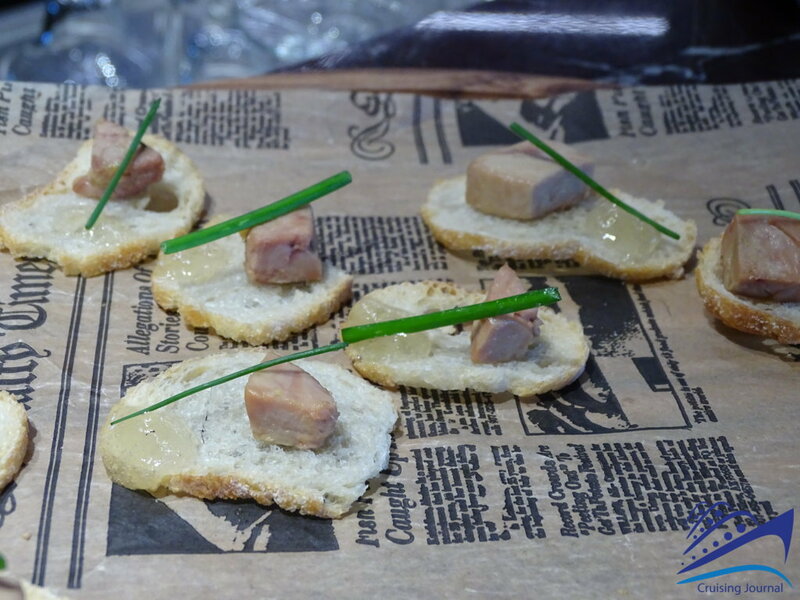 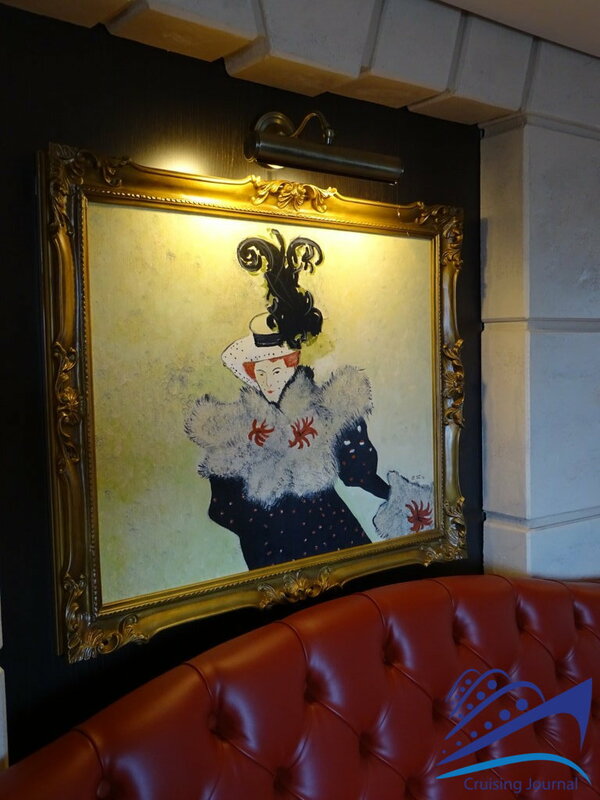 The delightful Atelier Bistrot is located in the Atrium, a clearly French-inspired eatery where you can savor a number of specialties at both lunch and dinnertime. 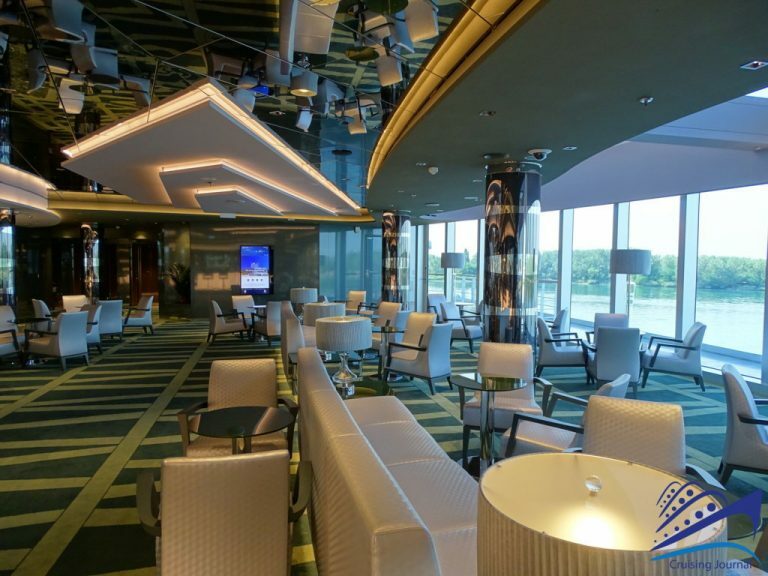 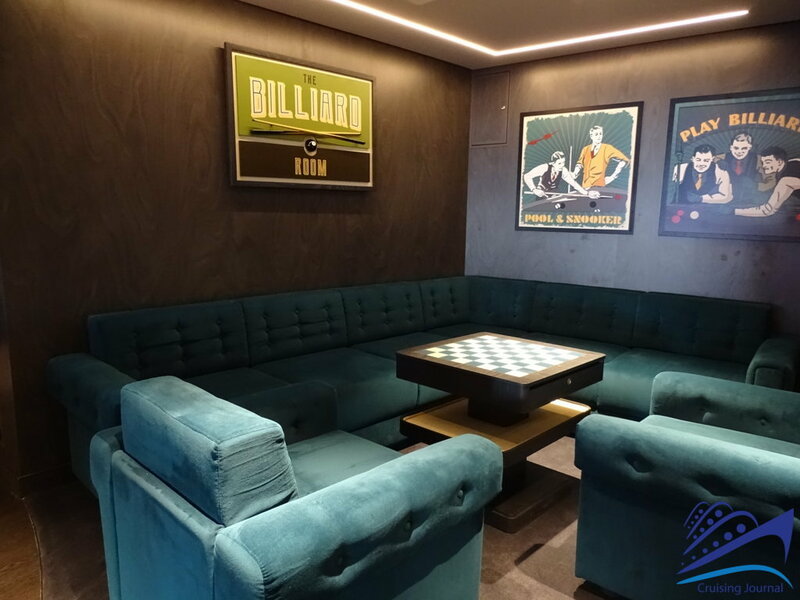 Proceeding towards midship, you will find the Sports Bar, the perfect spot to watch your favorite game snuggled in an armchair shaped like a soccer ball; and, on the opposite side with a similar ocean view, the more elegant Seaside Lounge. 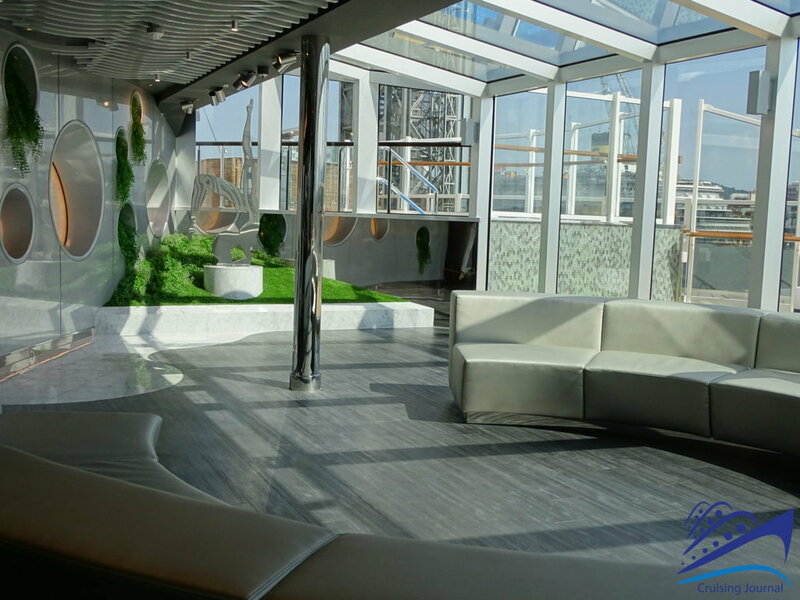 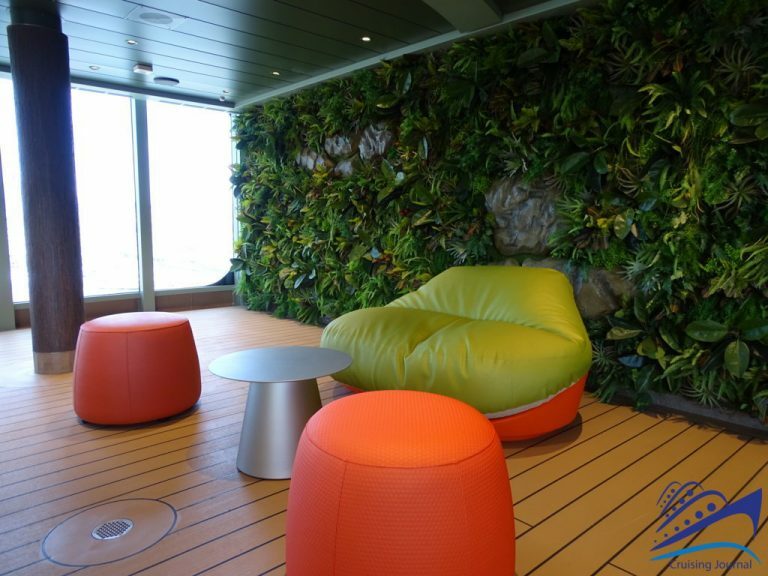 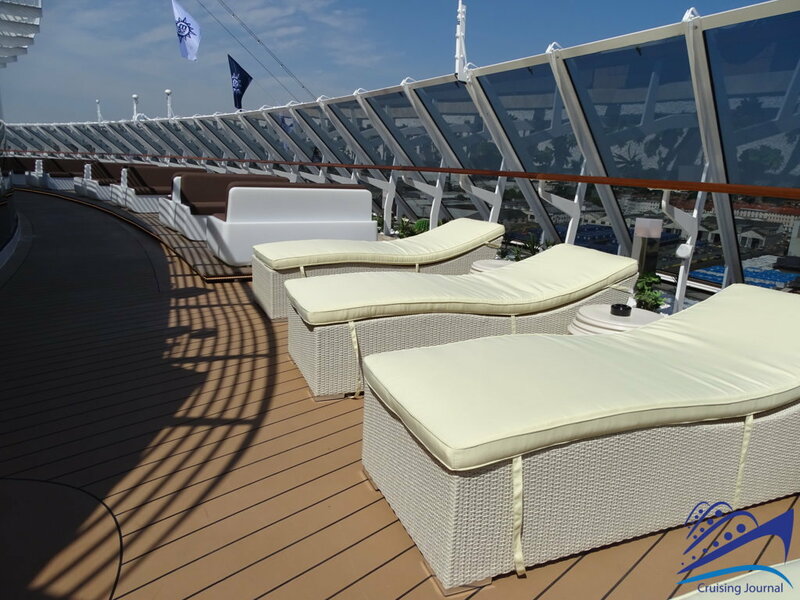 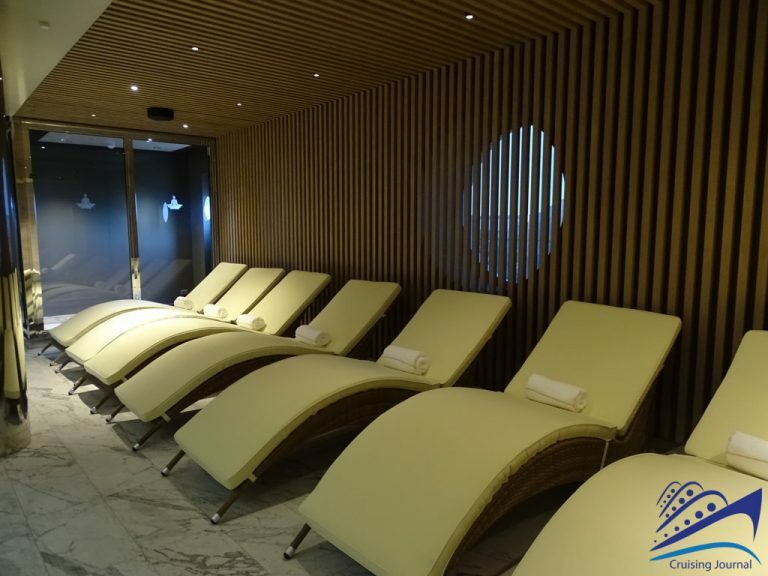 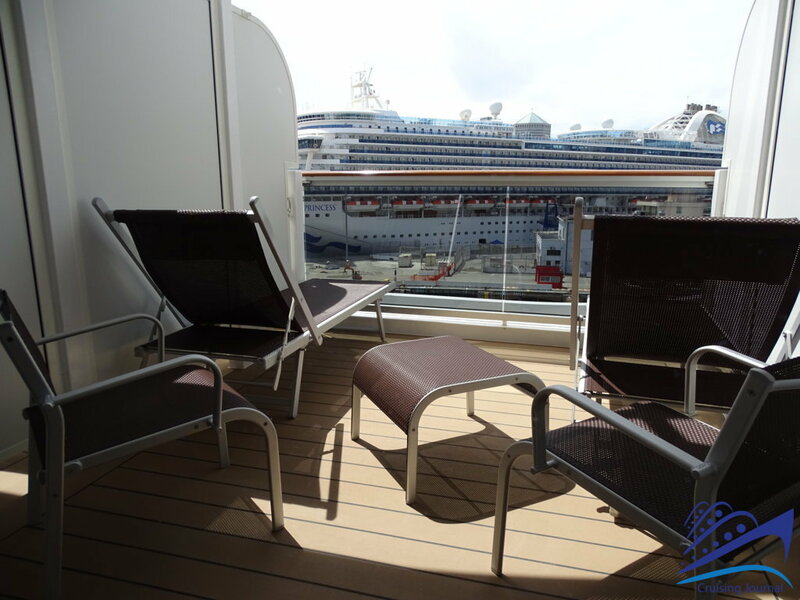 The remarkable Fitness and Spa area opens up at the bow end of the deck. 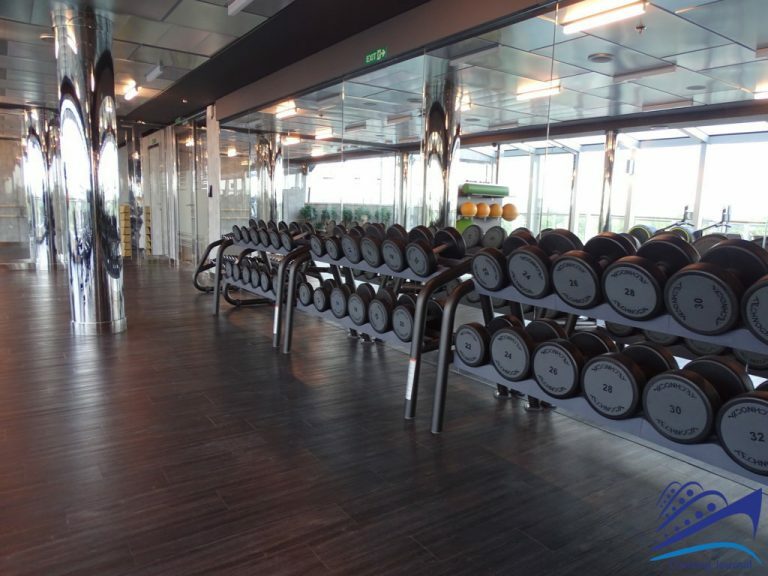 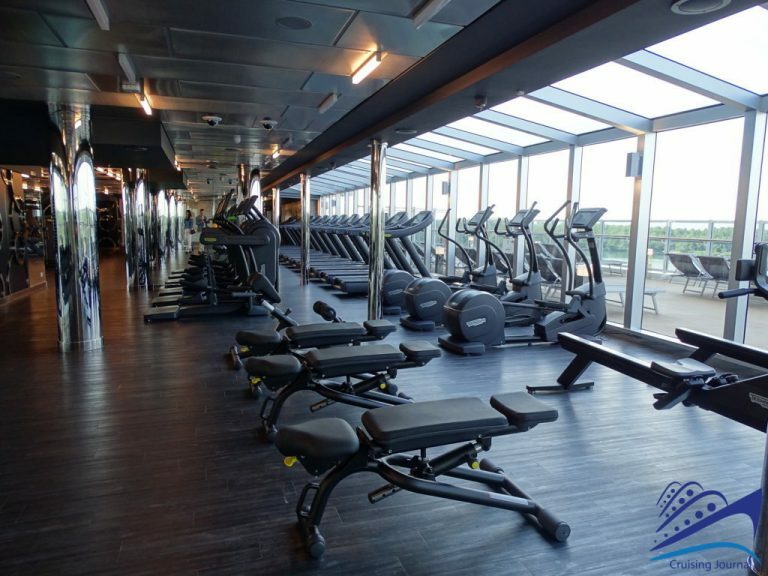 State-of-the-art equipment and ample spaces for aerobics and spinning set the gym apart. 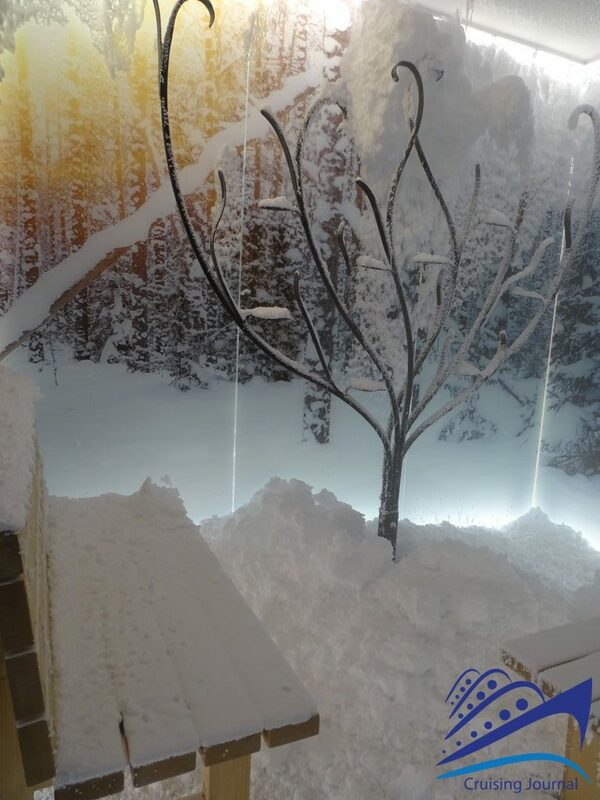 At the Spa, the list of massages and treatments you can indulge in is very long, complete with relaxation areas and the spectacular snow cave. 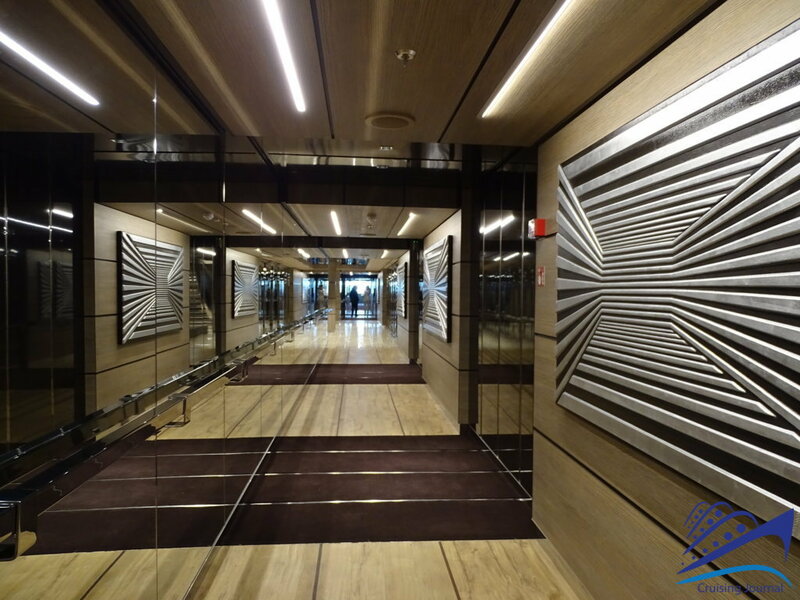 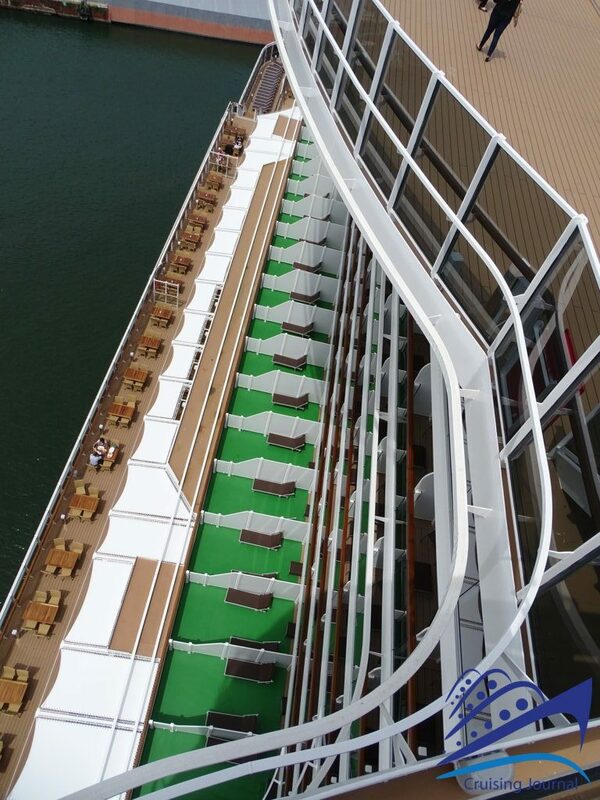 Take one of the 23 onboard elevators and go up to Deck 16. 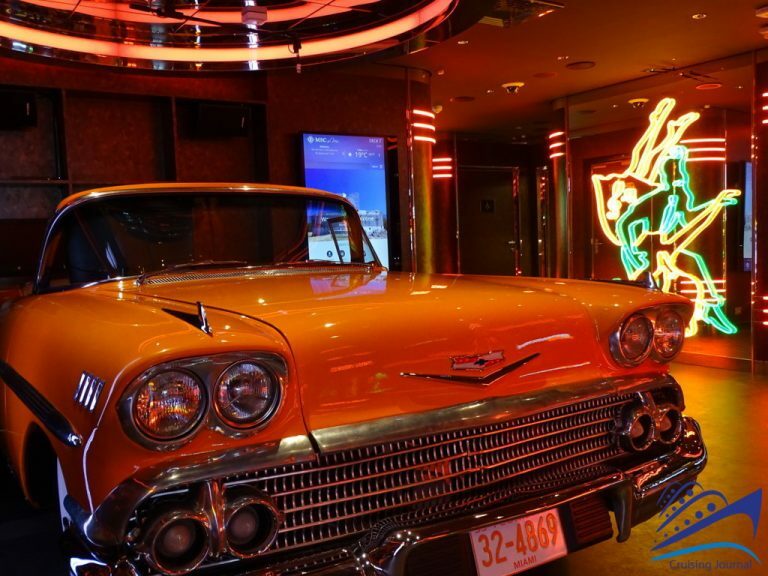 Here you will discover incredible attractions and venues. 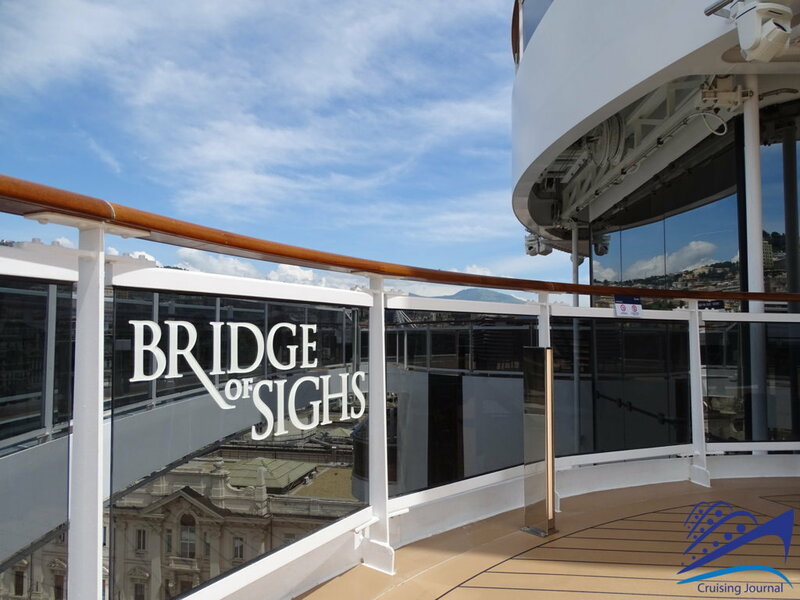 At the far end of the stern, there is the Bridge of Sighs, a catwalk suspended over the sea and overlooking the Sunset Beach Pool. 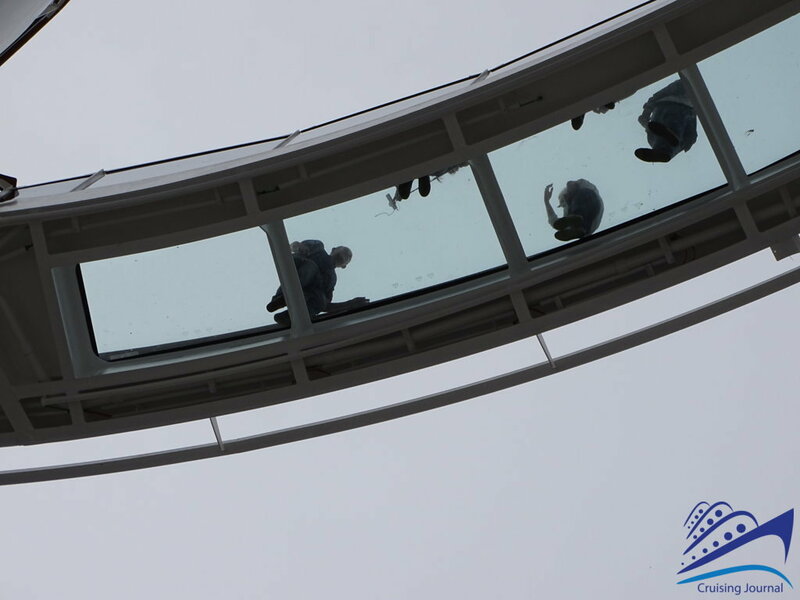 The thrill experienced walking suspended in air will certainly be compensated after you see yourself in one of the most sought-after photos taken onboard. 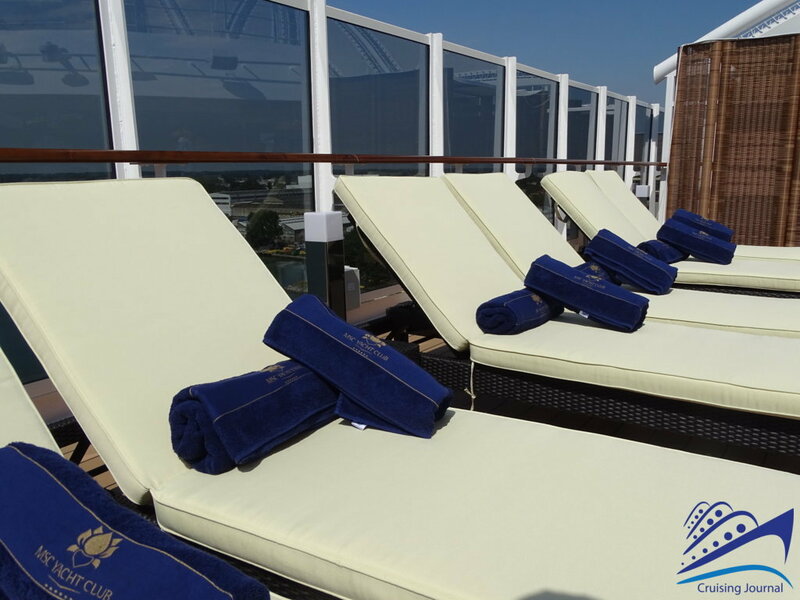 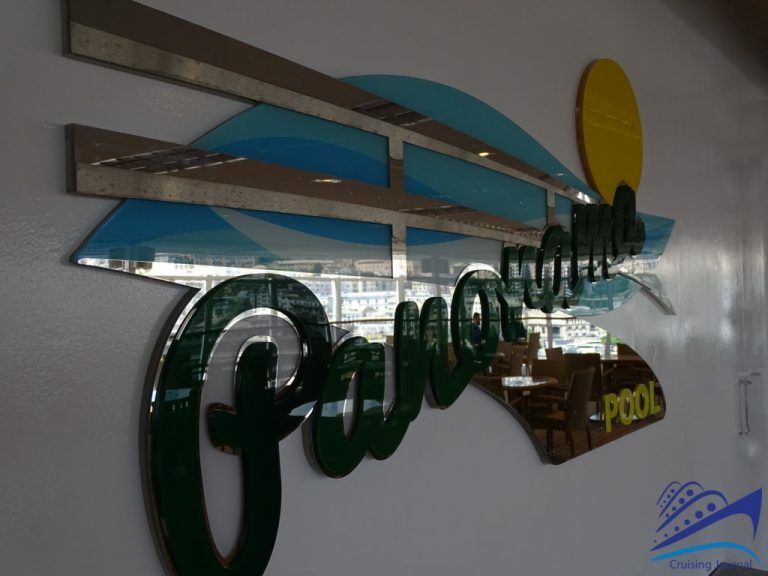 Not far is the Panorama Pool, a tranquil swimming pool with poolside sunbeds where guests can take advantage of the Panorama Bar as well as one of the two buffet-style dining areas onboard, the Ocean Point Restaurant. Midship houses three equally enticing specialty restaurants: The Ocean Cay specializes in seafood and features an incredible wine display; the Butcher’s Cut is the quintessential Steakhouse; and lastly the Asian Market Kitchen offers a successful combination of Sushi and Sashimi as well as other oriental cuisine specialties. 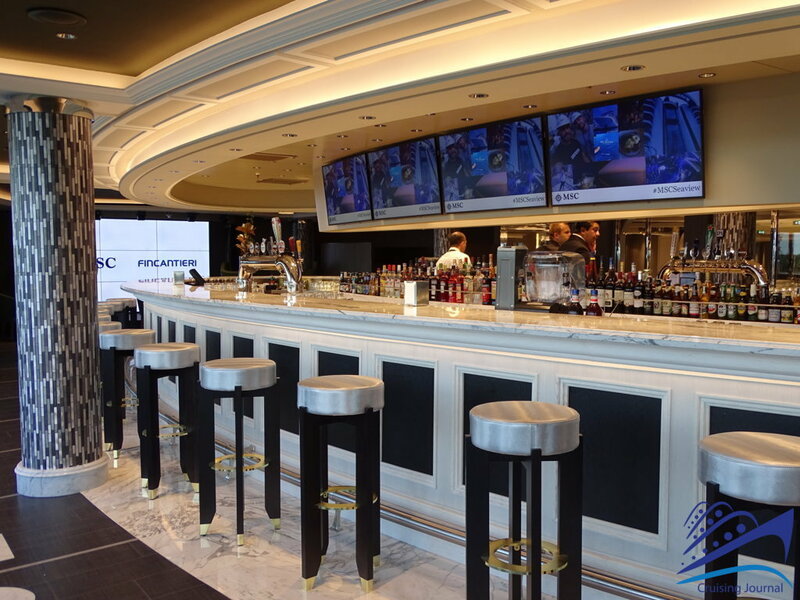 If you still can’t decide where to go then enjoy a drink at the Wine & Cocktails Bar, the ideal meeting place located right at the center of the three restaurants. 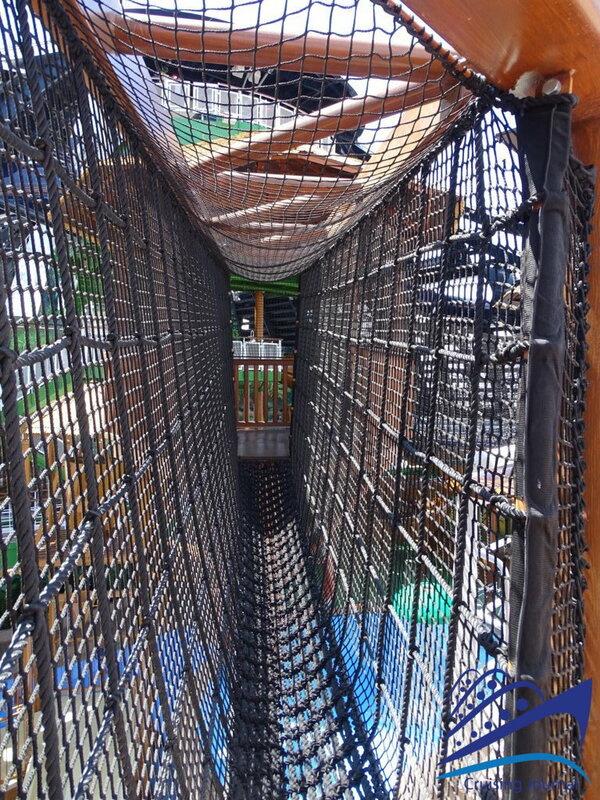 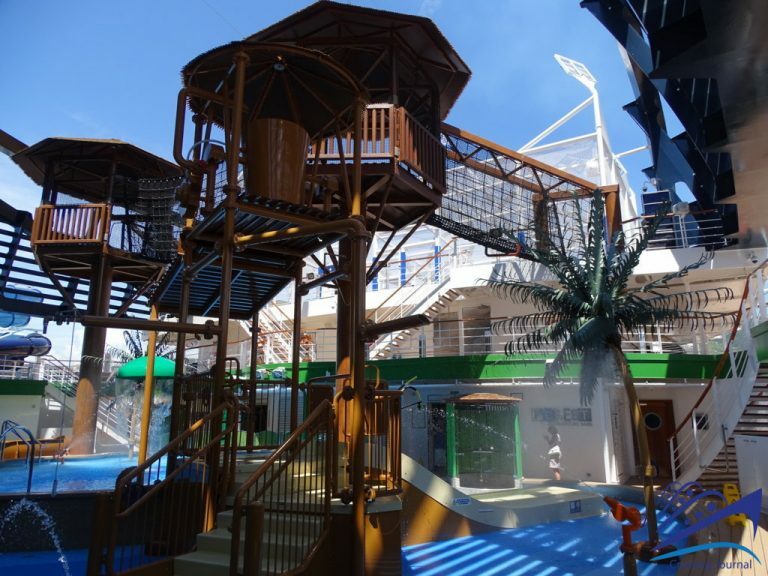 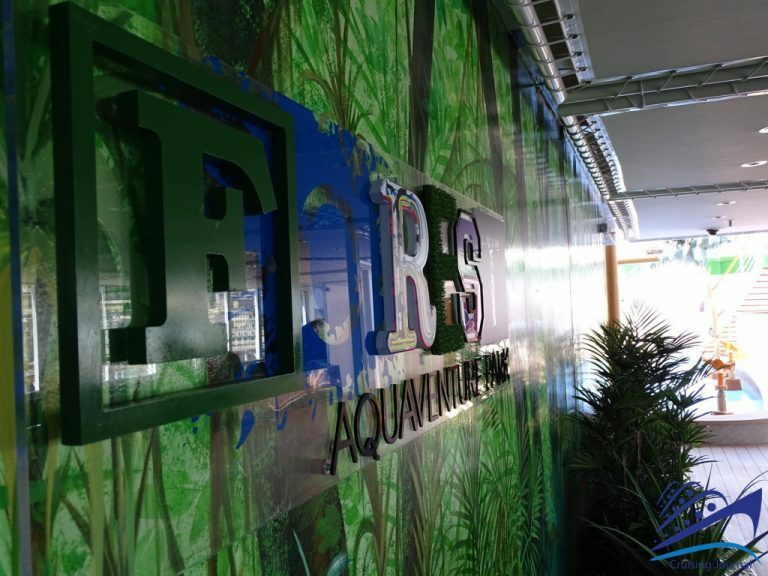 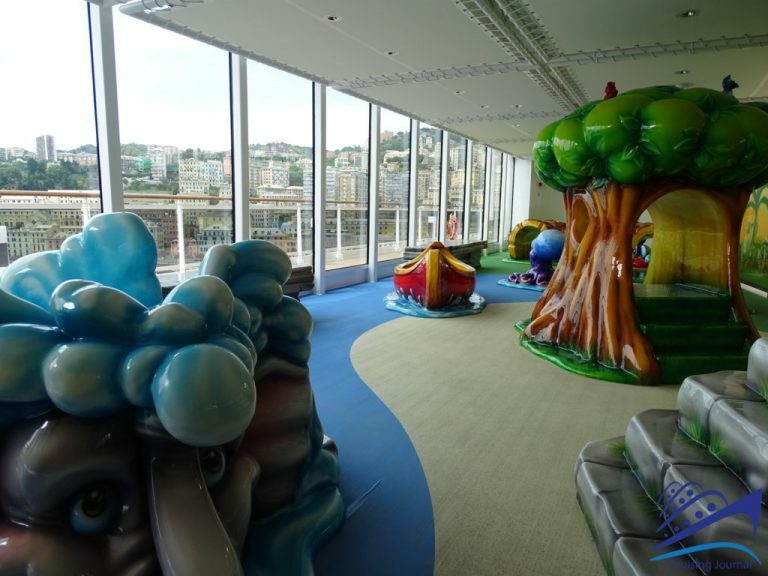 Deck 18 features the children’s facilities (Doremiland, Forest Aquaventure Park) which needless to say attract the adults as well. Aquaventure Park is featured on two decks and its Tibetan bridges and water games make it an authentic village to explore. 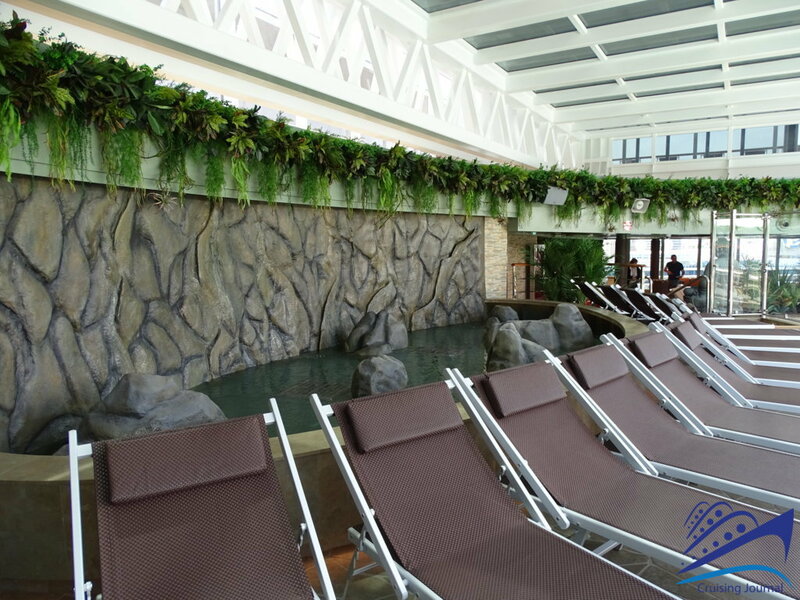 Midship you will find the Jungle Beach Pool, a more tropical-style swimming pool. 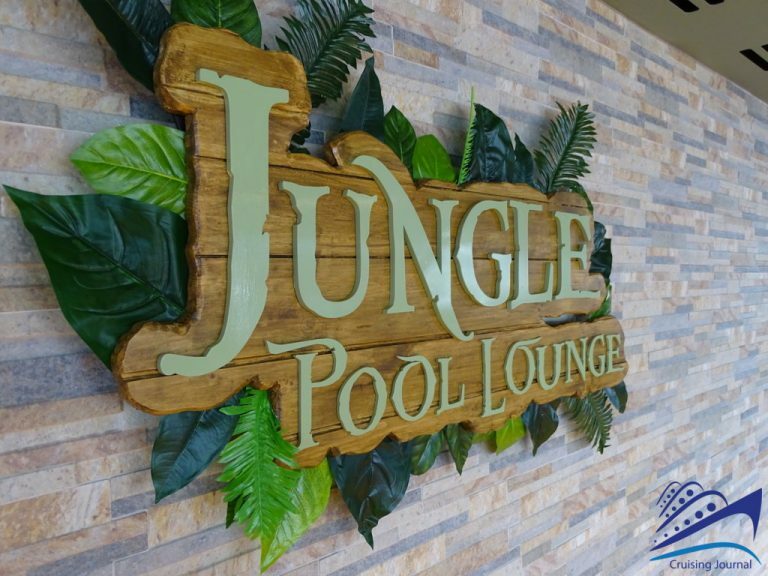 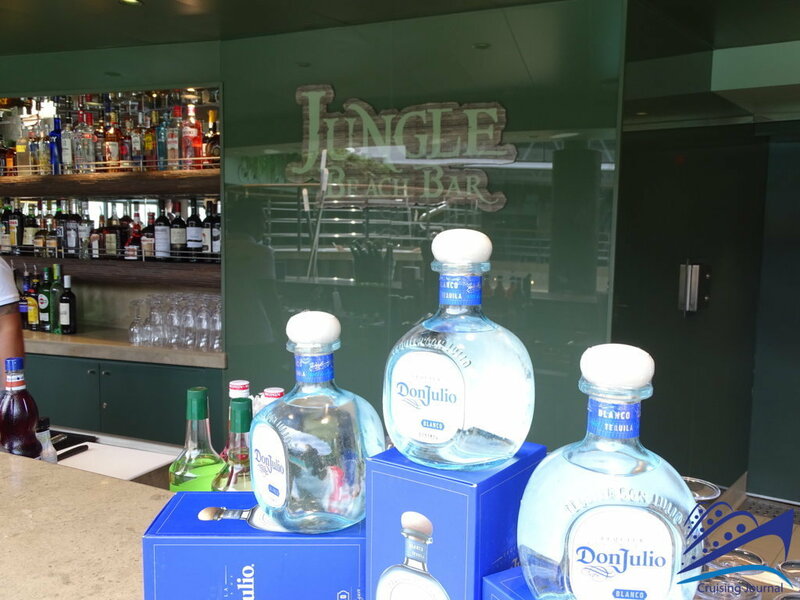 At the Jungle Beach Bar, you can enjoy fresh centrifugal juices and cocktails, while in the Lounge you can relax on our lounge chairs away from the sun. 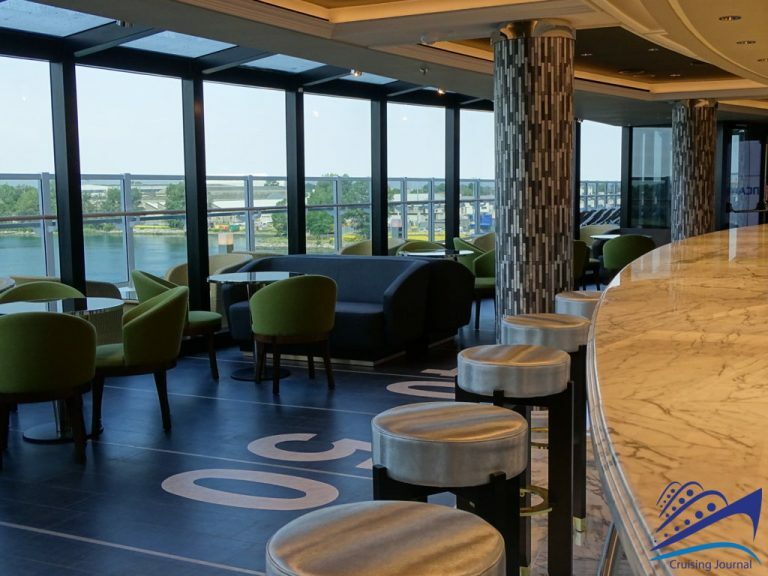 At aft end of Deck 19, you will find the popular Miramar Bar with its spectacular view of the sea, and at the center of the ship, the Top 19 Exclusive Solarium, a reserved facility that requires an entrance fee. 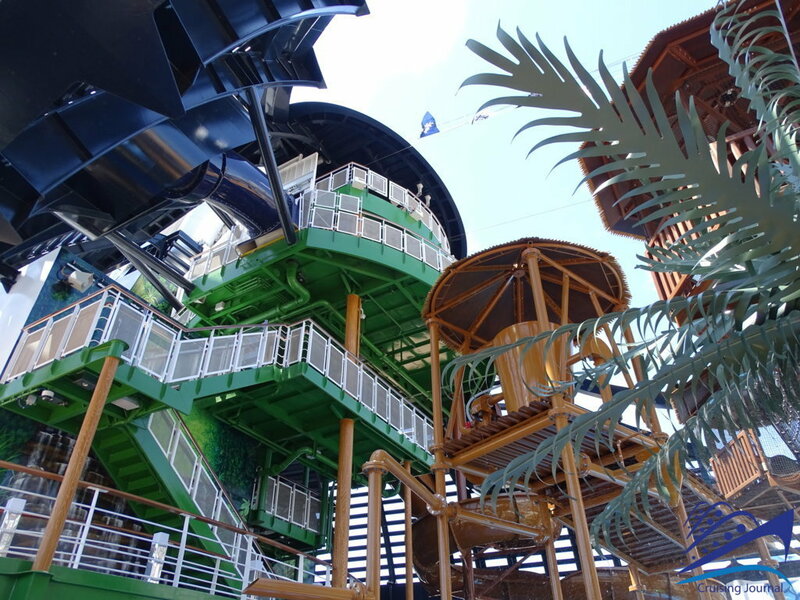 Higher up on Deck 20 is the sports area and the Adventure Trail, connected to the Aquaventure Park complex. 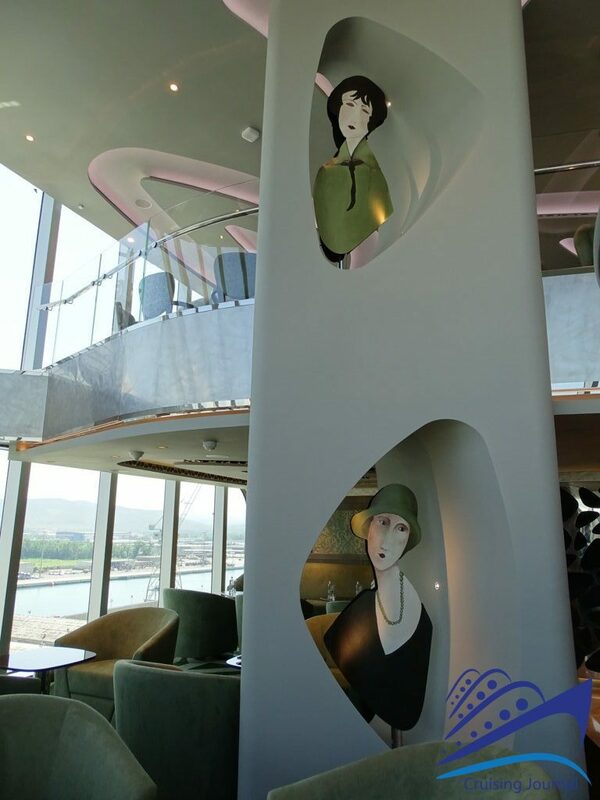 The three-deck Yacht Club, Decks 16, 18 and 19, is actually a ship within the ship. 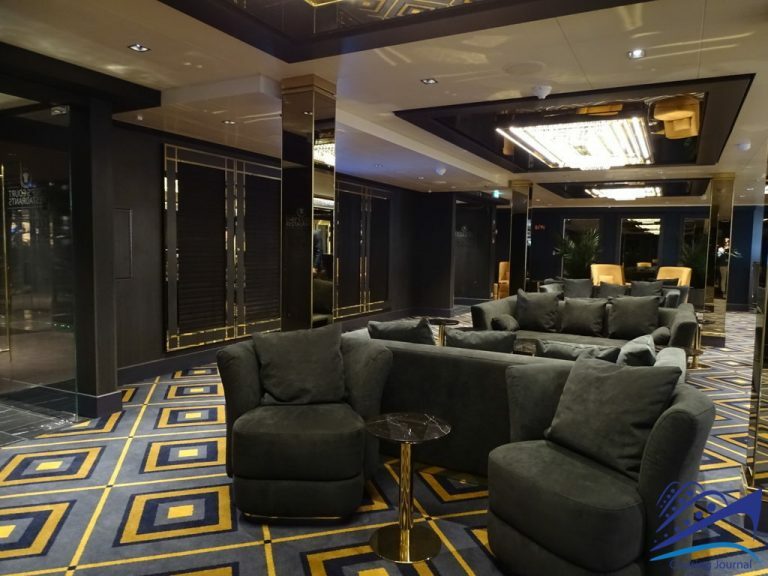 It houses a variety of cabins that go from the inside cabins to the Royal Suite, its own Concierge, a Vip Lounge, a Restaurant, and even its own shops. 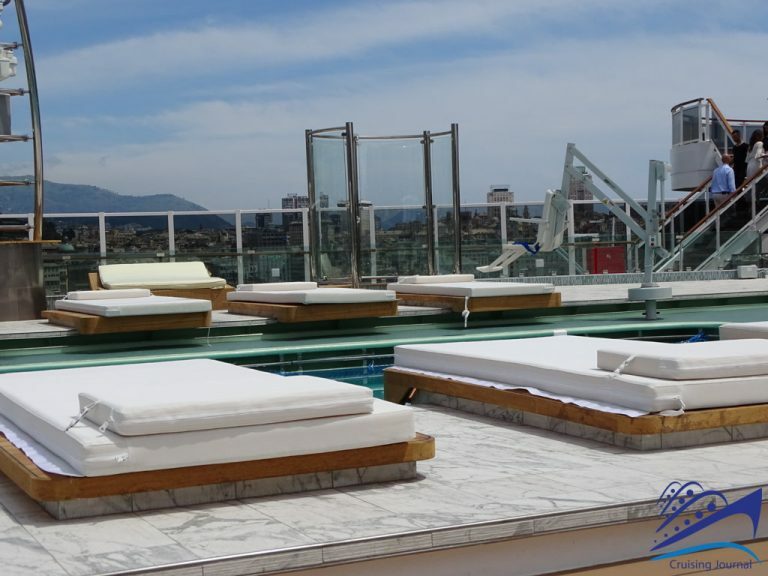 An ample outdoor area reserved for the guests opens up to a large swimming pool, solarium and outdoor Bar & Grill. 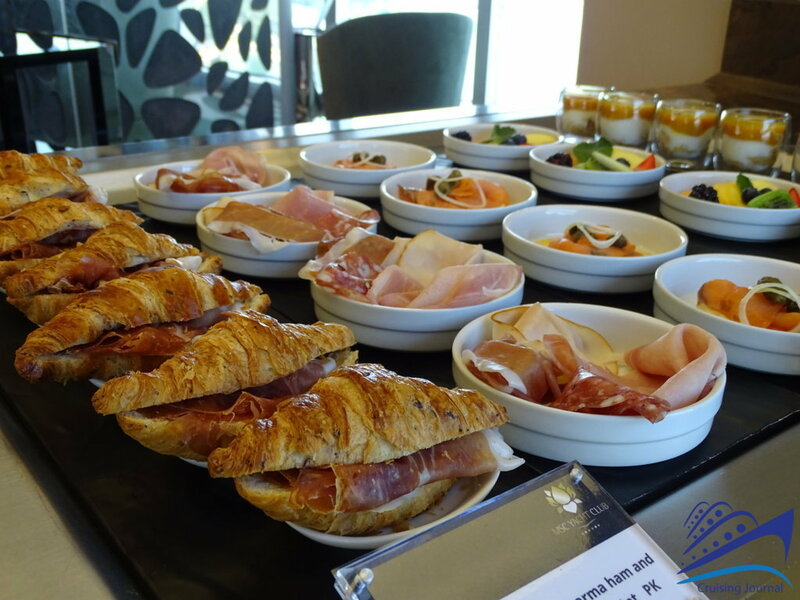 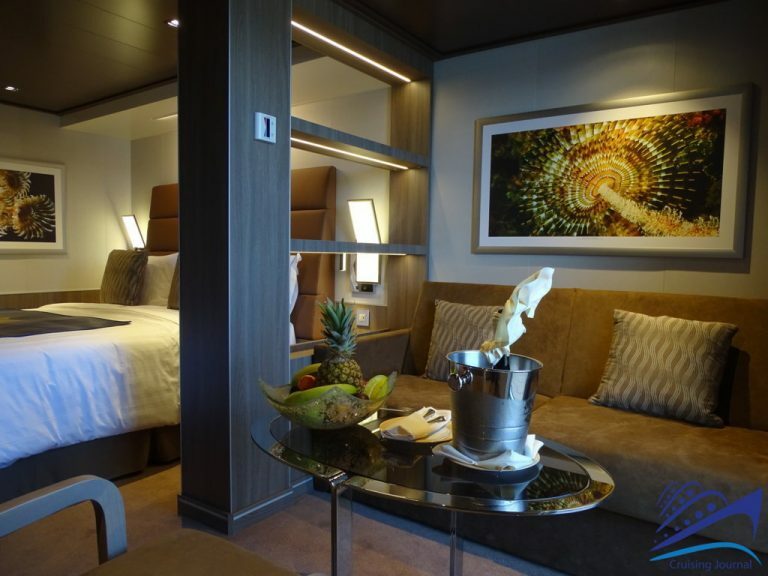 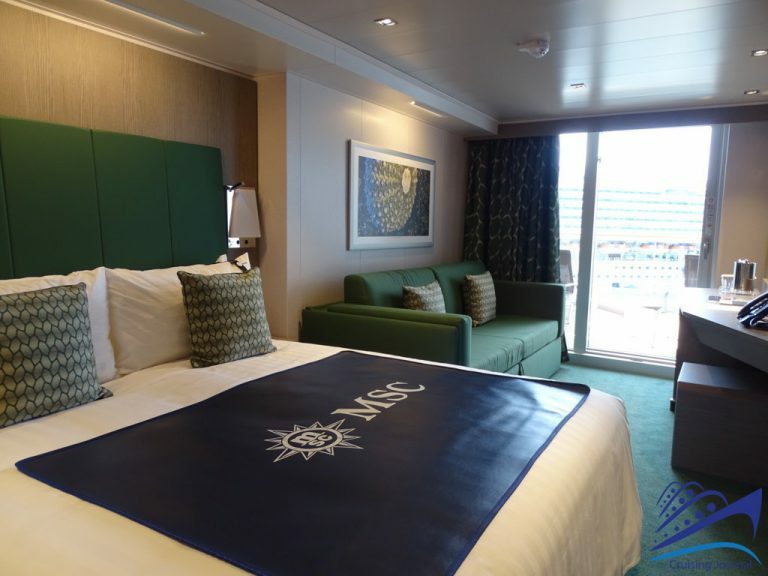 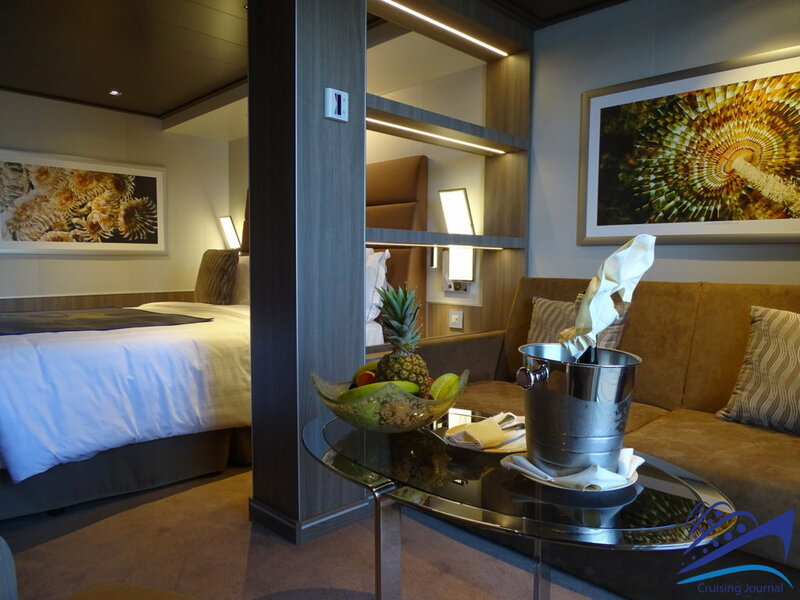 Msc Seaview offers a great selection of accommodation options designed to suit every need. 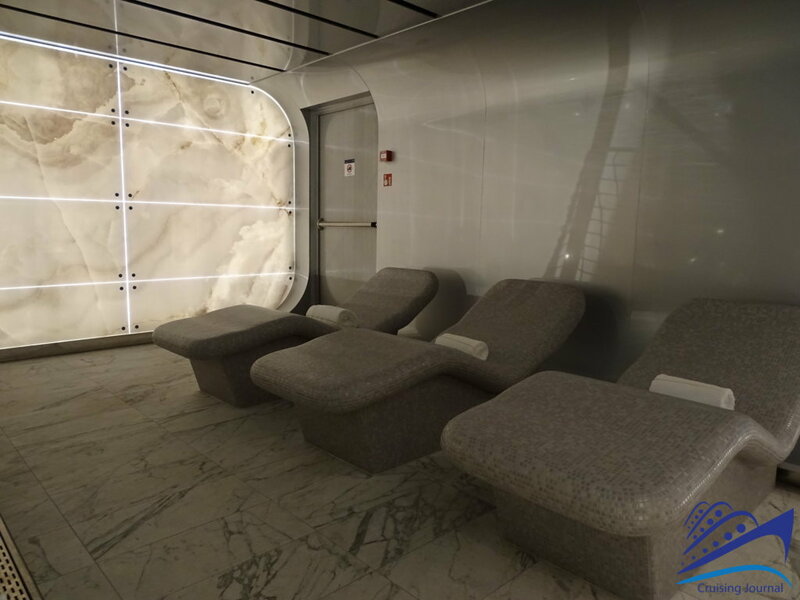 There are combinable cabins that can accommodate families of up to 10 people. 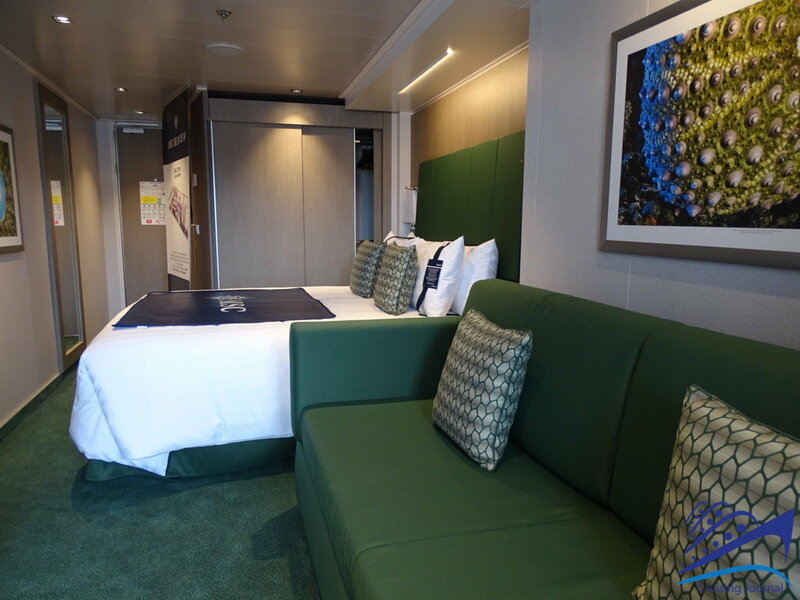 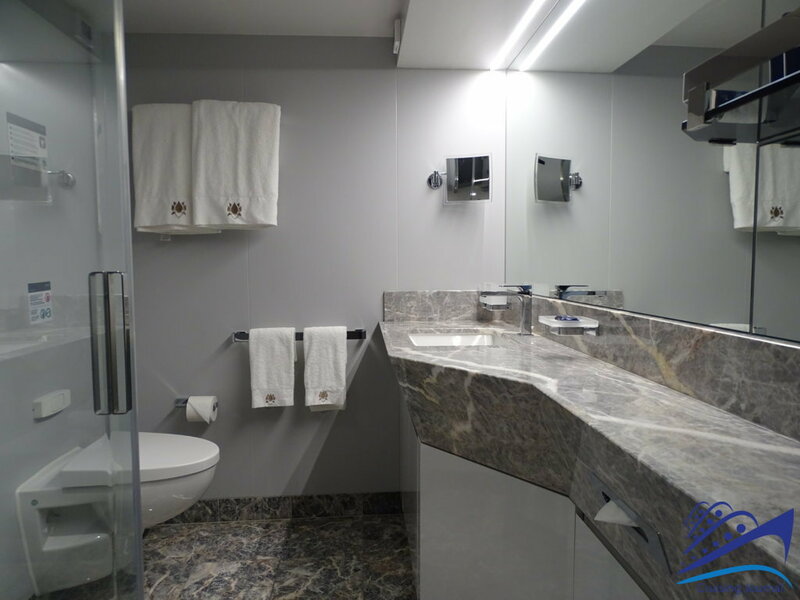 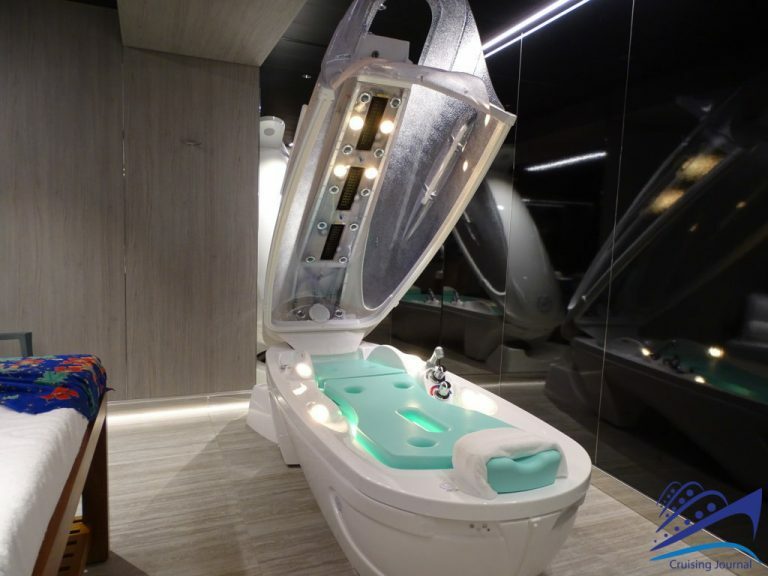 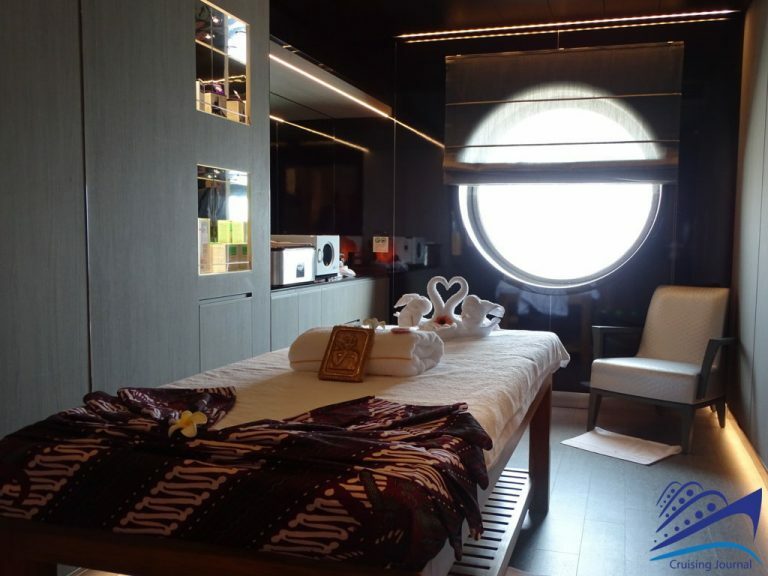 From the Suites to the inside cabins, the assortment of “experiences” available (Bella, Fantastica, Wellness, Aurea), will let you find the ideal solution to best suit your budget and tastes. 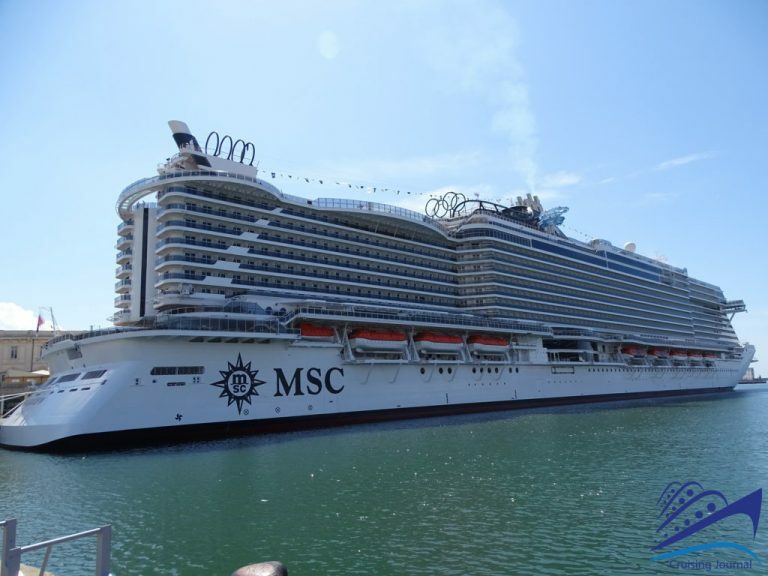 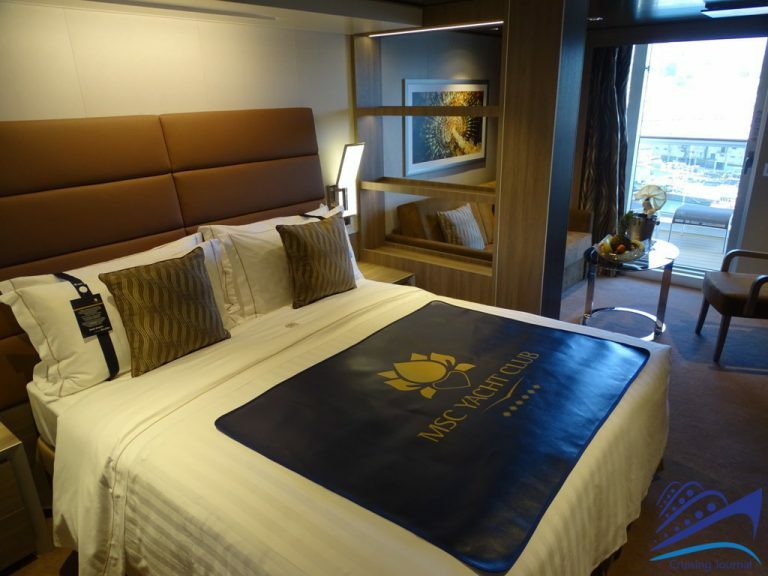 Msc Seaview represents the next-generation of huge floating resorts with a strong propensity for technological innovation and attention paid to meeting the various needs of such a large number of passengers. 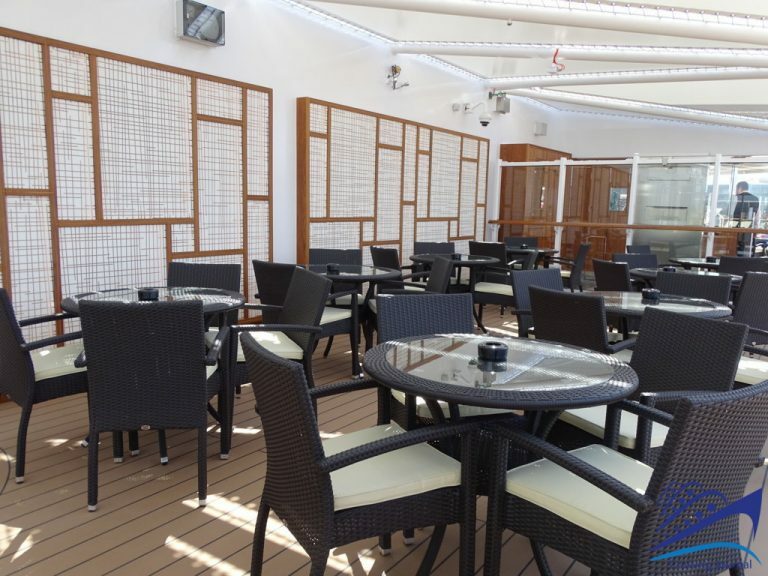 The number and diversity of venues and facilities makes it a suitable ship for everyone, even for those that are approaching a cruise vacation for the first time; and for those who demand only the best, the Yacht Club will provide them with a truly unique experience.